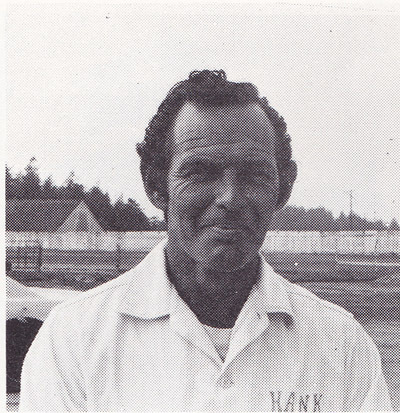 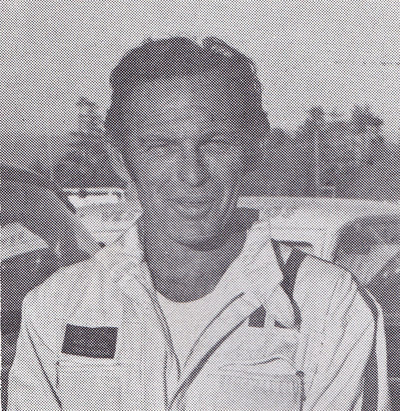 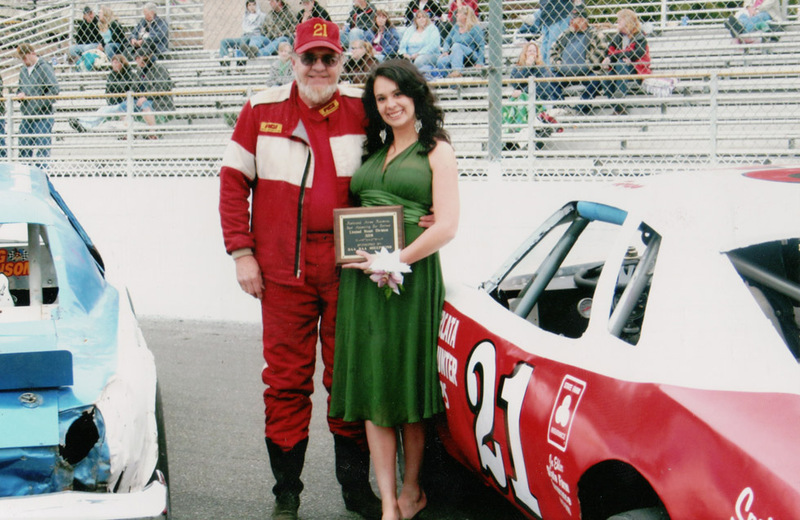 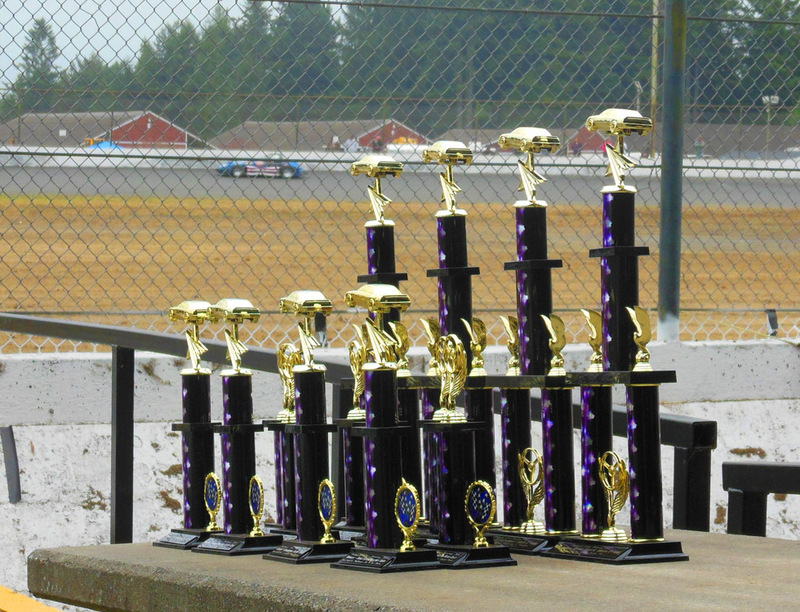 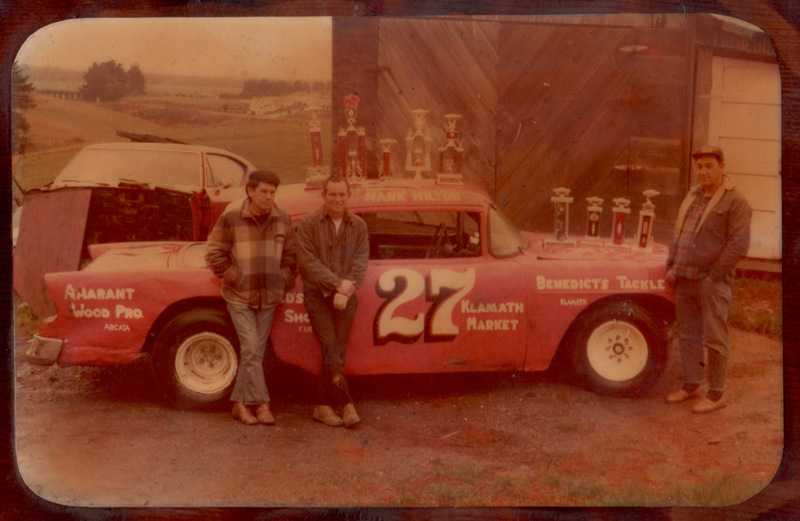 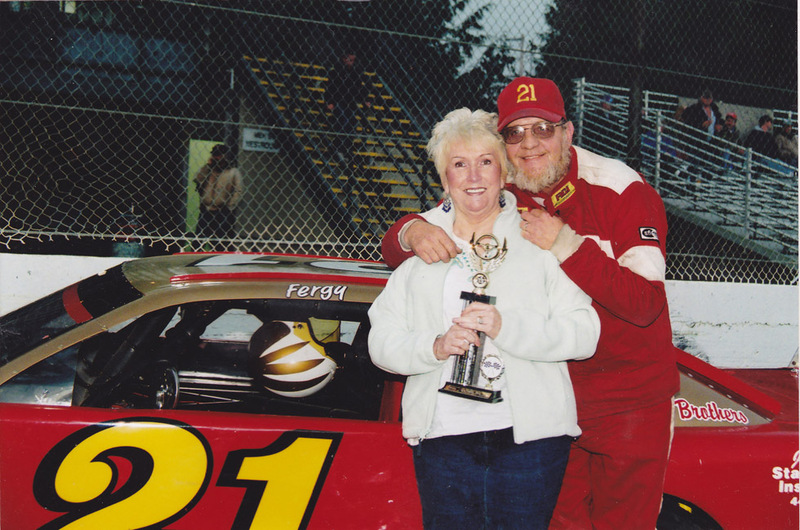 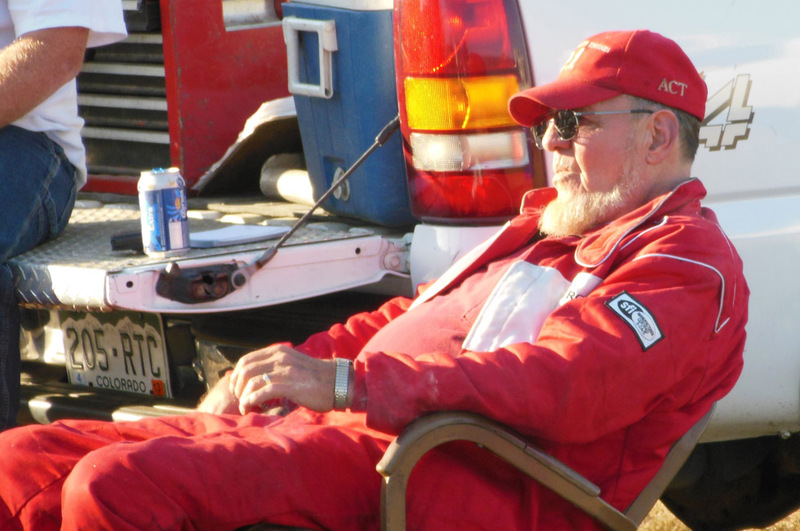 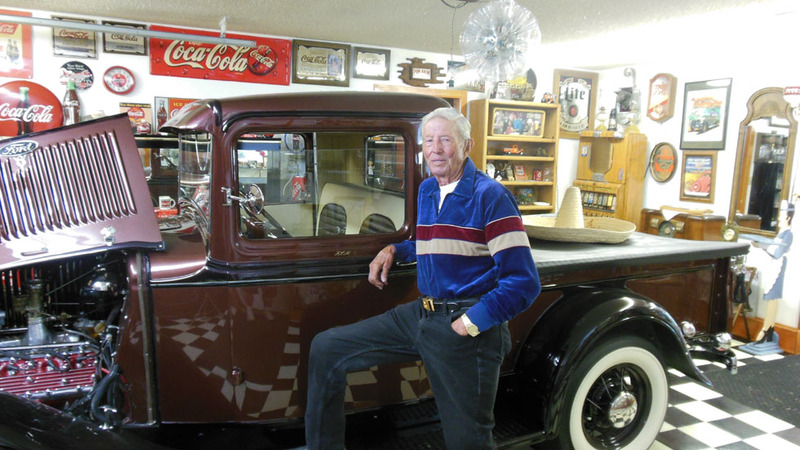 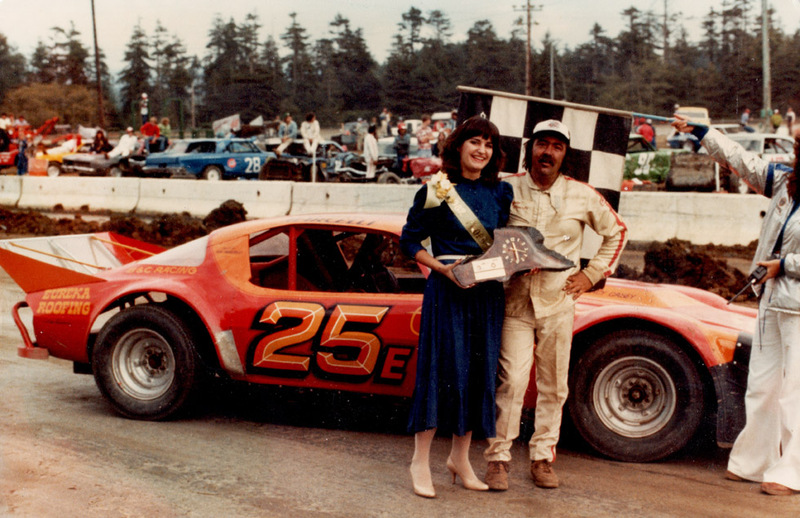 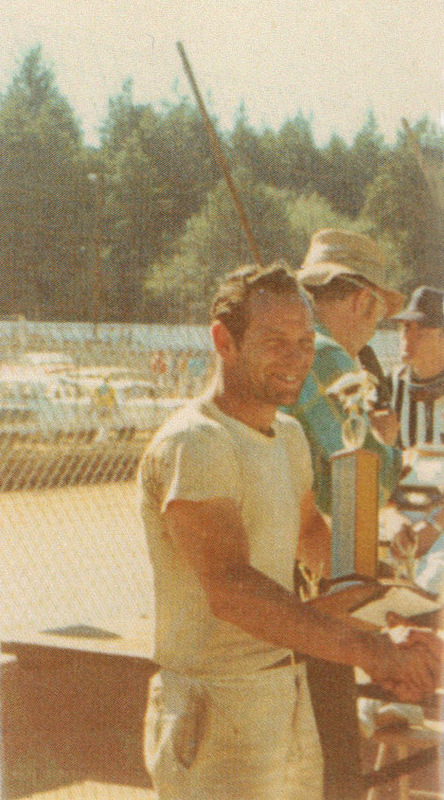 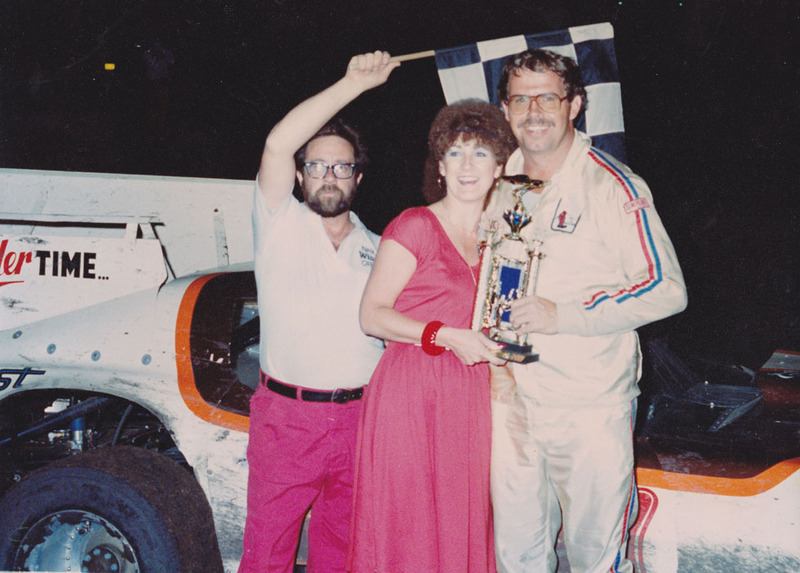 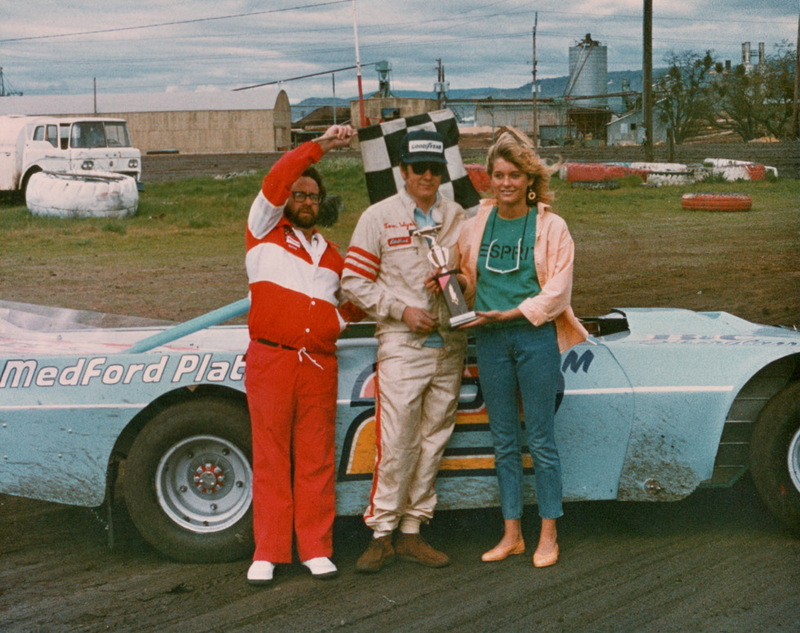 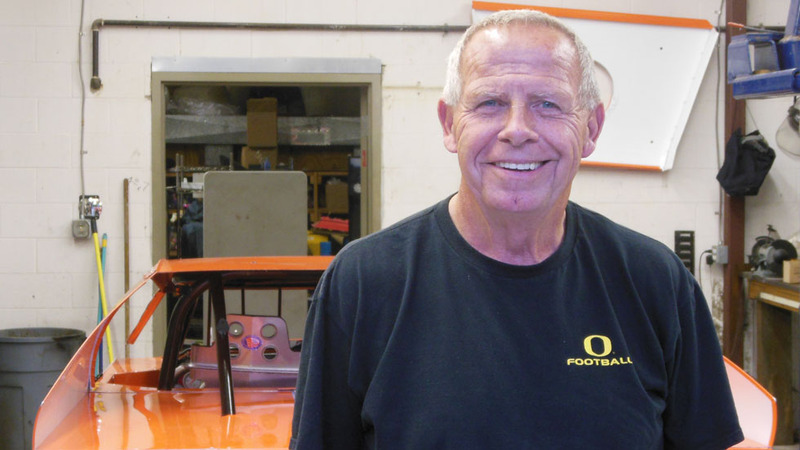 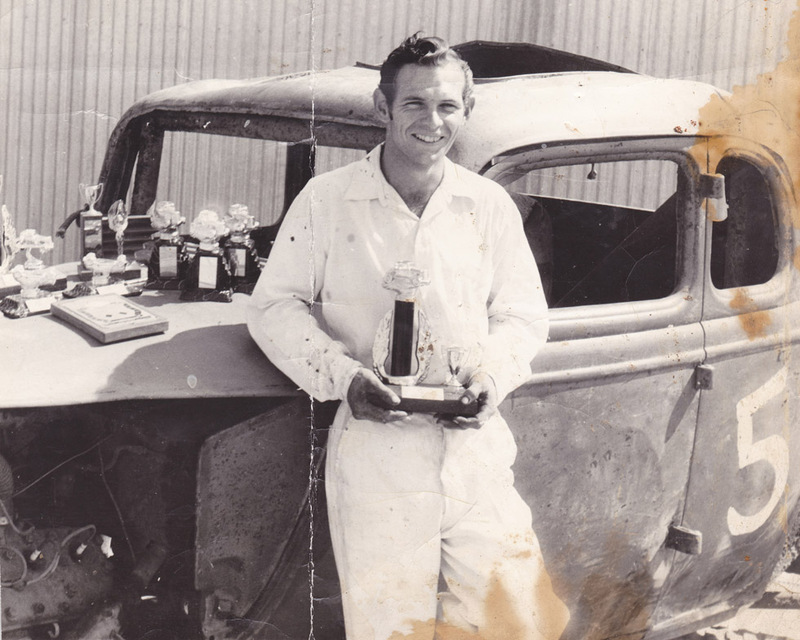 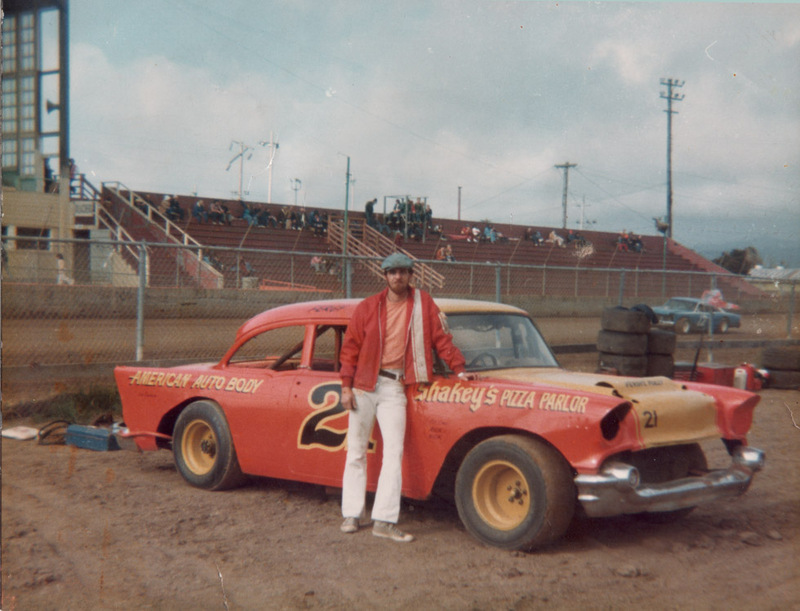 Oregon’s Dane Smith is at the top of an elite class of Pacific Northwest drivers who began racing in the golden era of the 70s. 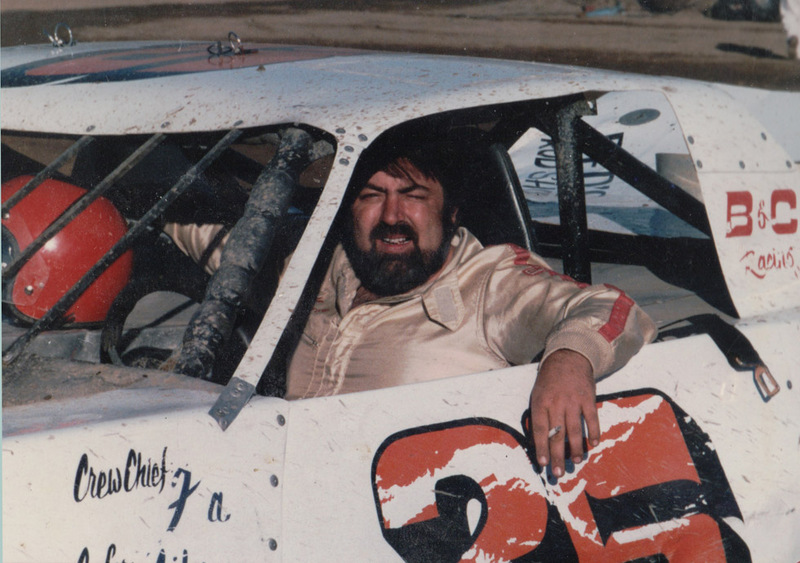 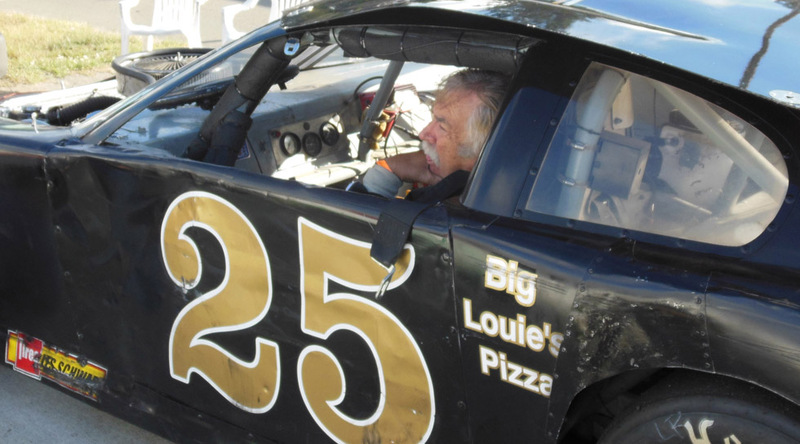 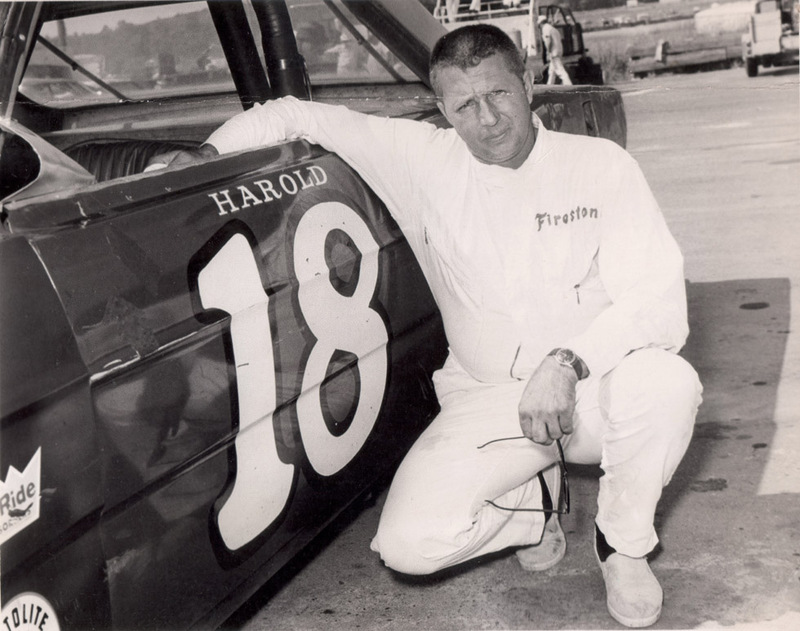 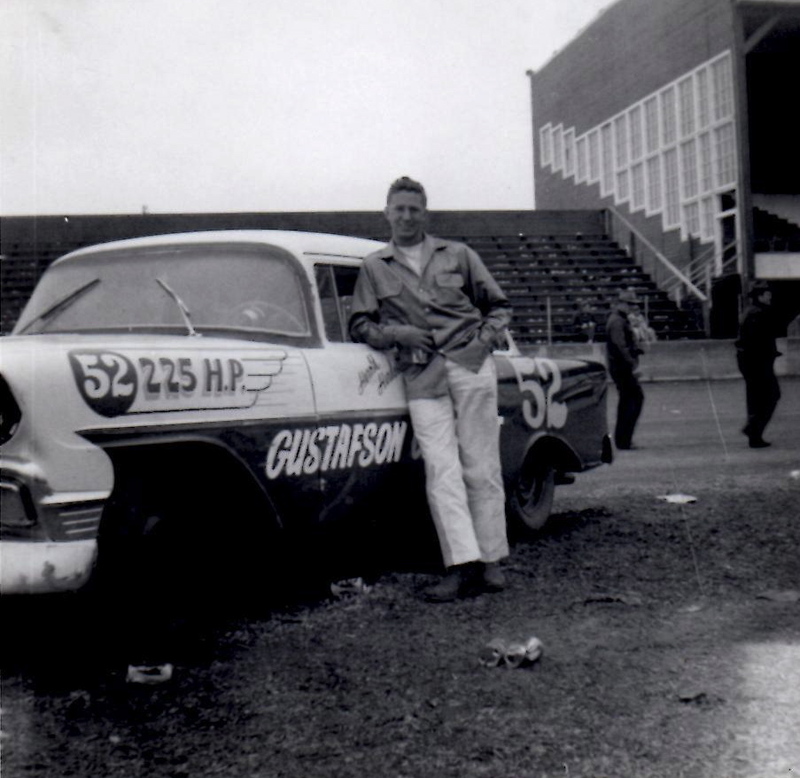 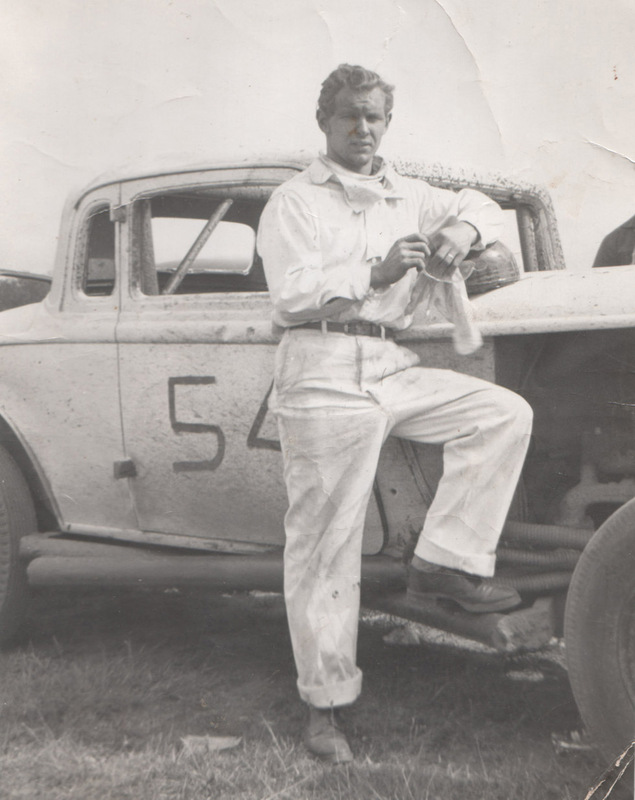 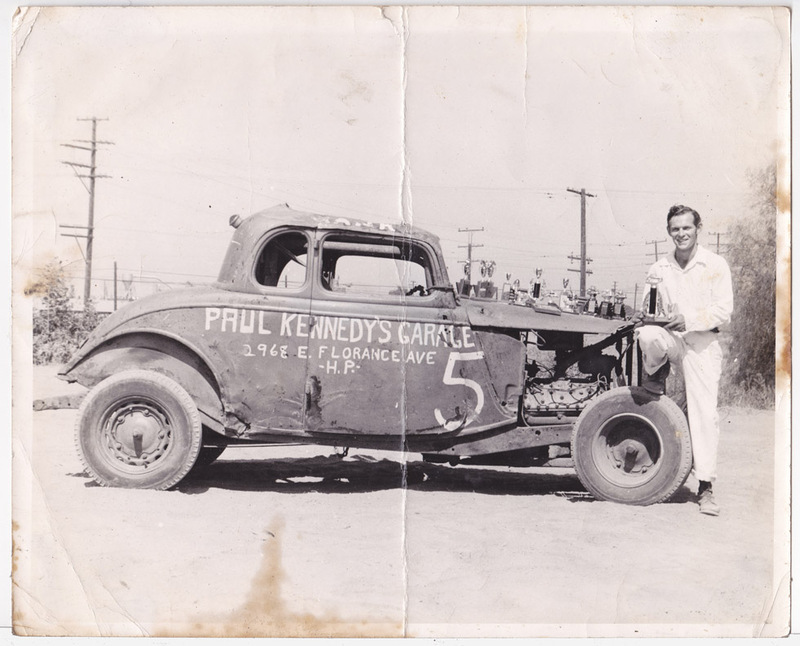 Regularly traveling to races from Washington to California and Nevada, he made a name for himself as the man to beat when he came to your track during those Saturday night shootouts. 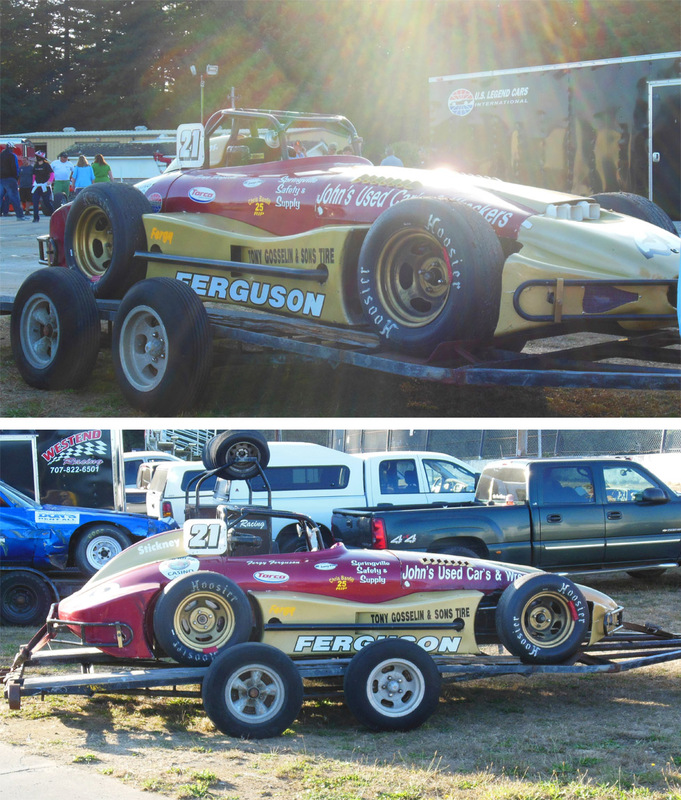 When Dane was in town, the local boys would have a battle. 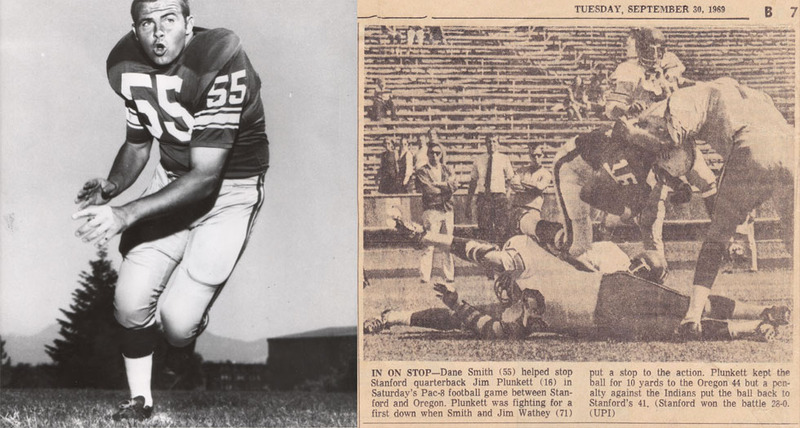 #55 Dane Smith LB for Oregon gets in on a tackle of Stanford’s future Heisman Trophy winning QB Jim Plunkett in a September 1969 loss at Stanford. 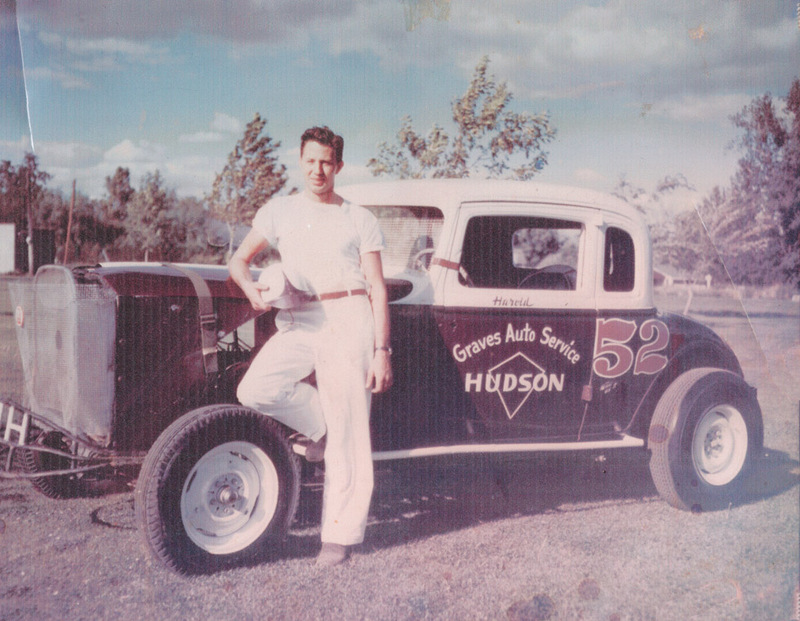 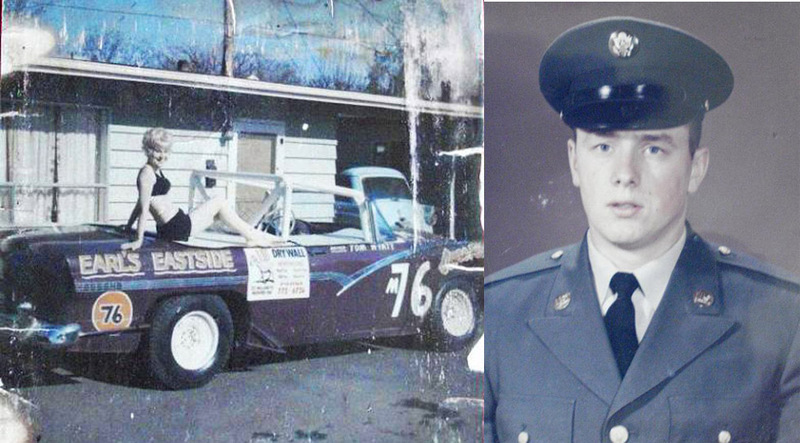 “The ’57 Chevy, that was my first race car”, Dane says. 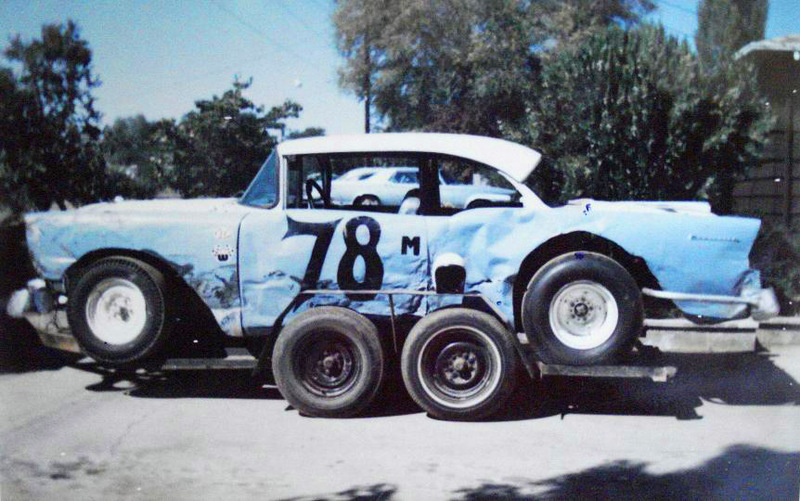 “That’s the one I paid $600 for, ‘race ready’. 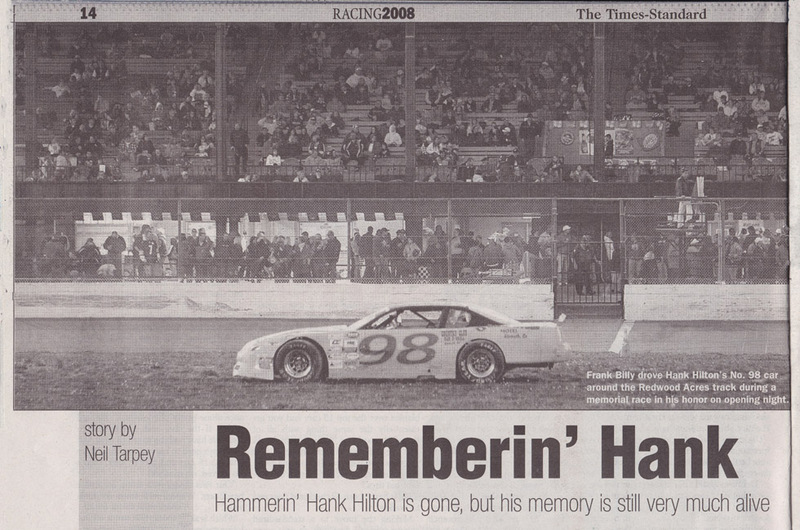 I’ll never forget- I got ready to race and the battery was dead, and I think I had to pay $33 for a battery and I didn’t know where I was going to get the money. 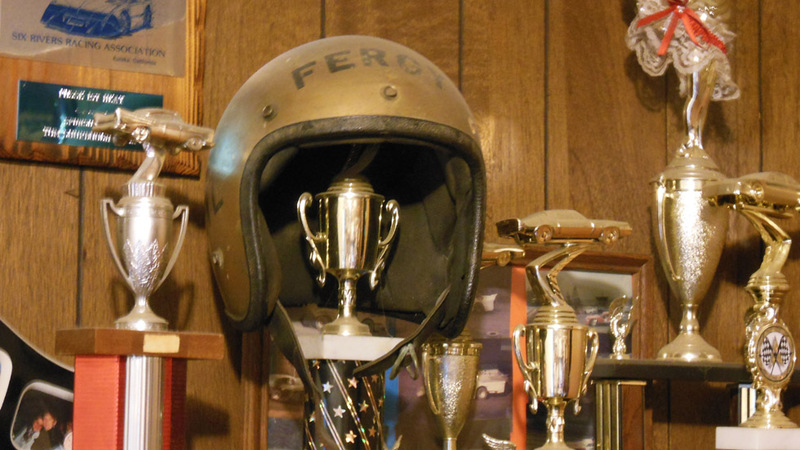 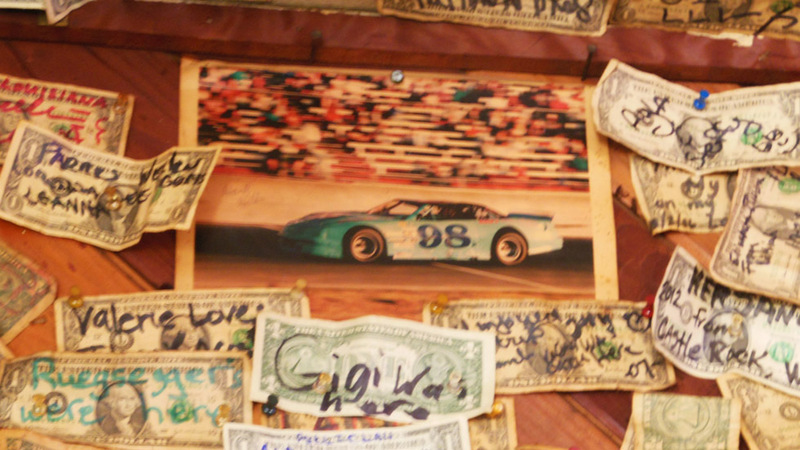 Now a helmet costs more than that car cost.” The car number – #86 – was a sly reference to his bar & grill; “as in ‘getting eighty-sixed’ from the bar”, he says. 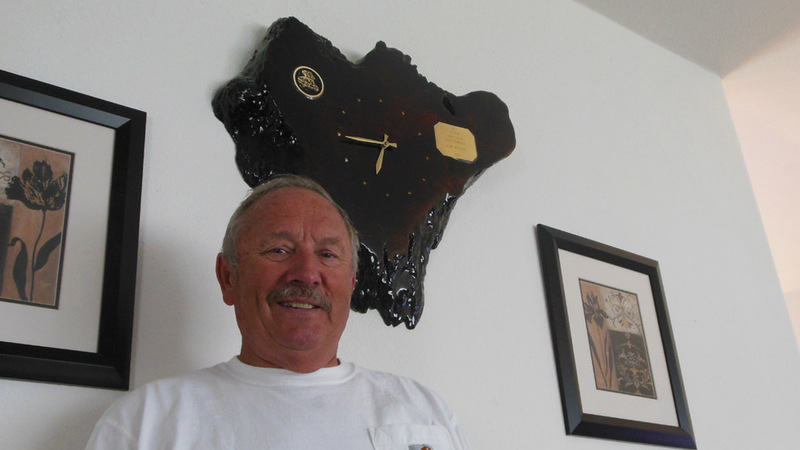 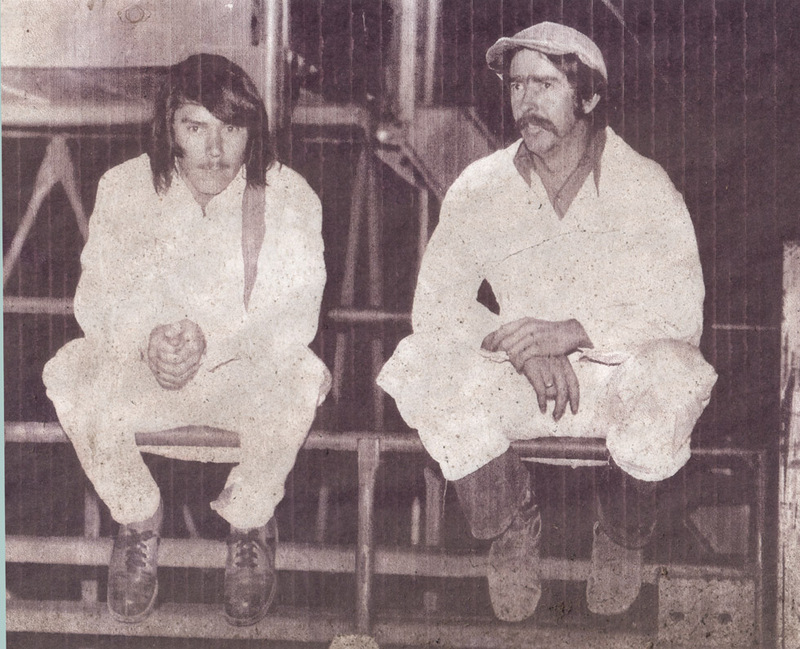 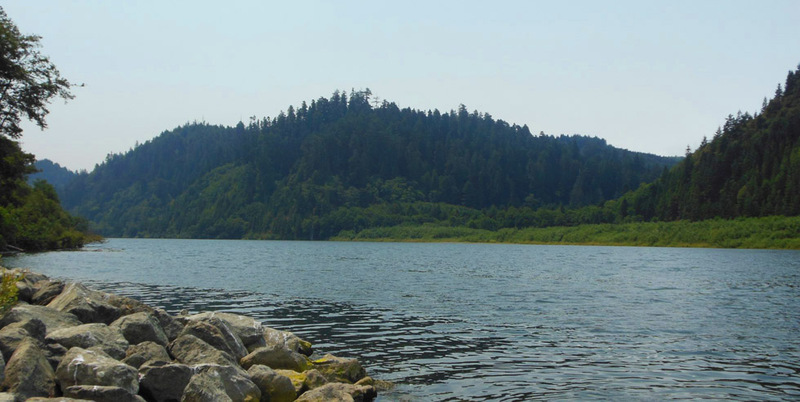 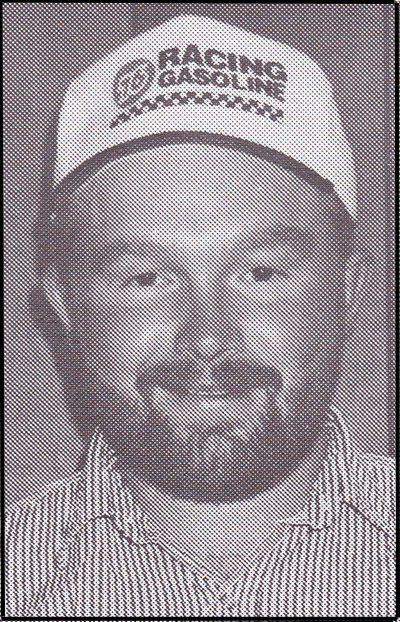 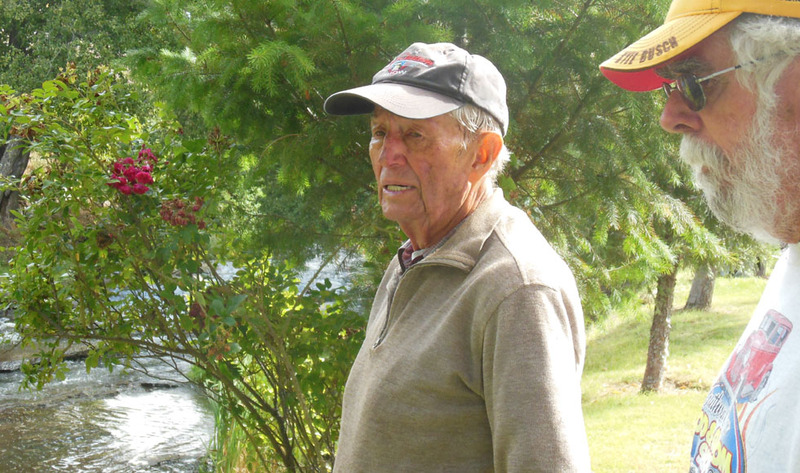 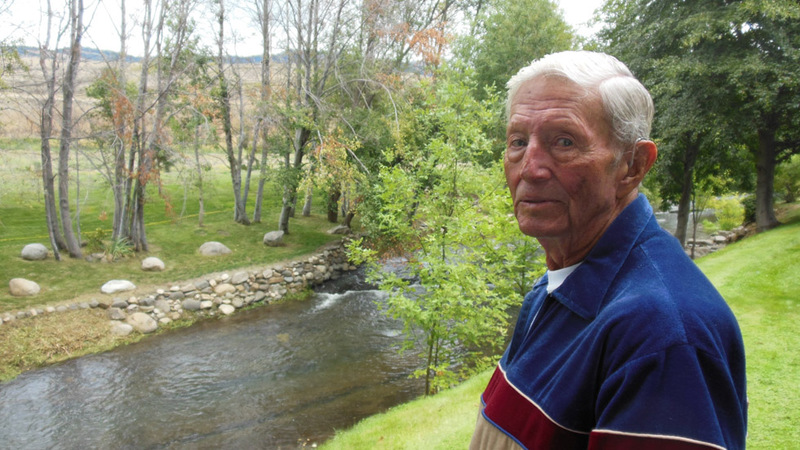 A 300 bowler, a 3 handicap golfer at Rogue Valley Country Club, who in 1985 while the Medford High golf coach hit a double eagle during a tournament at Oak Knoll – a trait handed down to his son, Tom, who at age 13 hit a double eagle at Rogue Valley four years earlier. 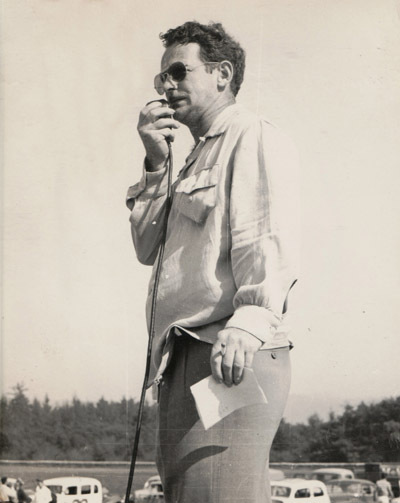 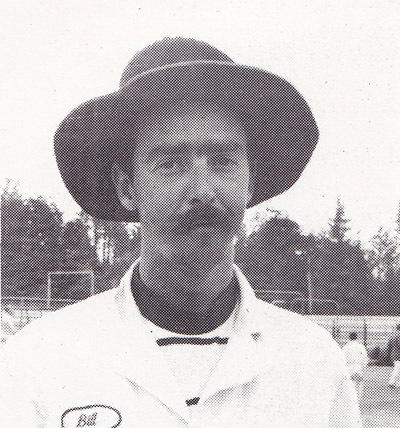 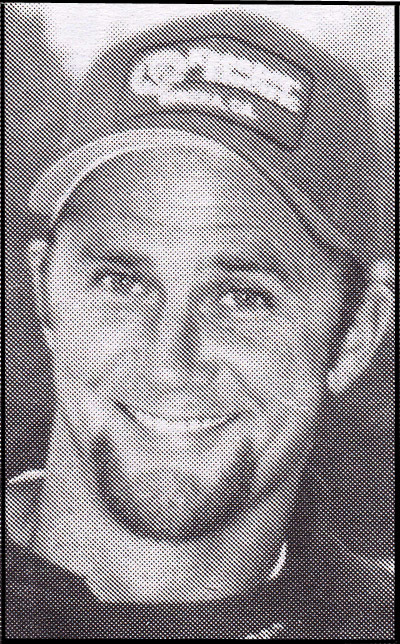 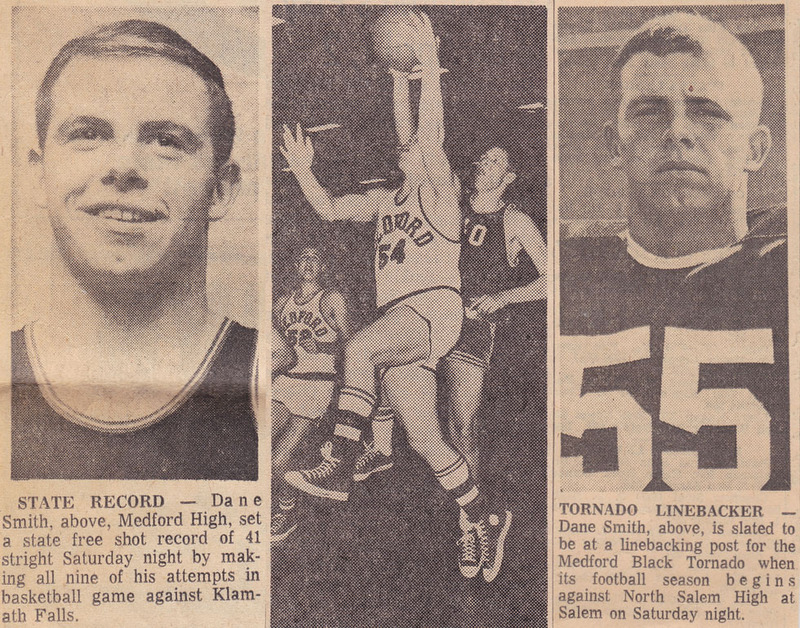 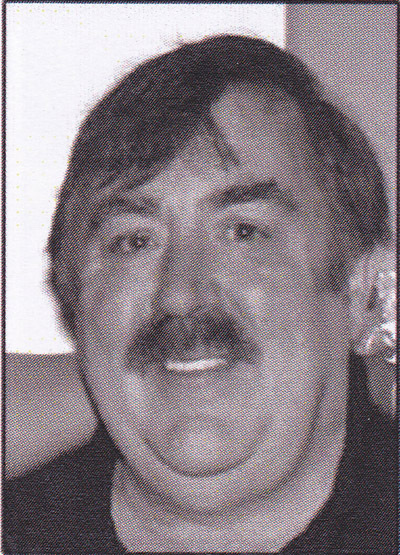 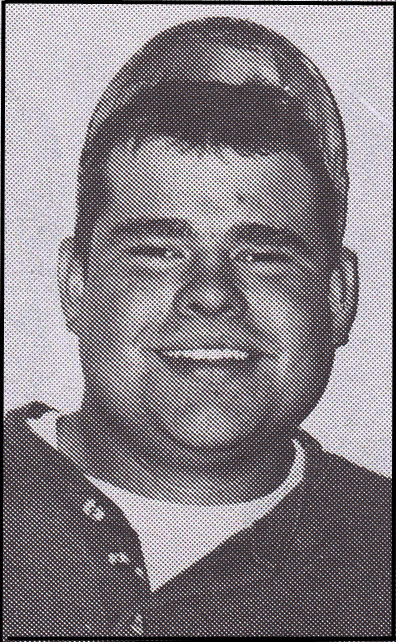 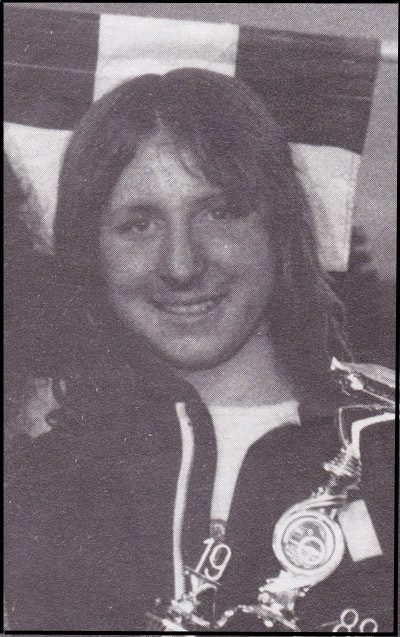 In the town’s centennial year of 1985, Dane was inducted into the Medford Sports Hall of Fame. 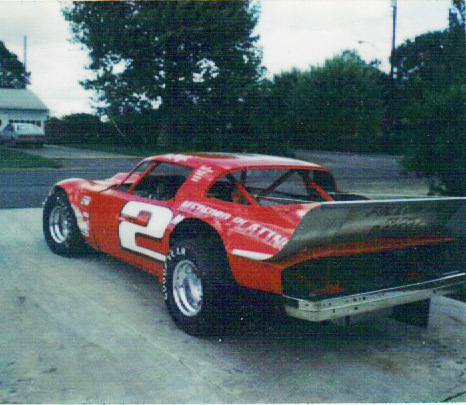 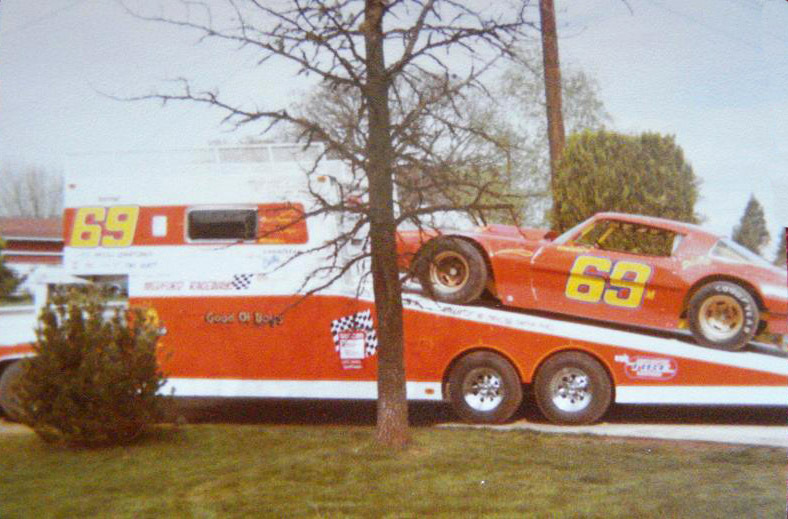 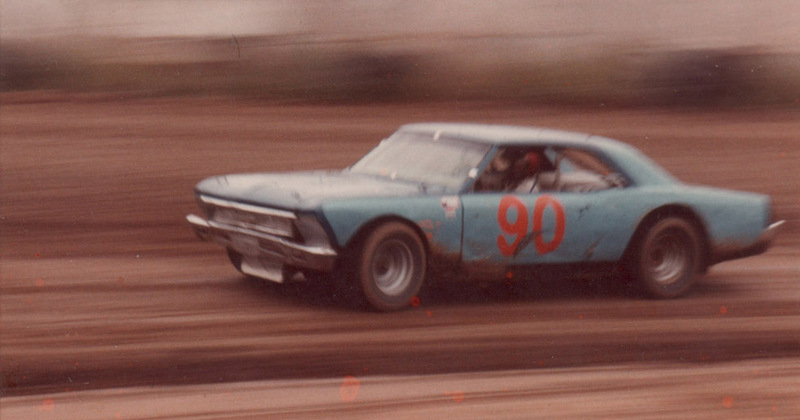 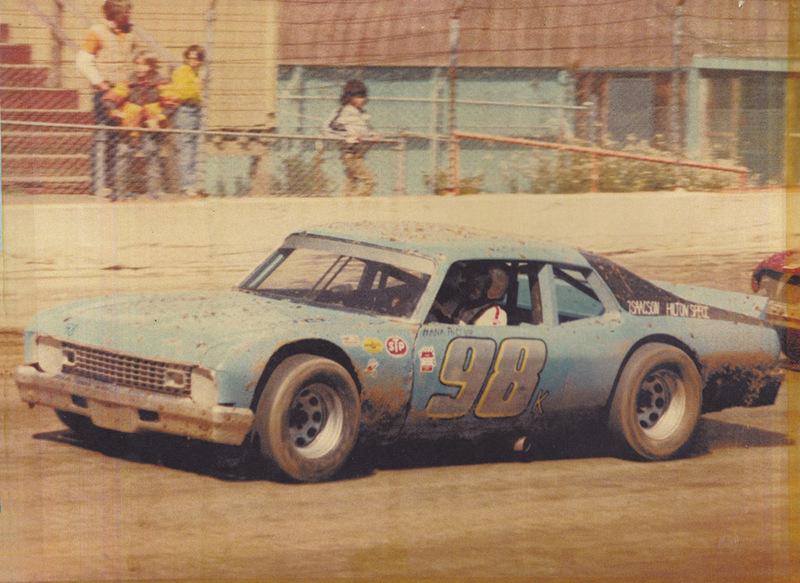 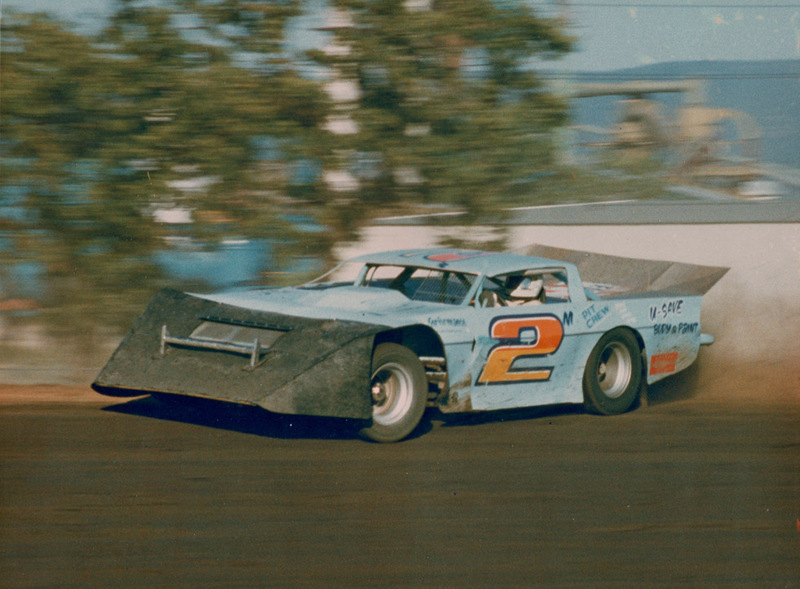 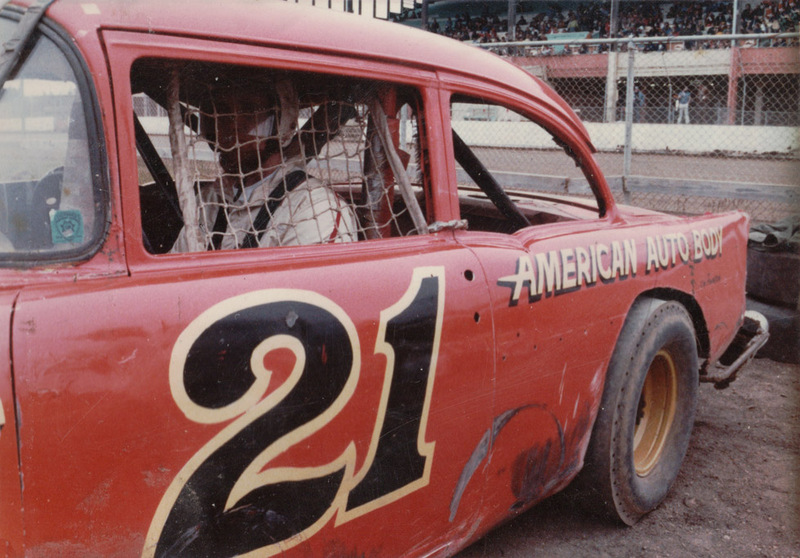 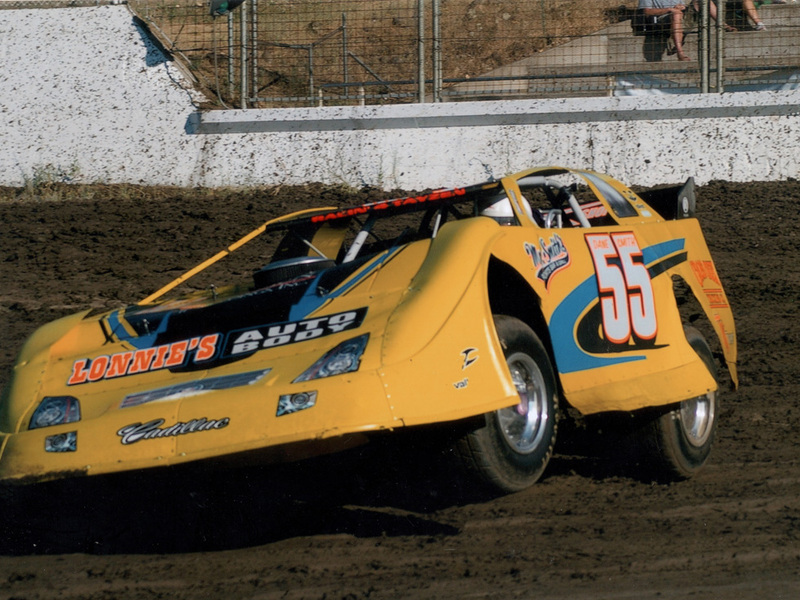 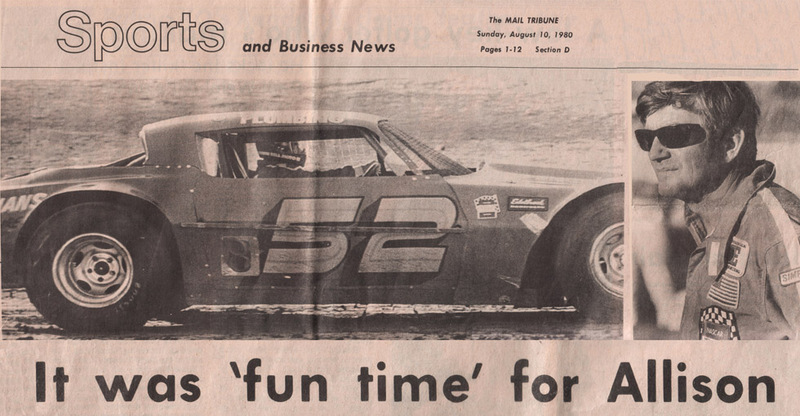 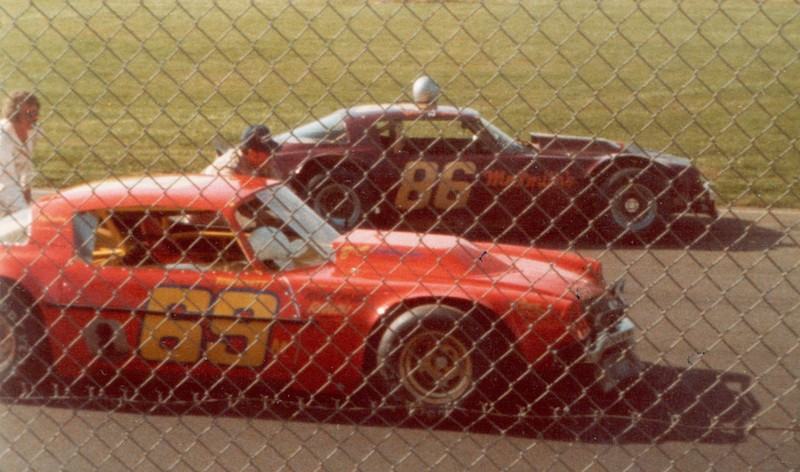 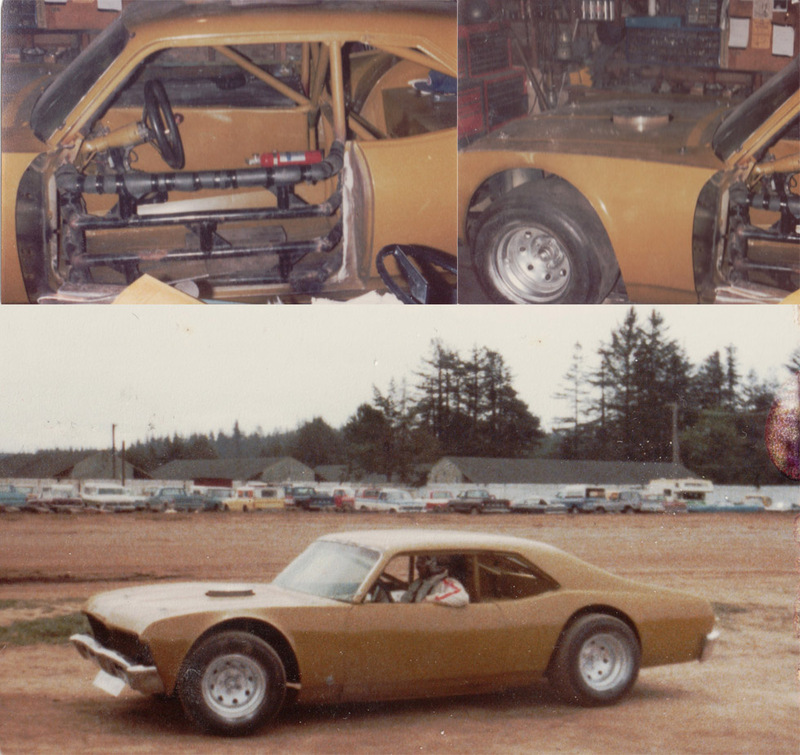 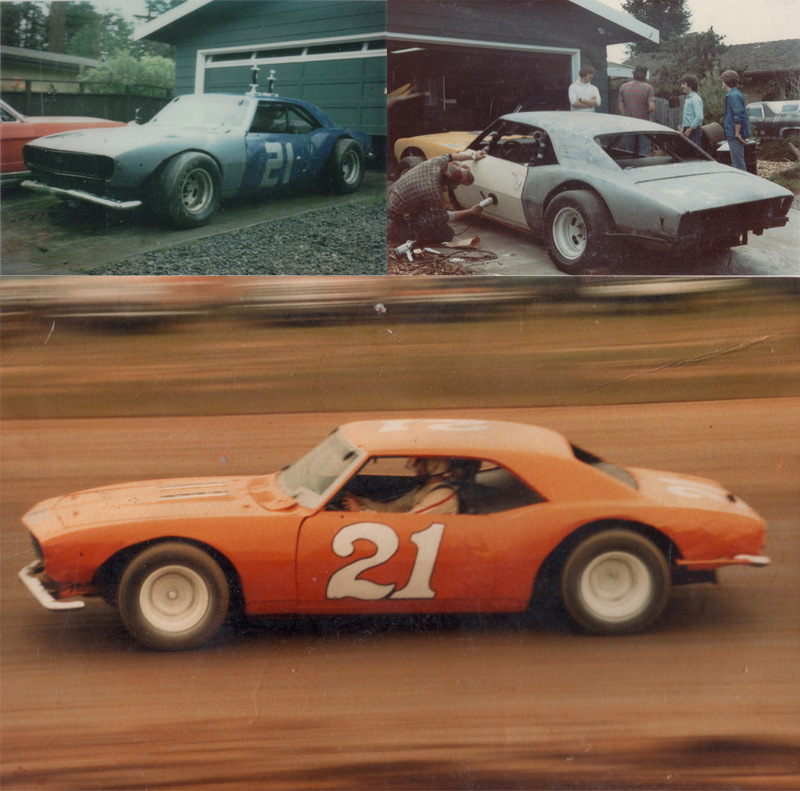 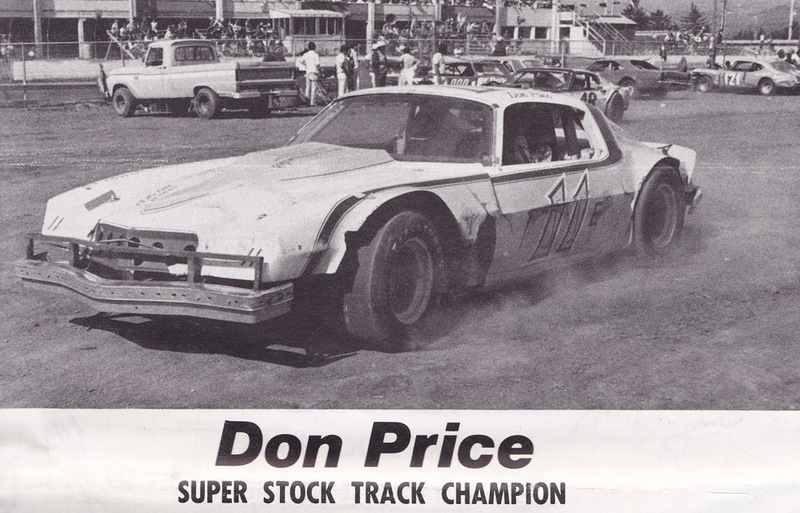 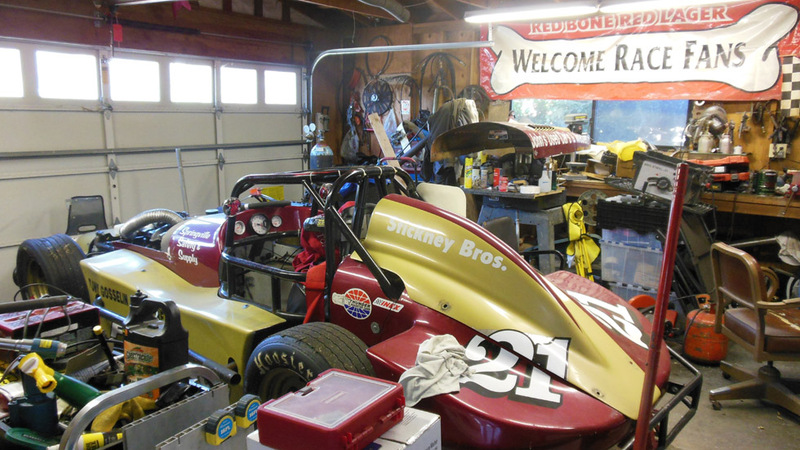 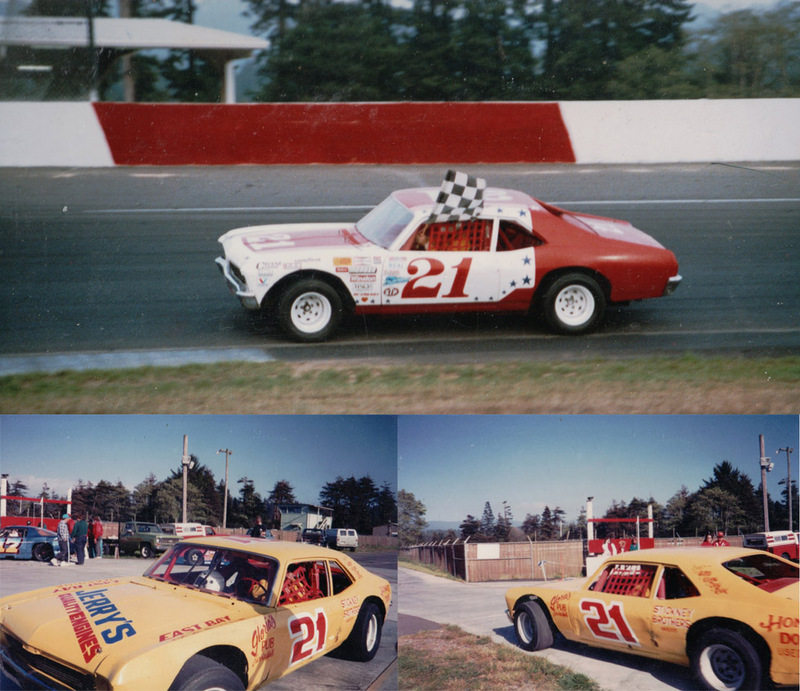 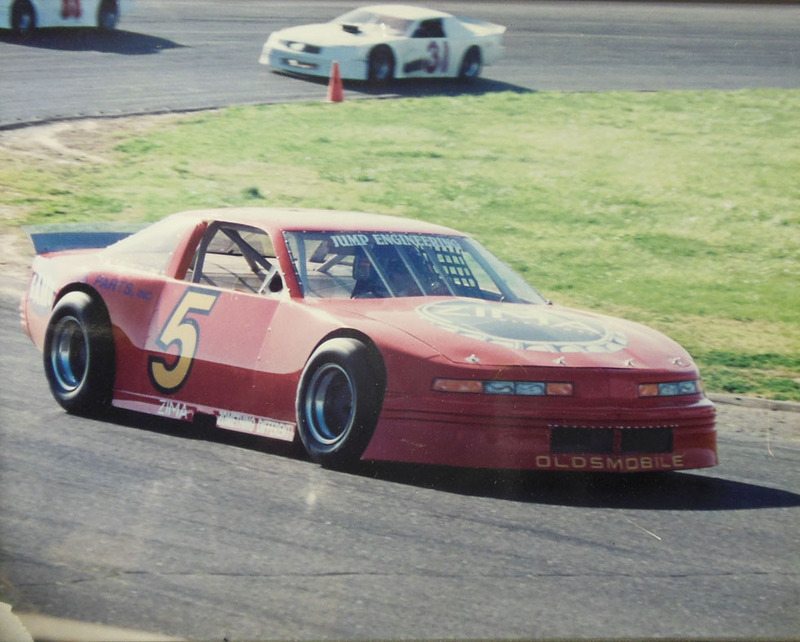 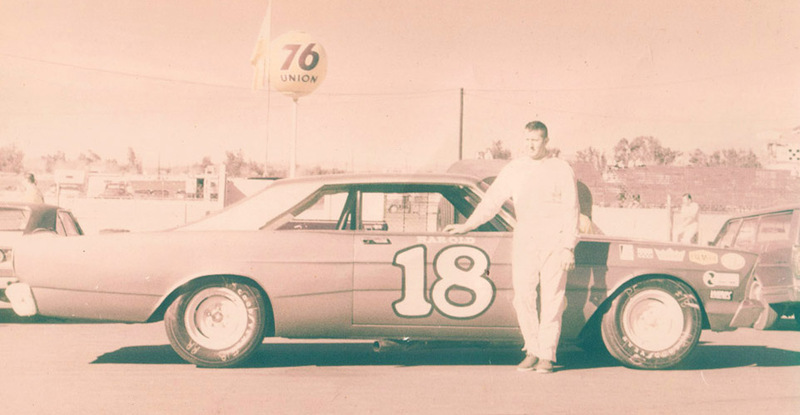 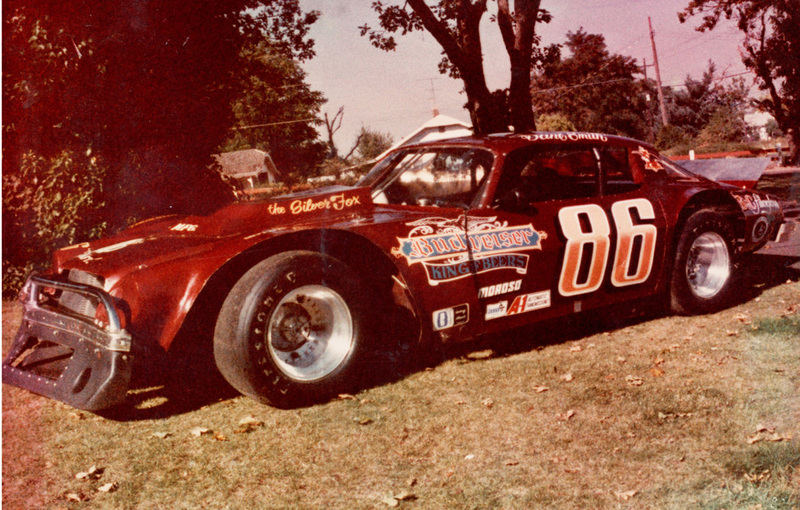 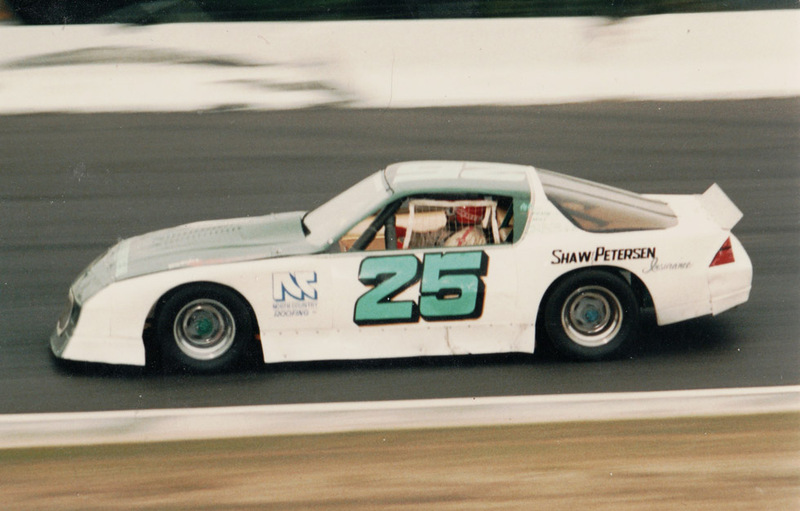 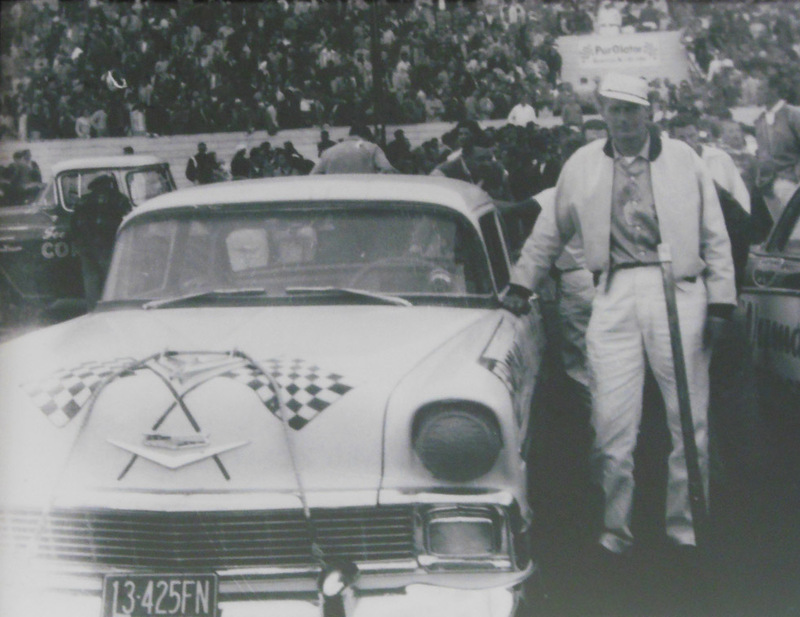 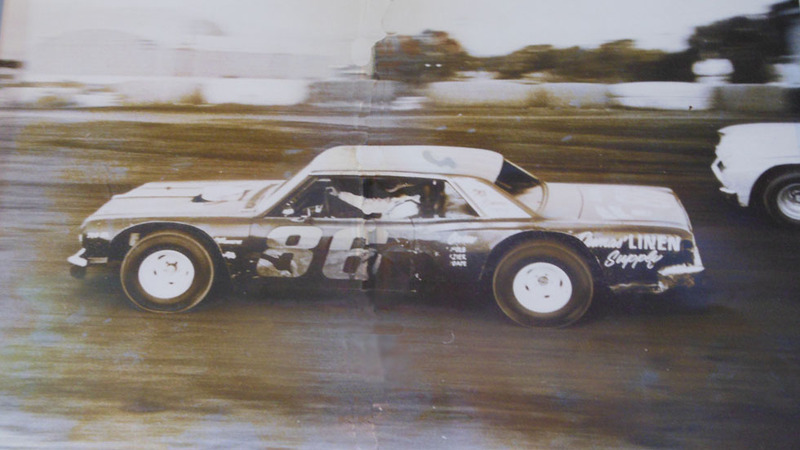 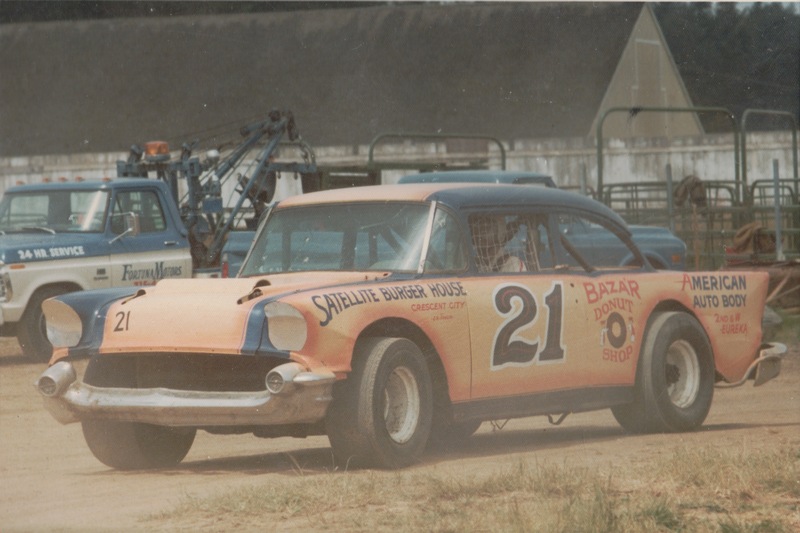 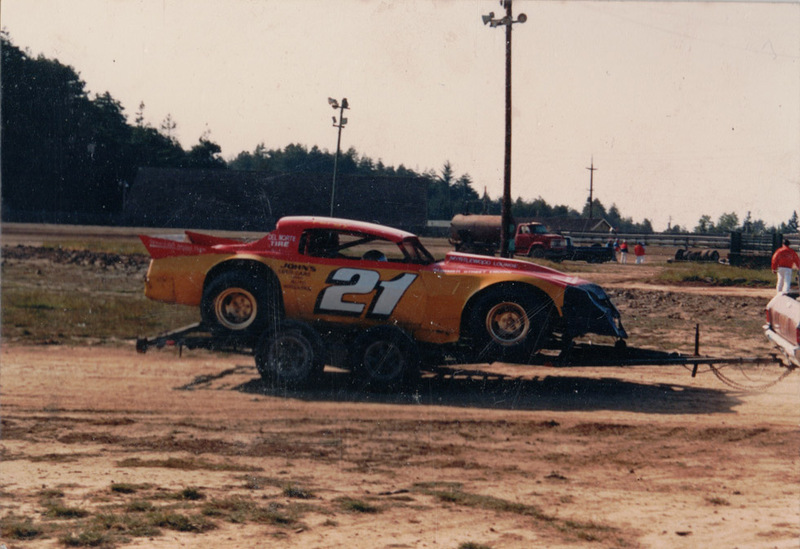 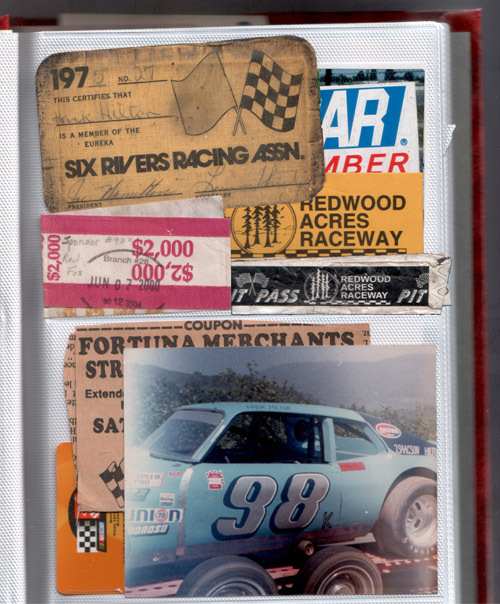 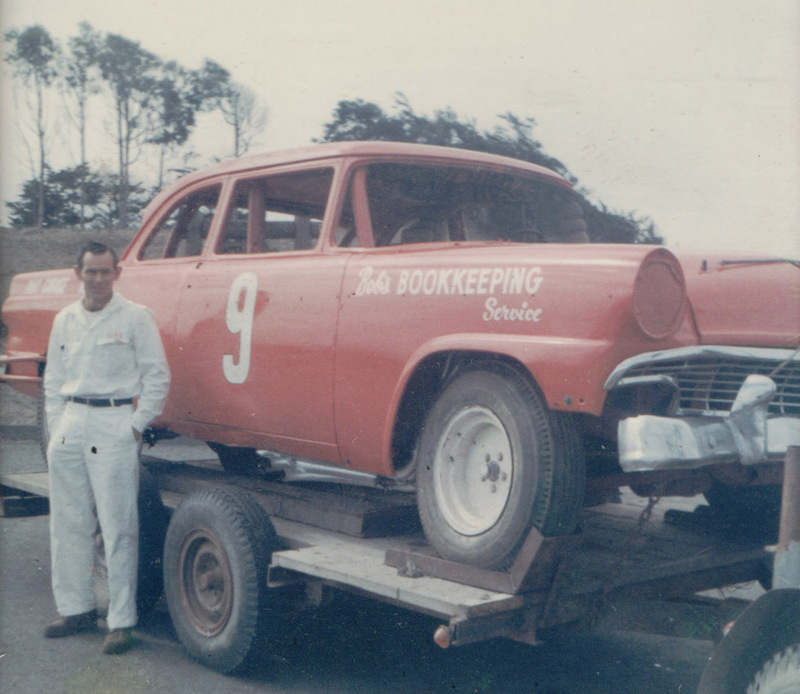 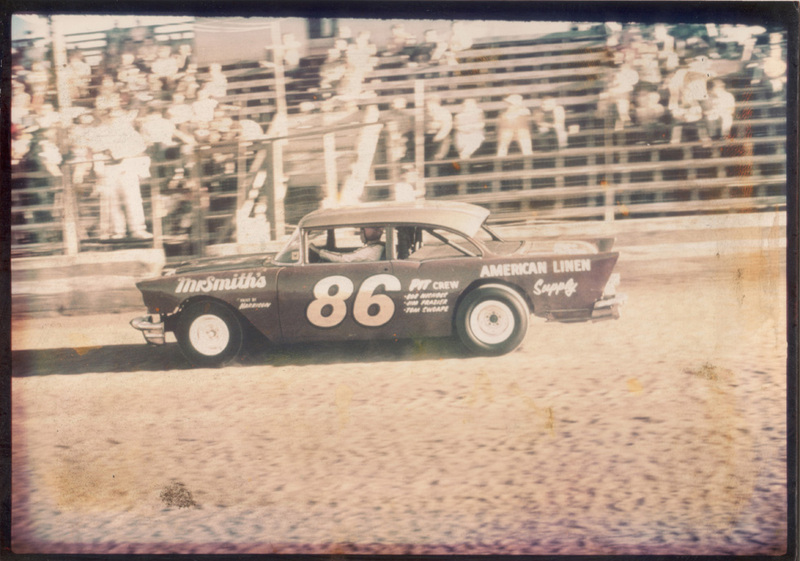 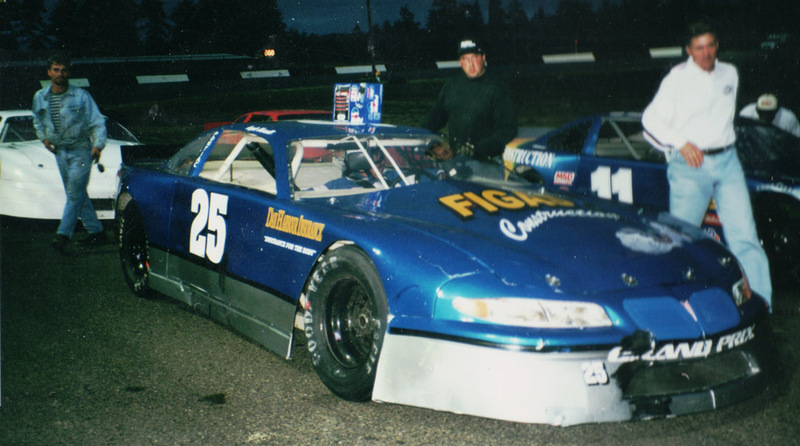 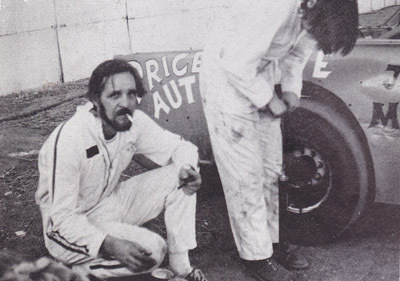 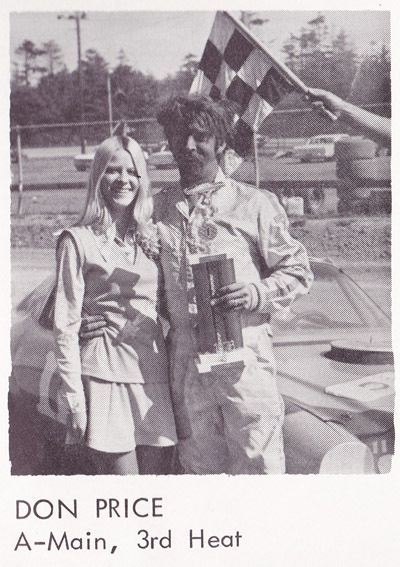 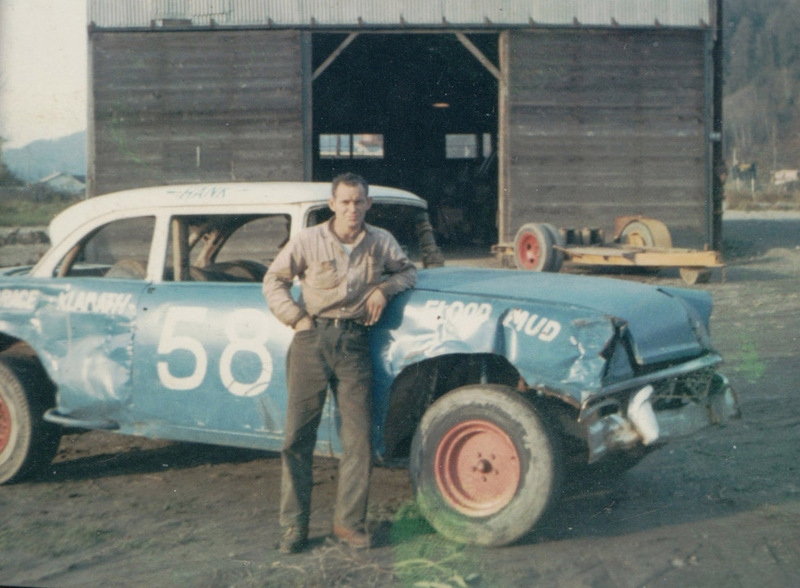 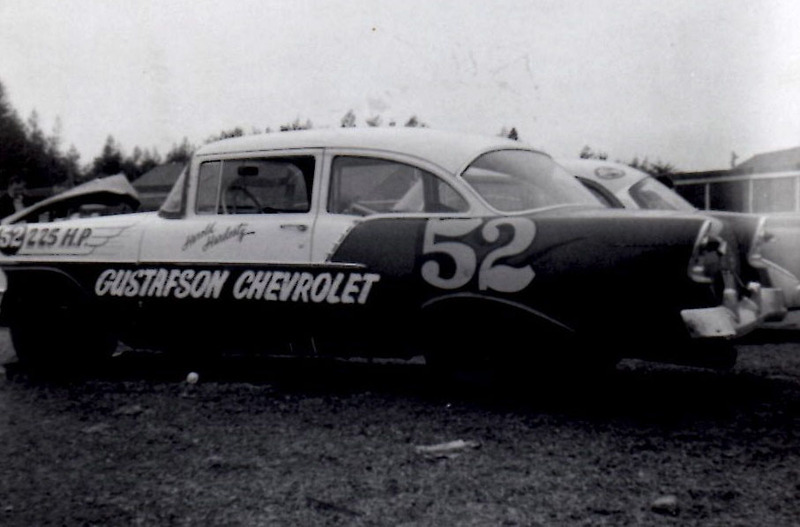 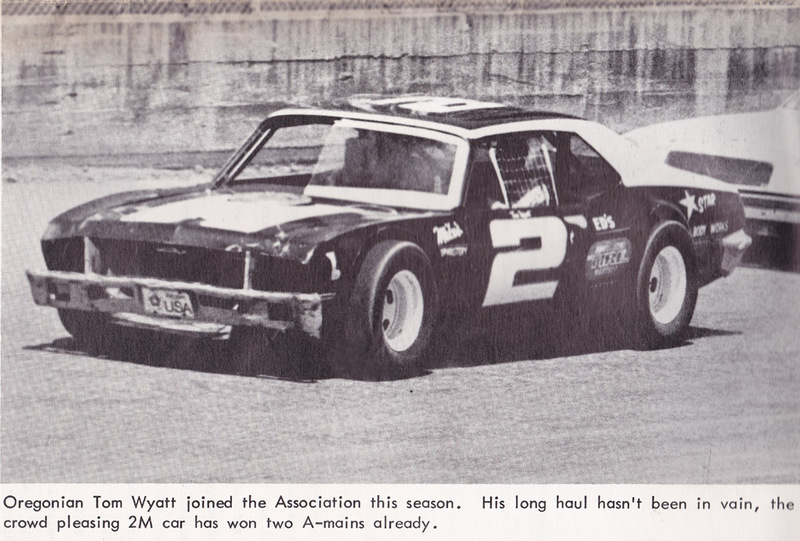 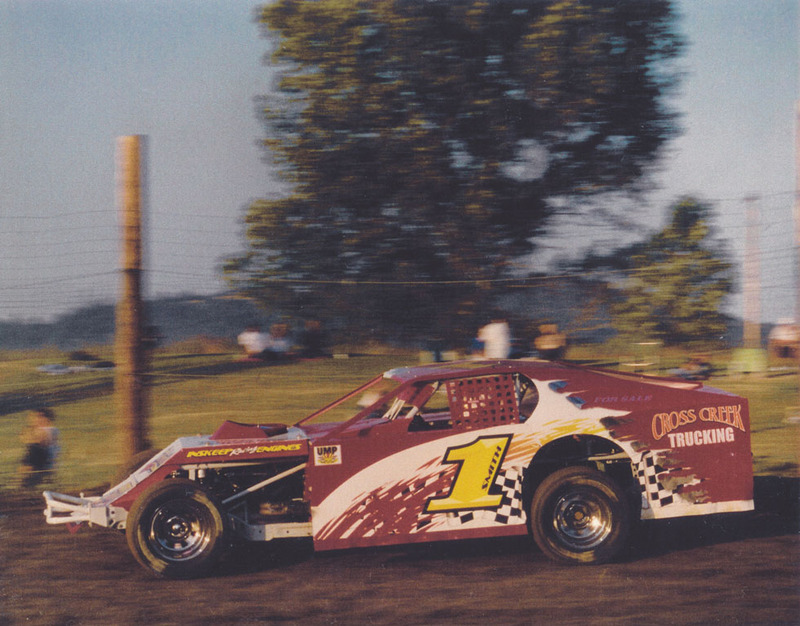 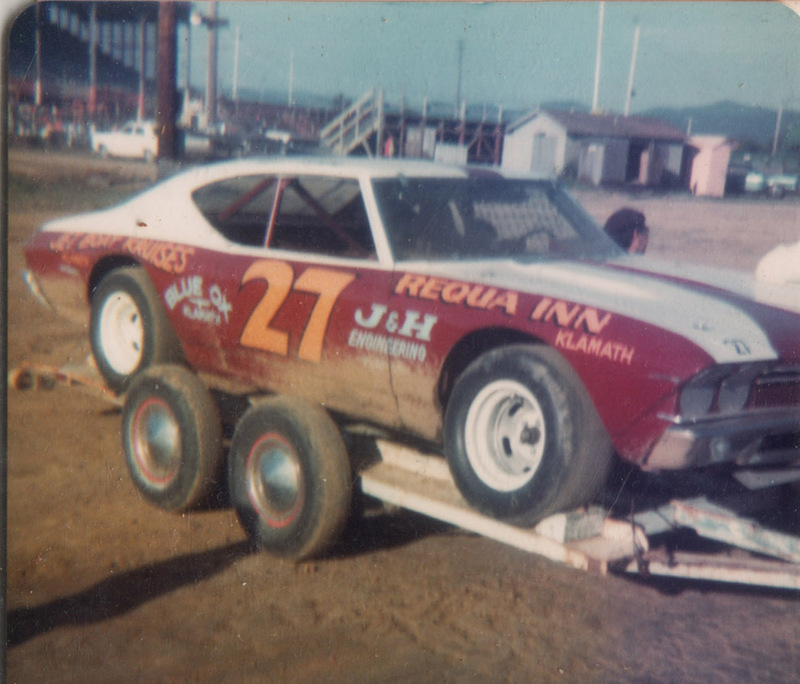 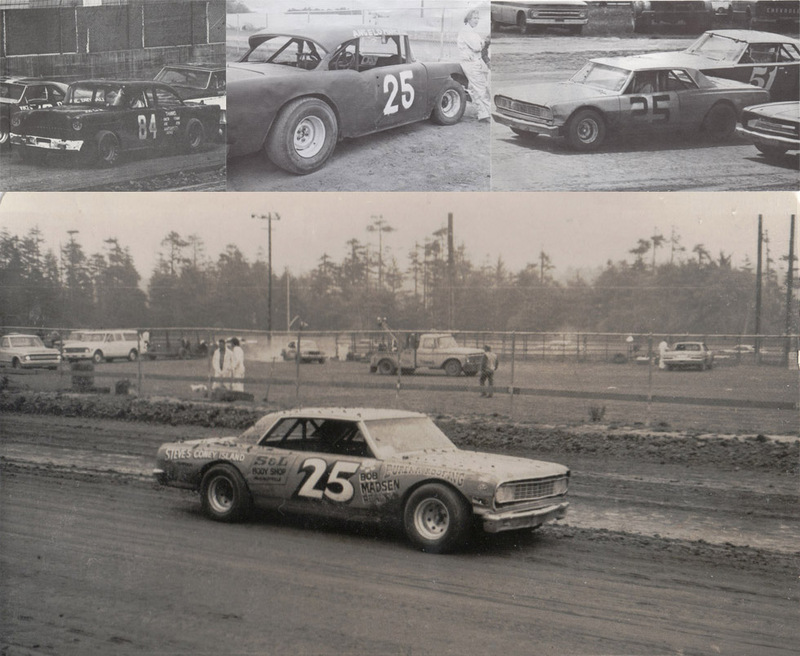 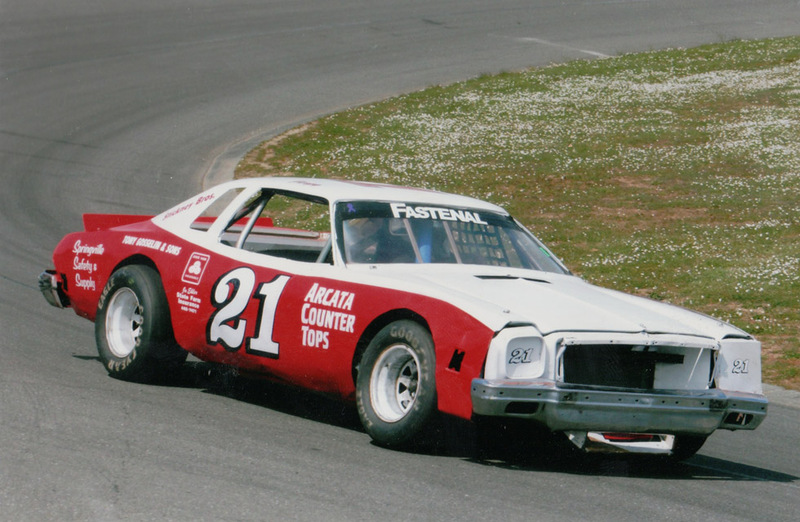 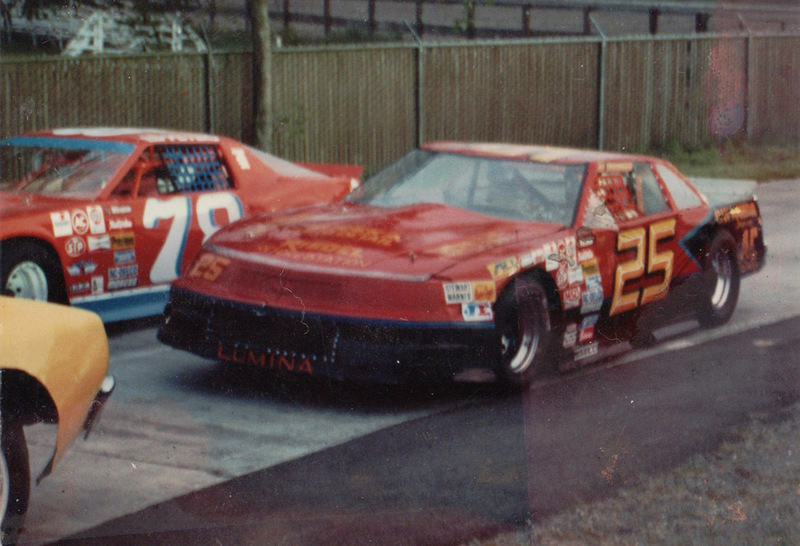 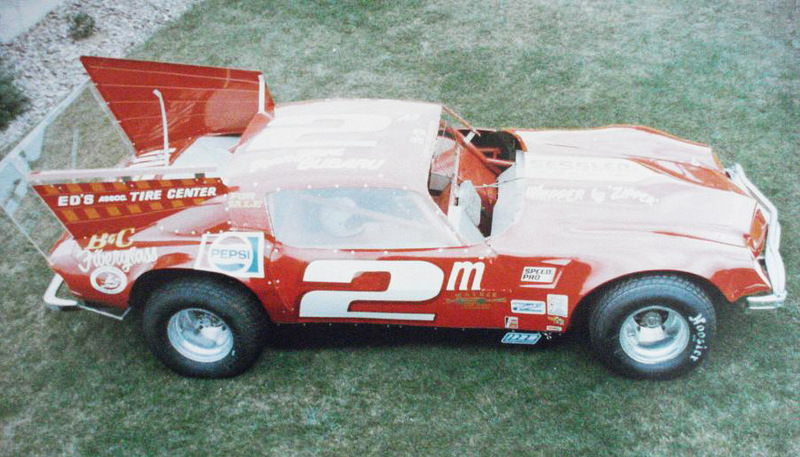 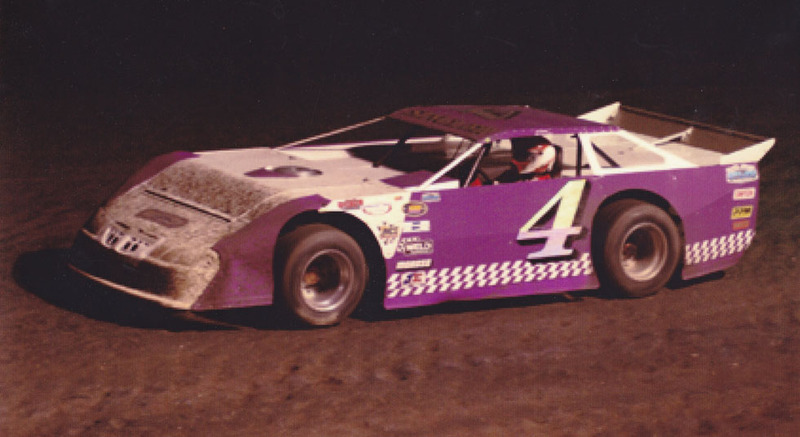 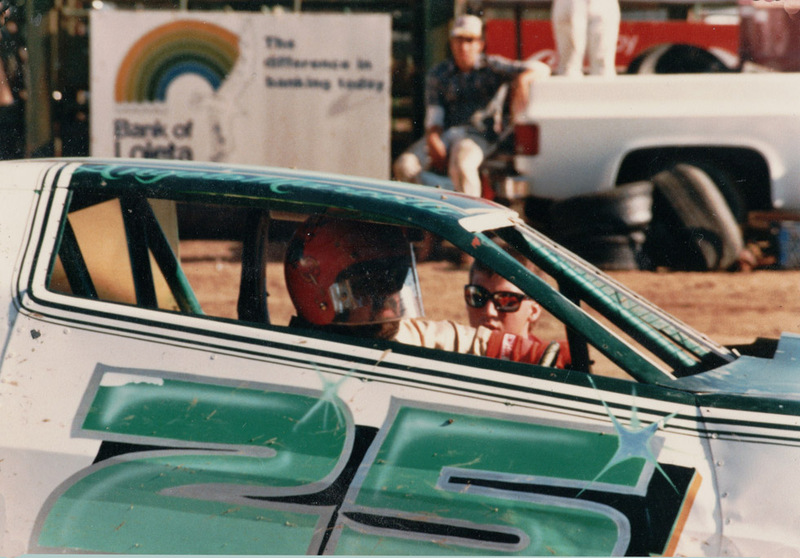 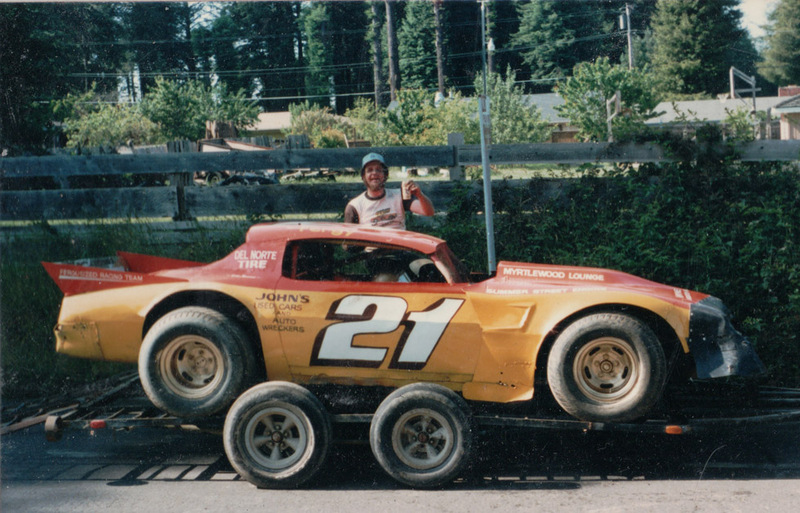 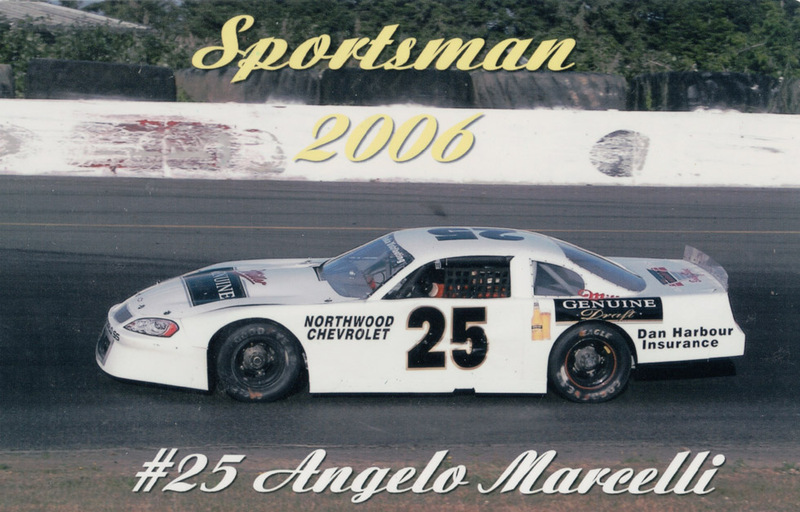 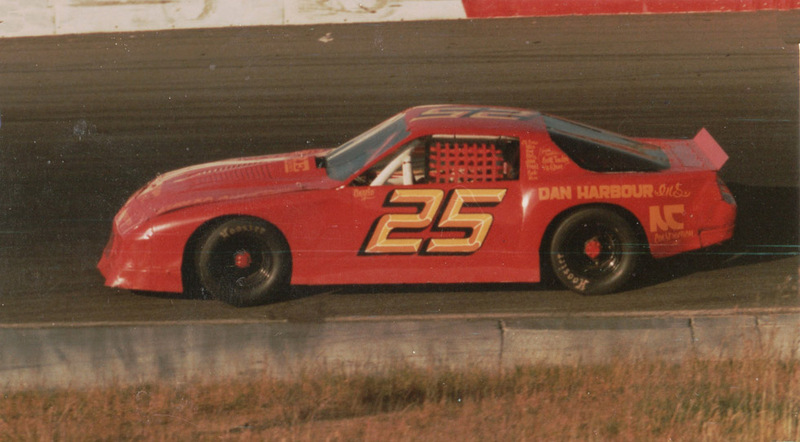 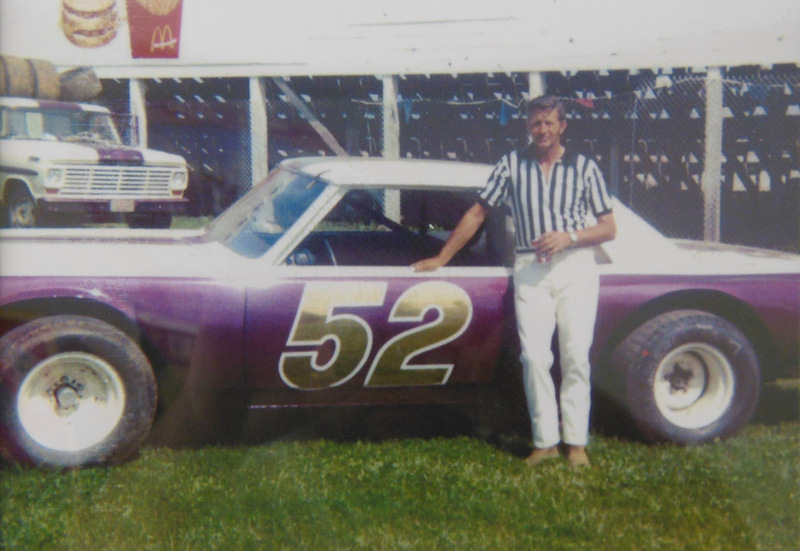 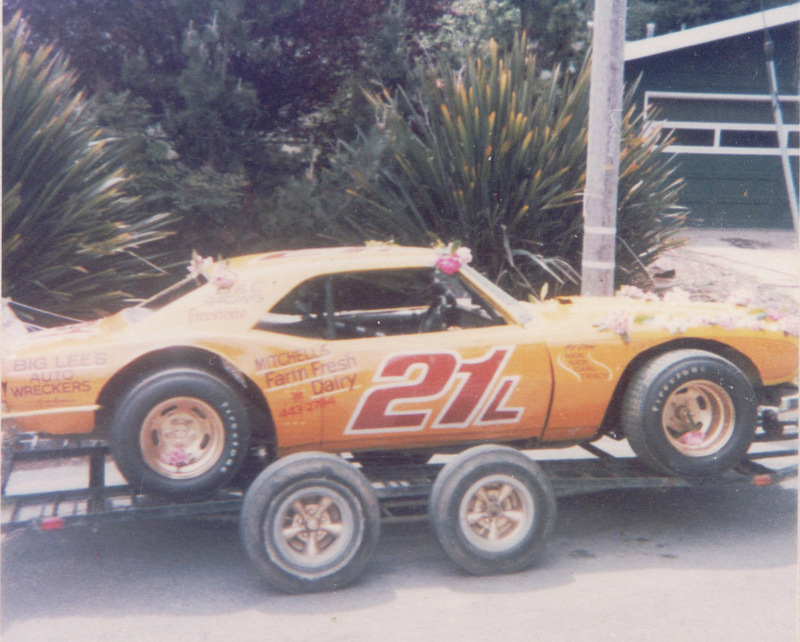 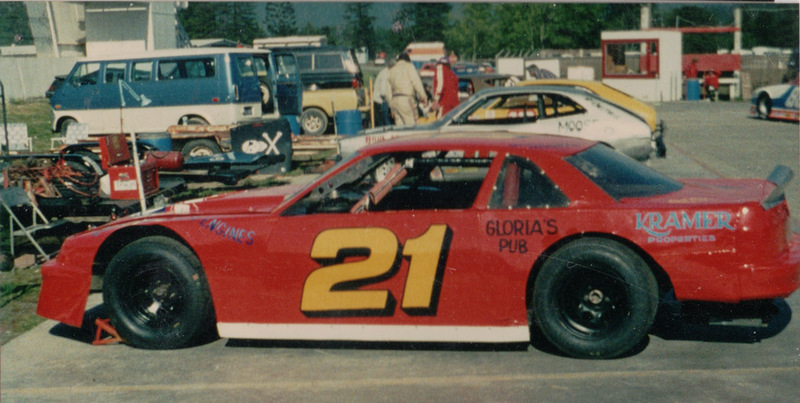 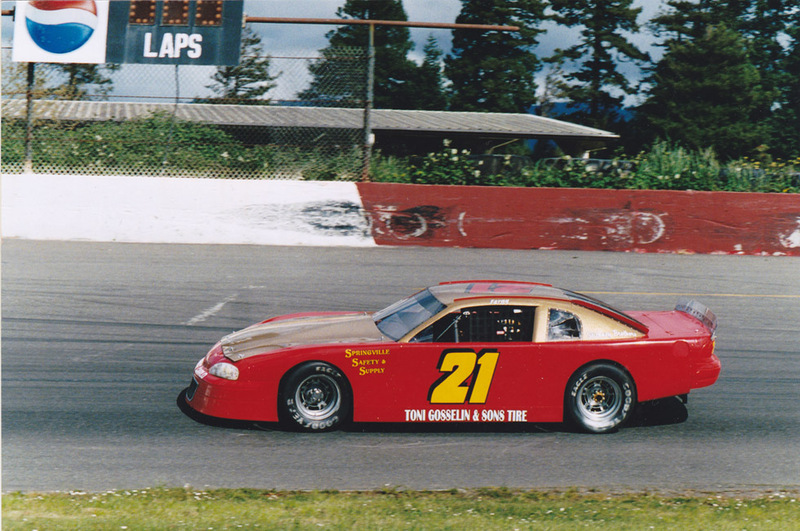 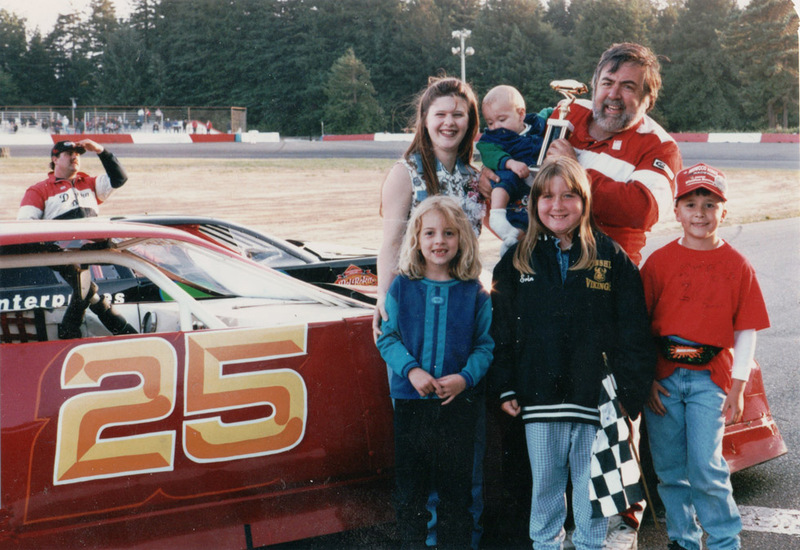 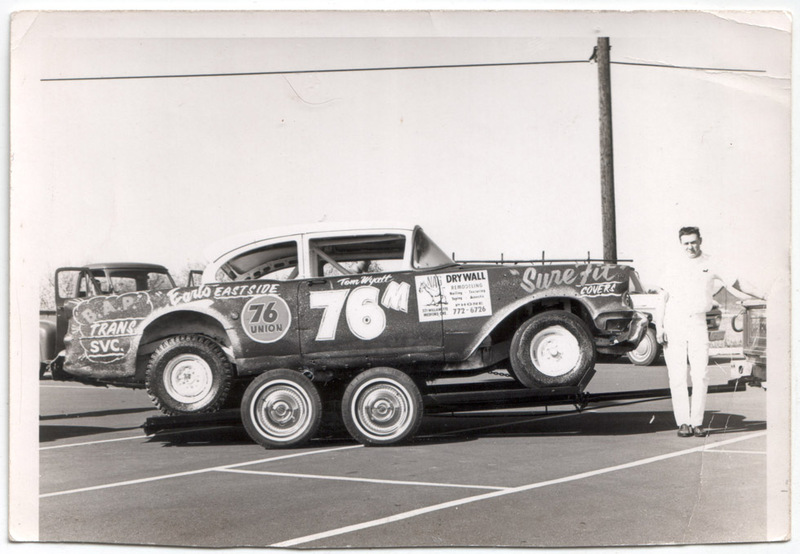 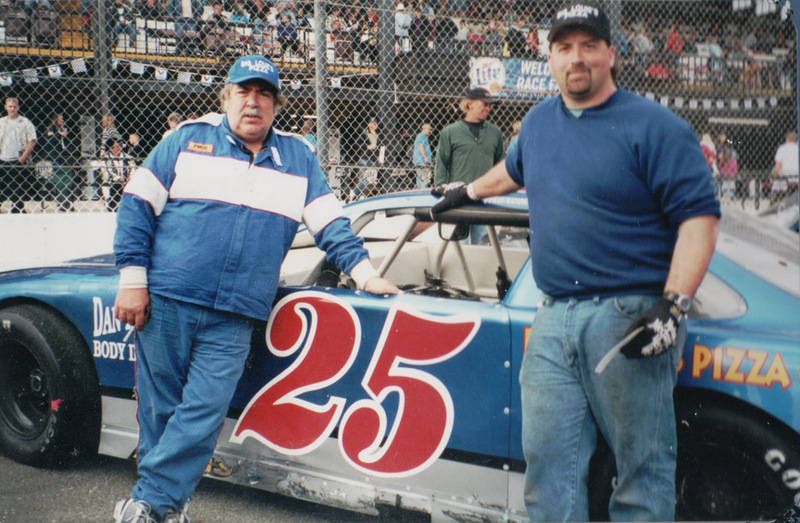 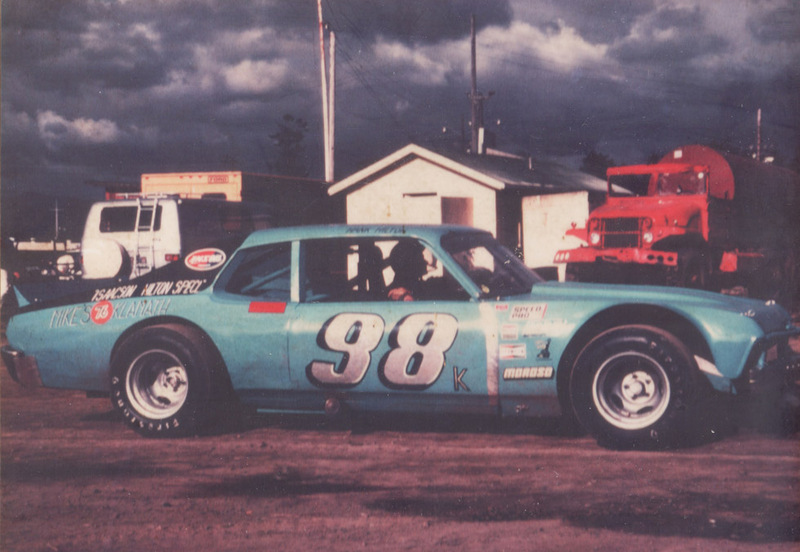 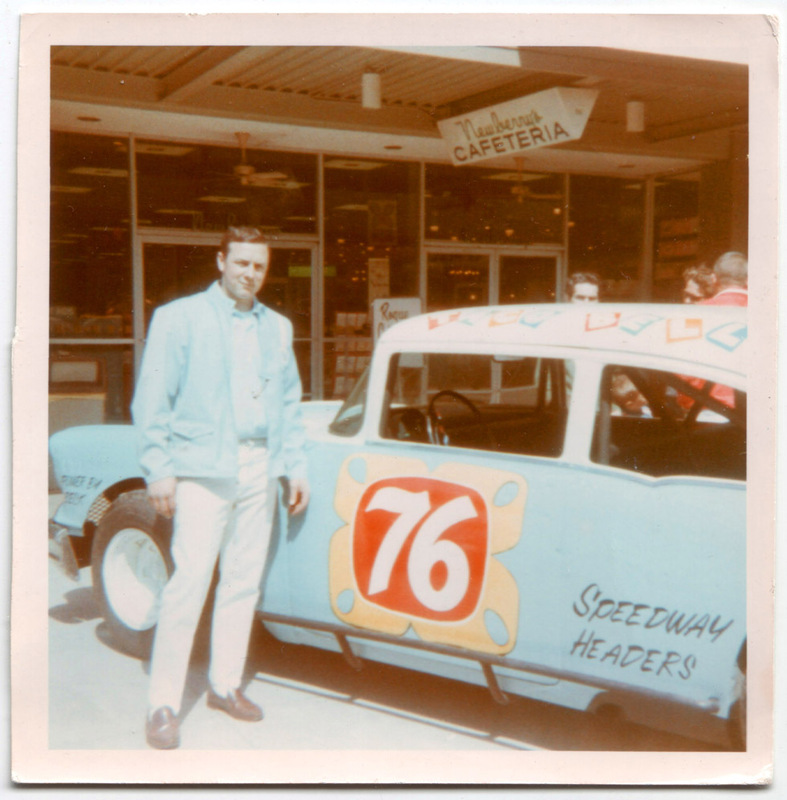 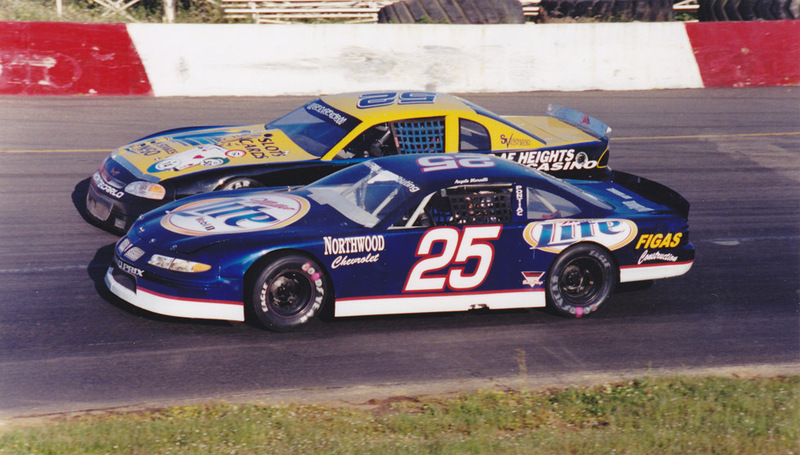 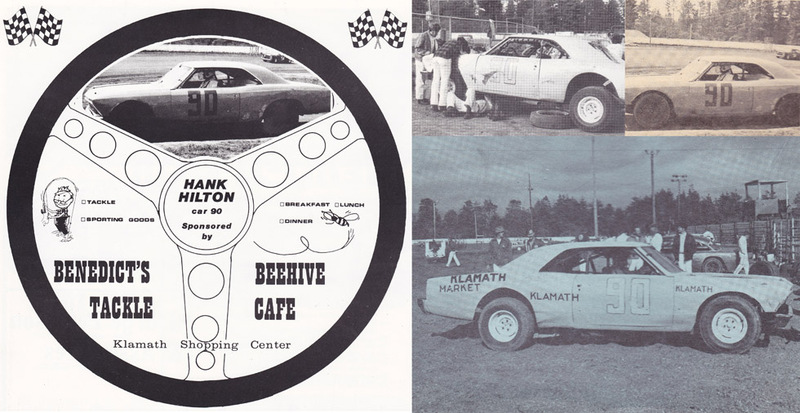 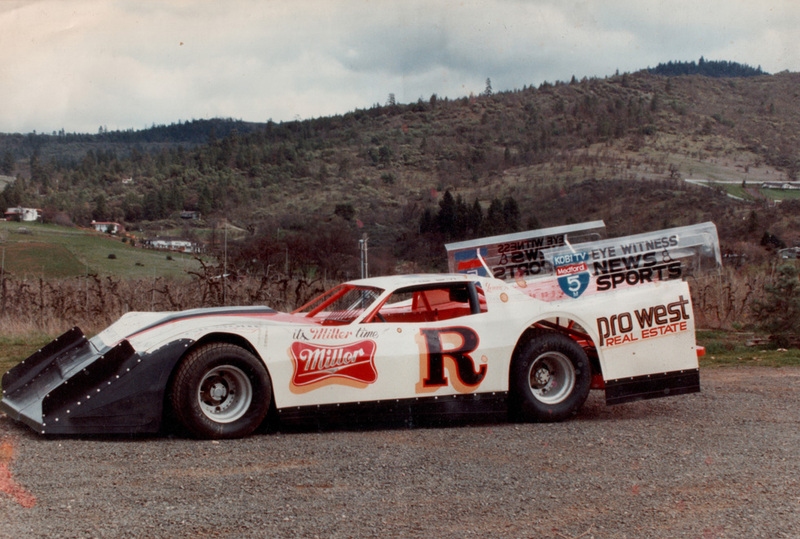 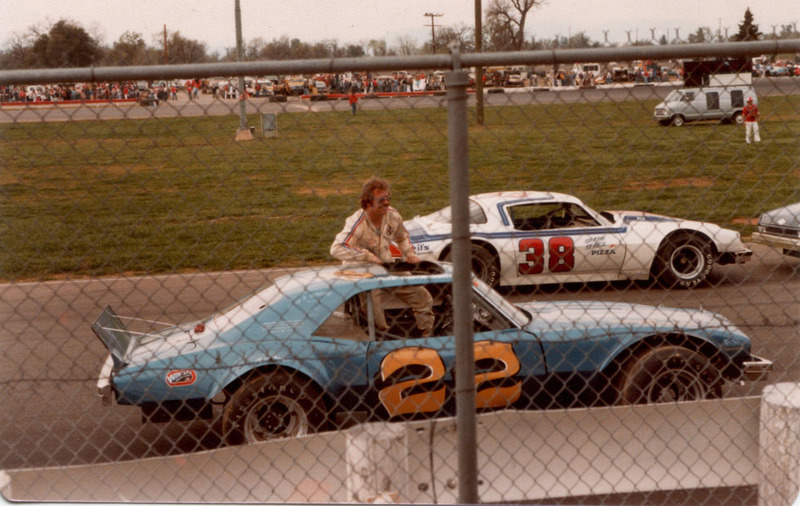 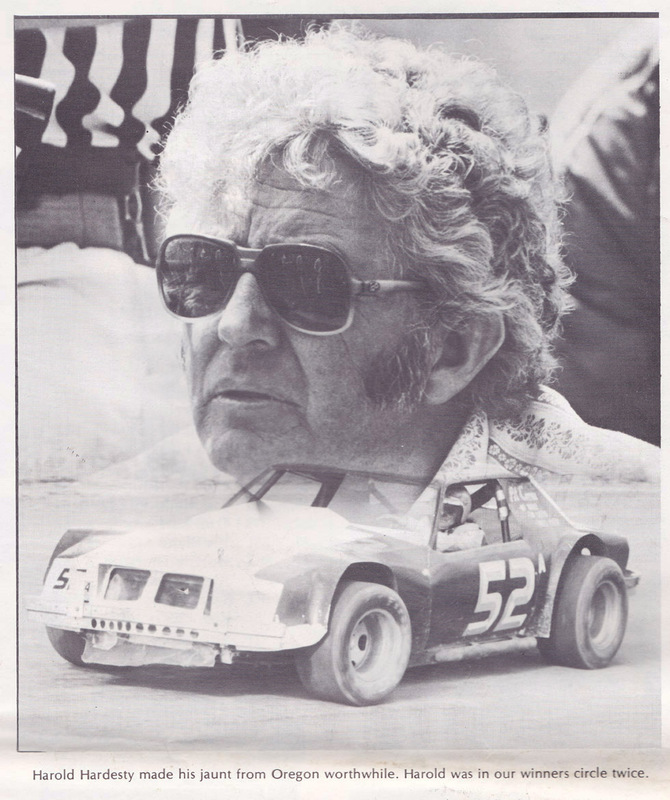 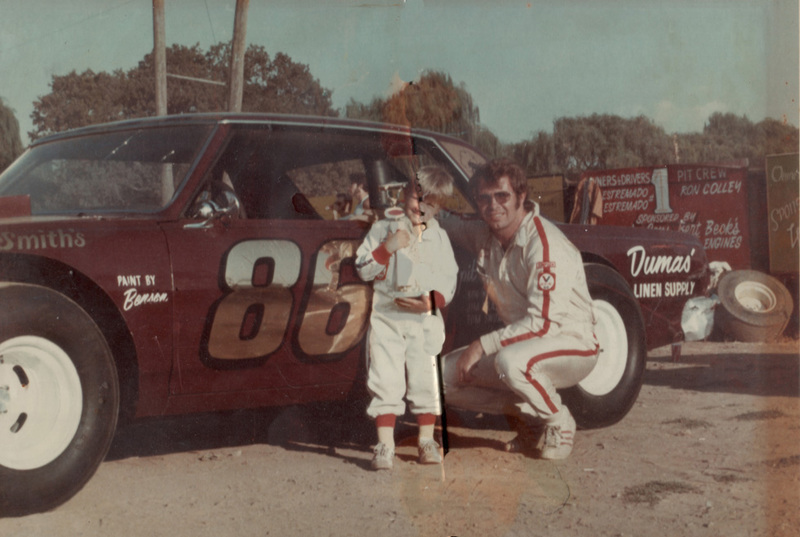 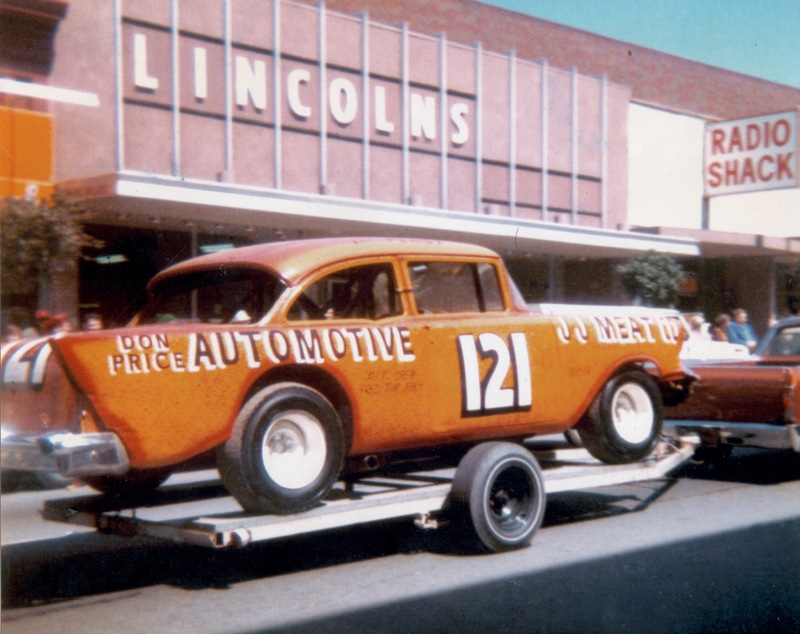 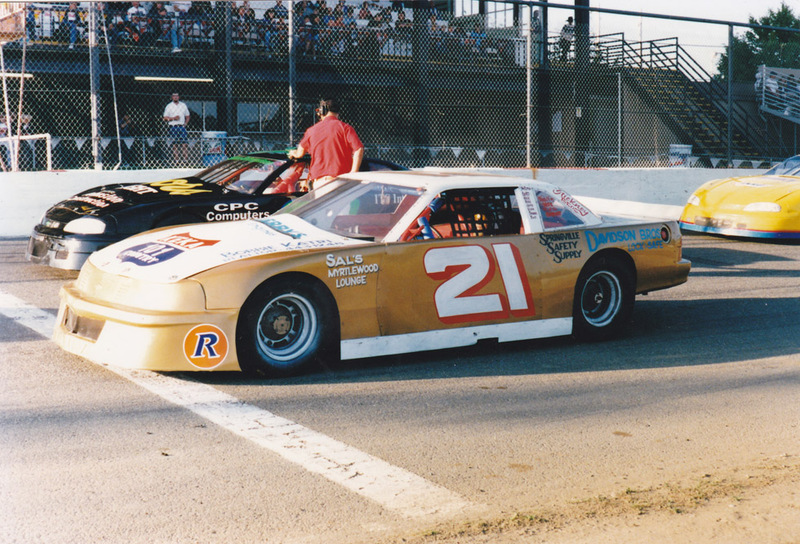 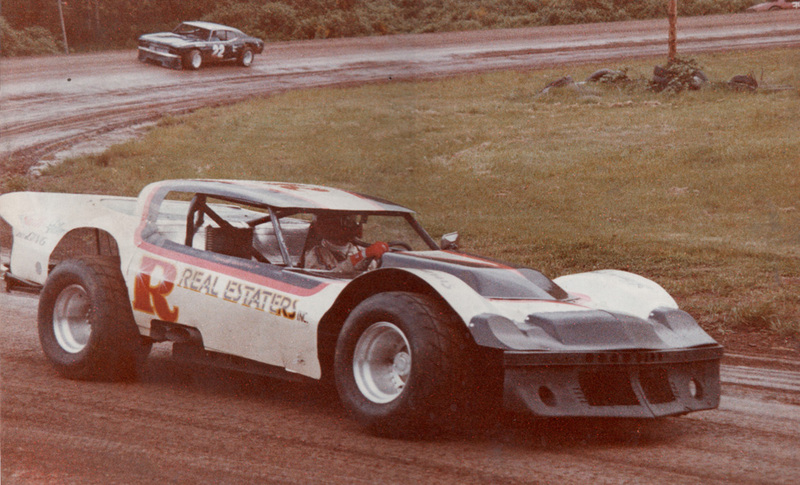 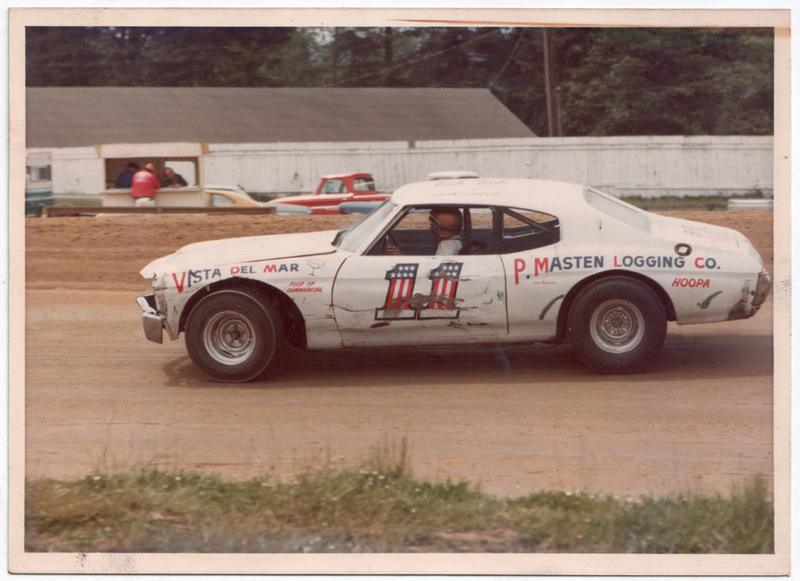 Dane’s third car – the Nova – that he raced at Medford, Anderson, and Redwood Acres. 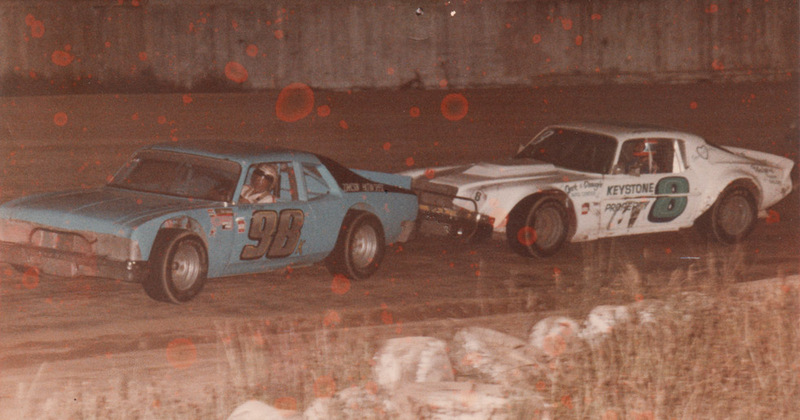 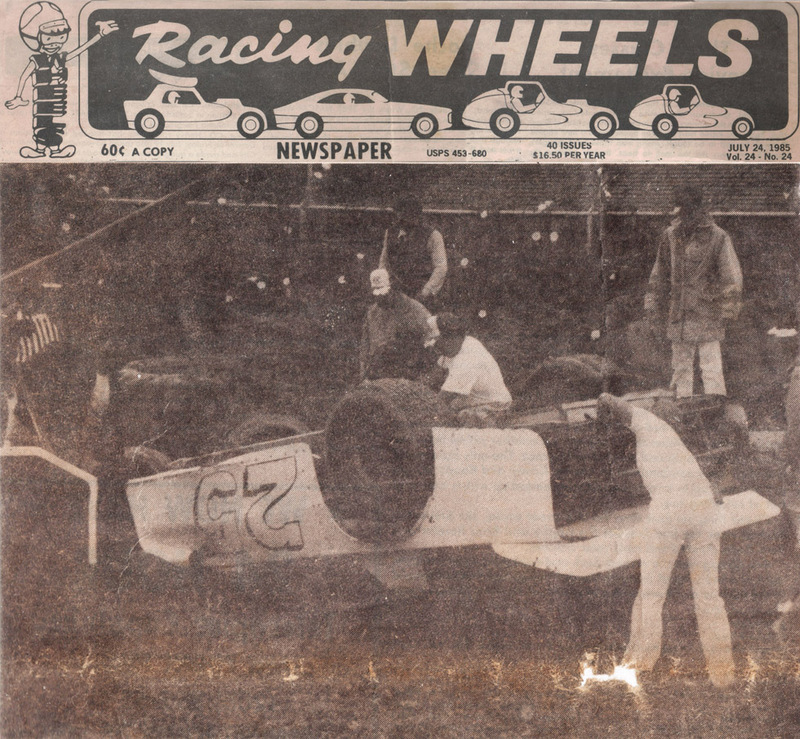 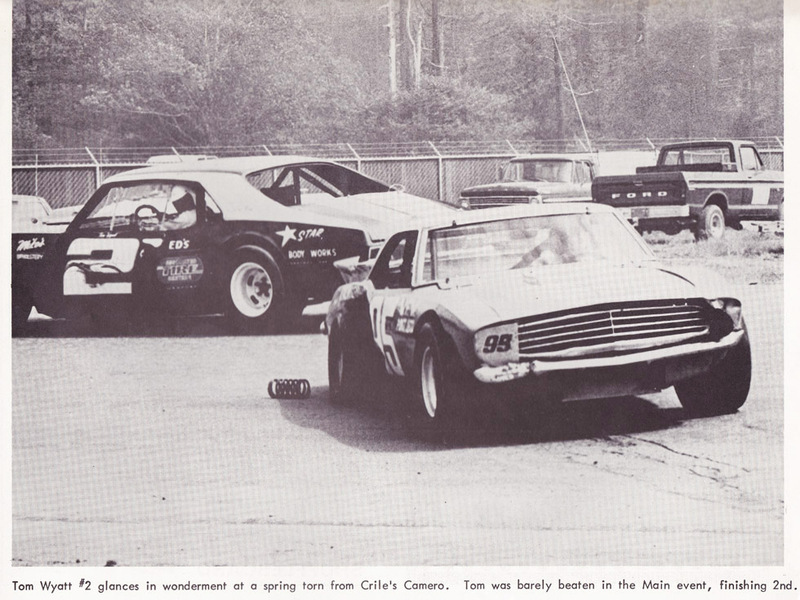 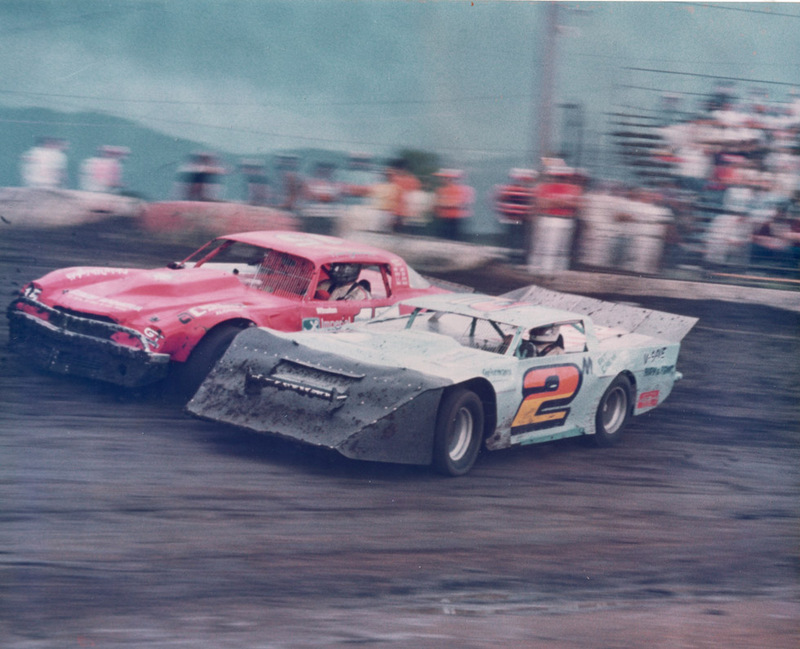 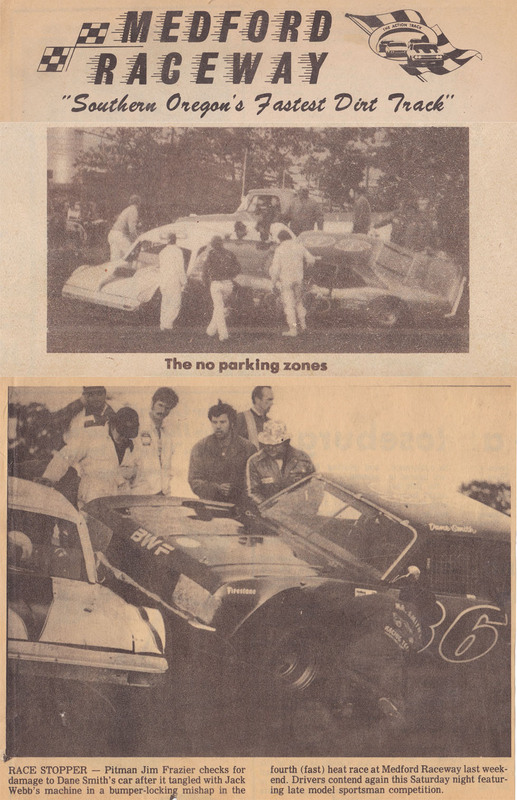 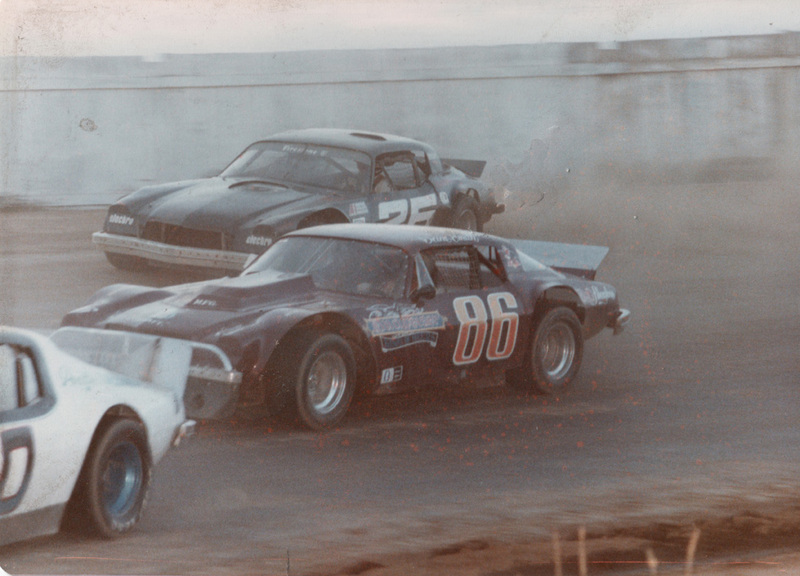 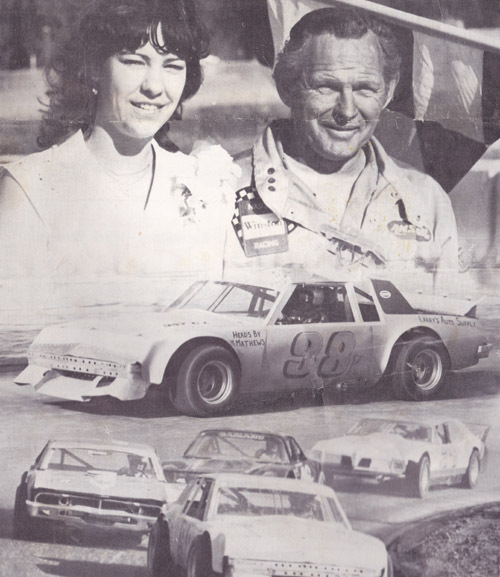 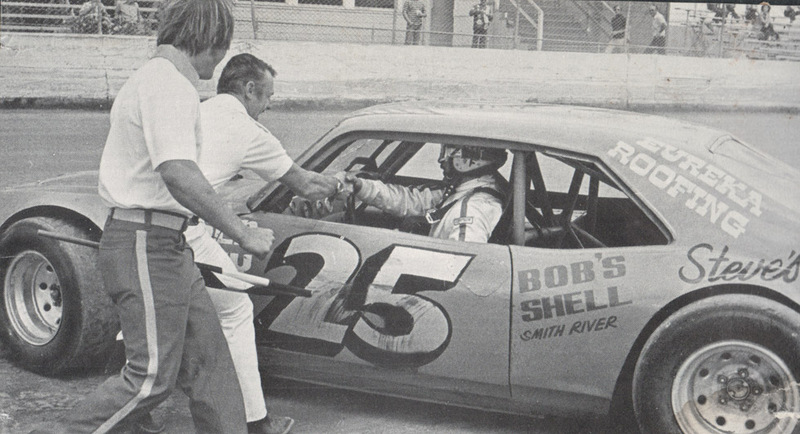 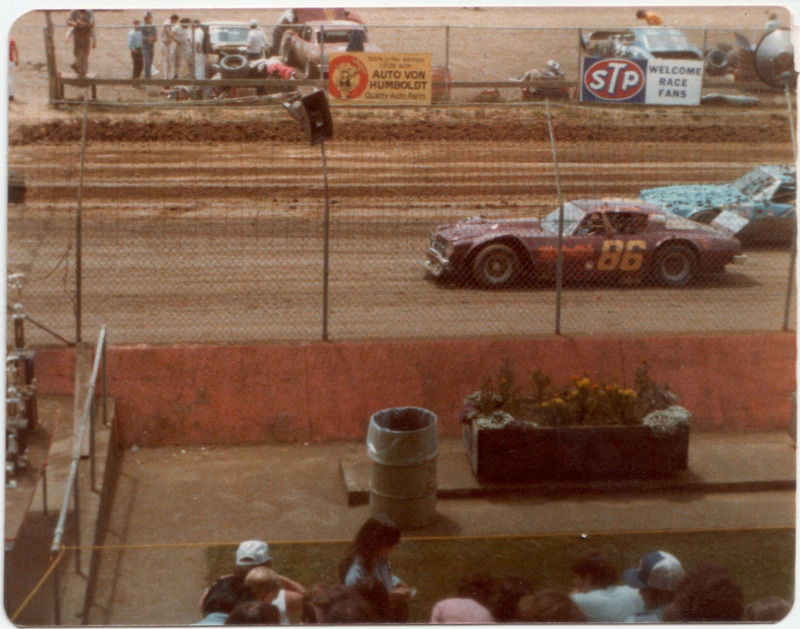 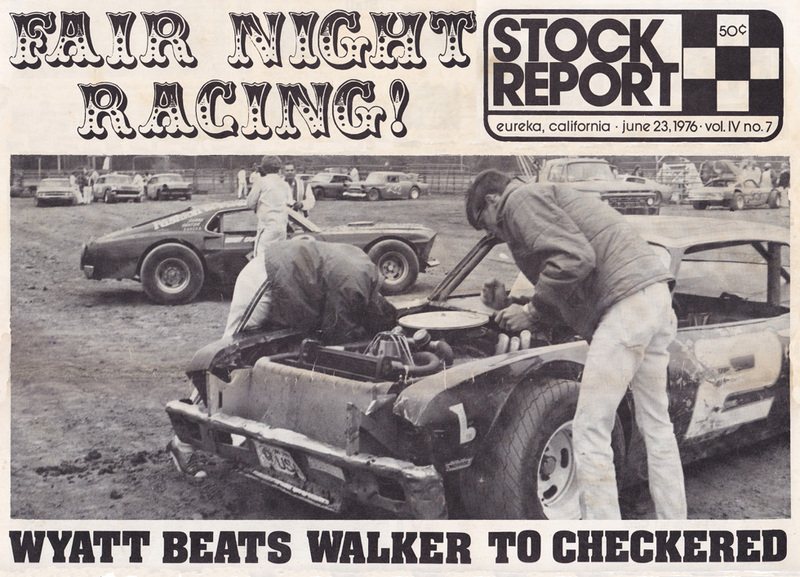 1977 Medford: #86 Dane Smith locks up bumpers with Jack Webb during the fast heat race as depicted in the Medford Raceway program and the local newspaper. 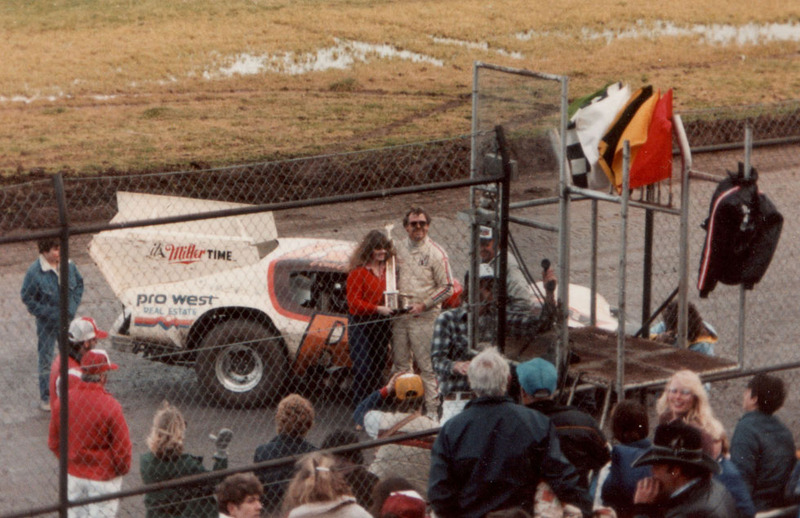 In 1977 Dane won the Heidelberg 100 at Medford. 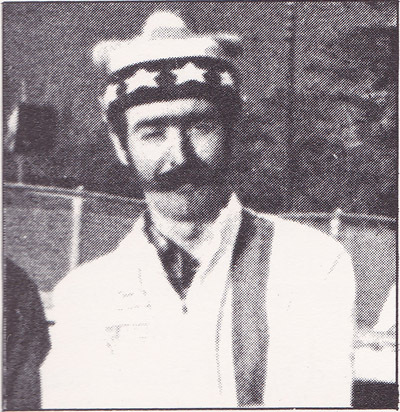 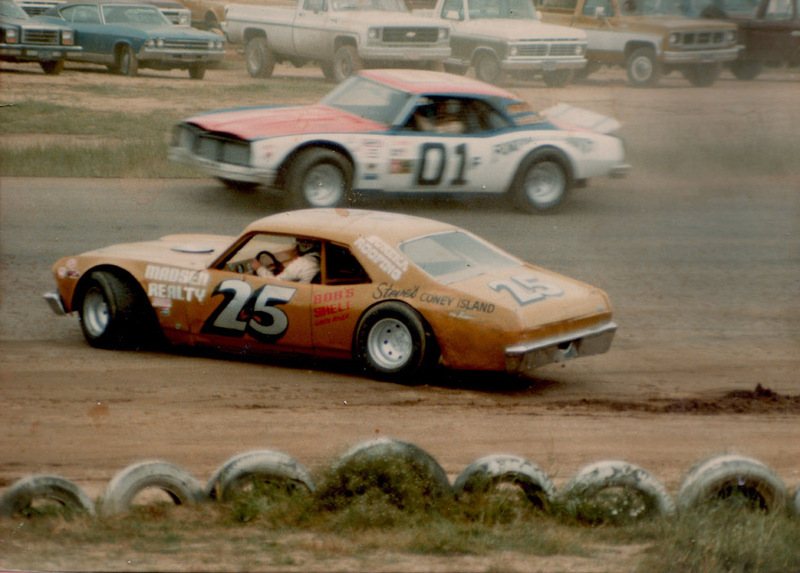 The previous winners were Jimmy Walker (1973 / 1974), Jack Keck (1975), and Markey James (1976), and all were in the ’77 field of 24 cars. 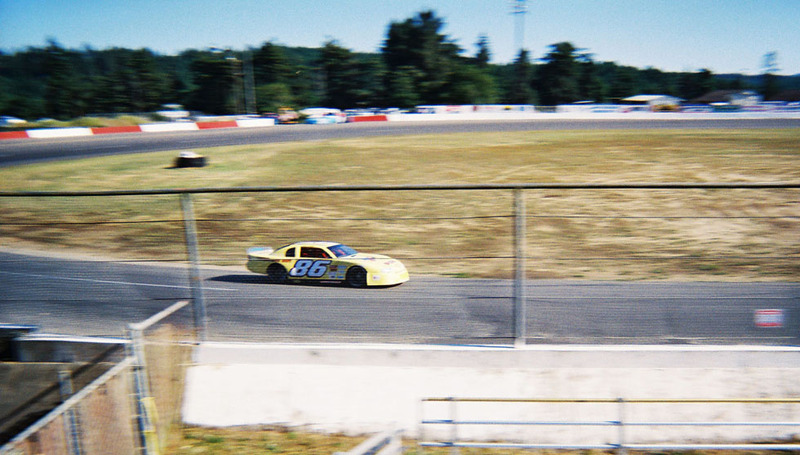 Dane started on pole and lead all 100 laps, with his Medford rivals Tom Wyatt 2nd, Dave Machado 3rd, and Jim Walker of Ferndale driving Charlie Charlton’s #88 car 4th. 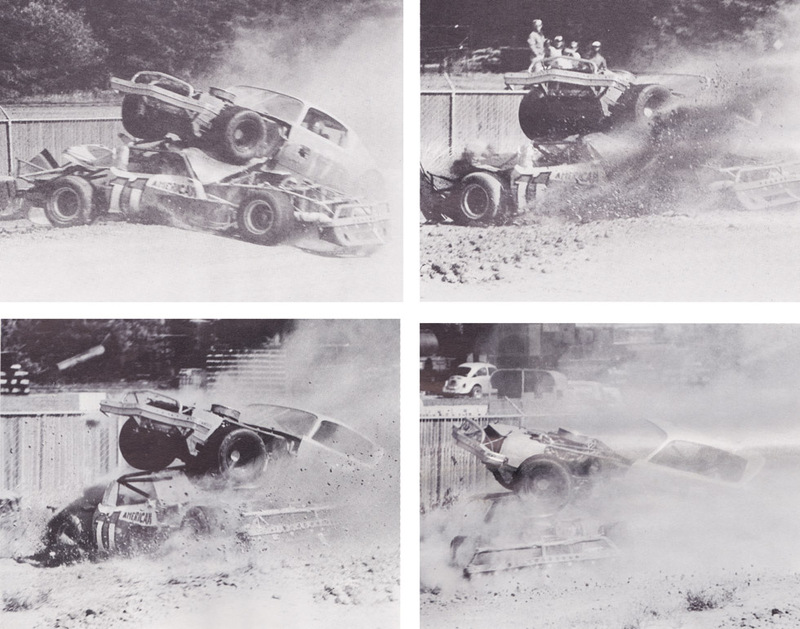 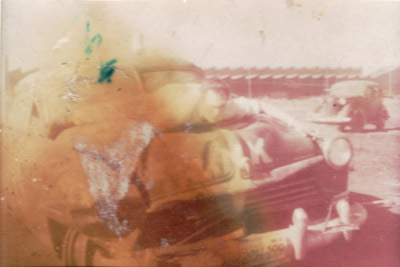 Jack Keck was involved in a crash along the front wall that ended in turn one. 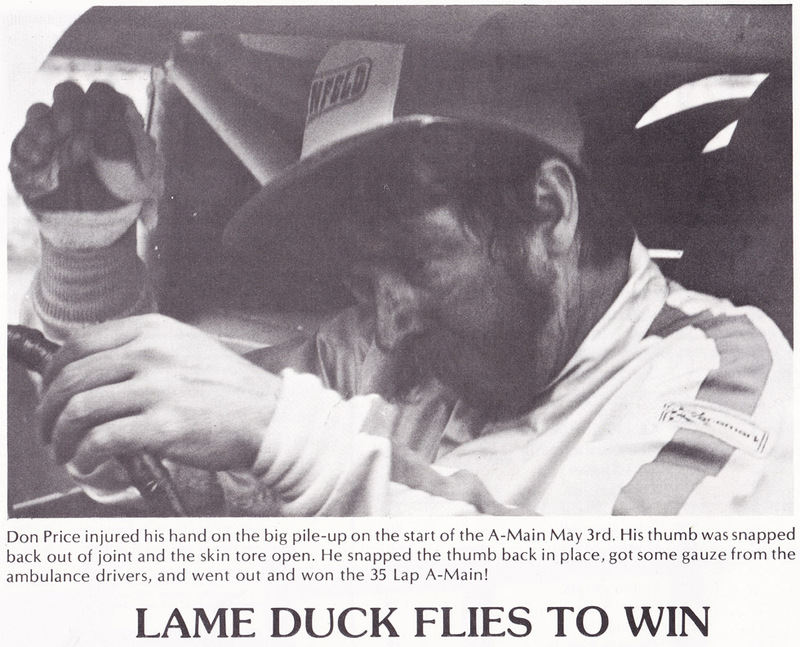 Dane says it was one of his more memorable race victories, because the winner received $1,000 in silver dollars. 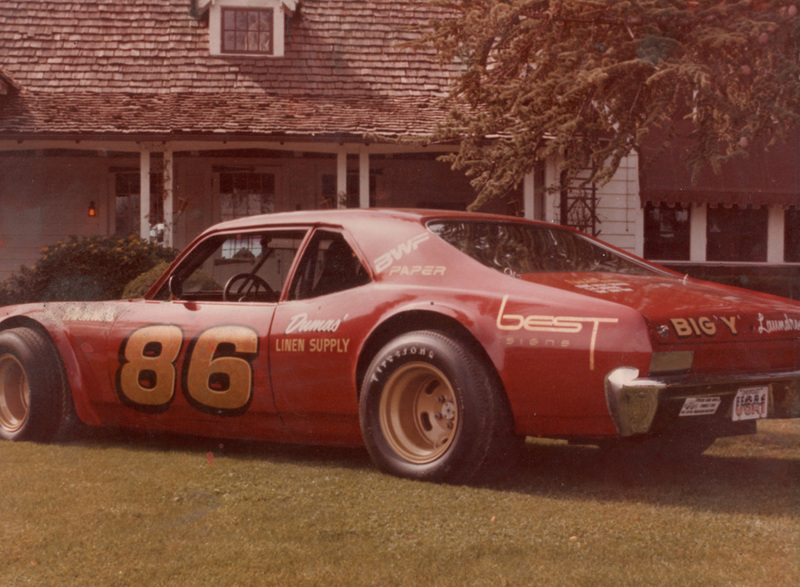 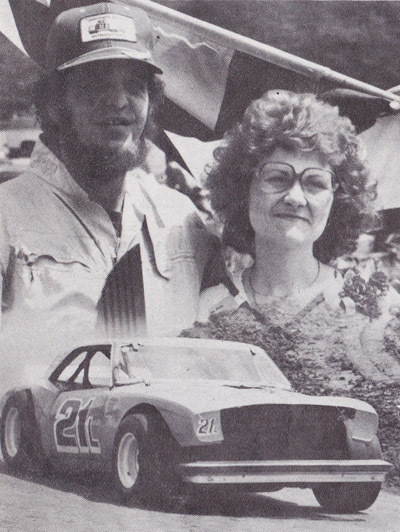 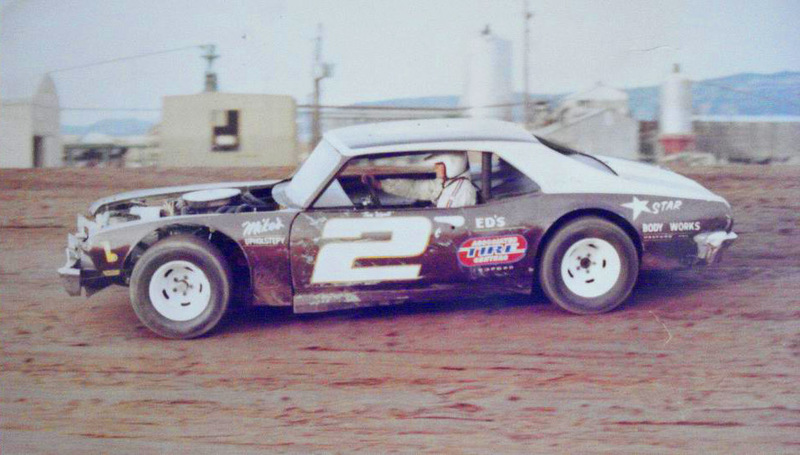 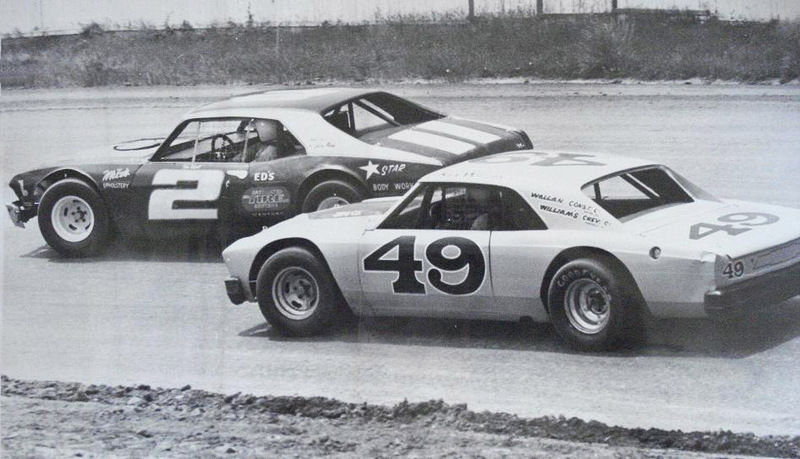 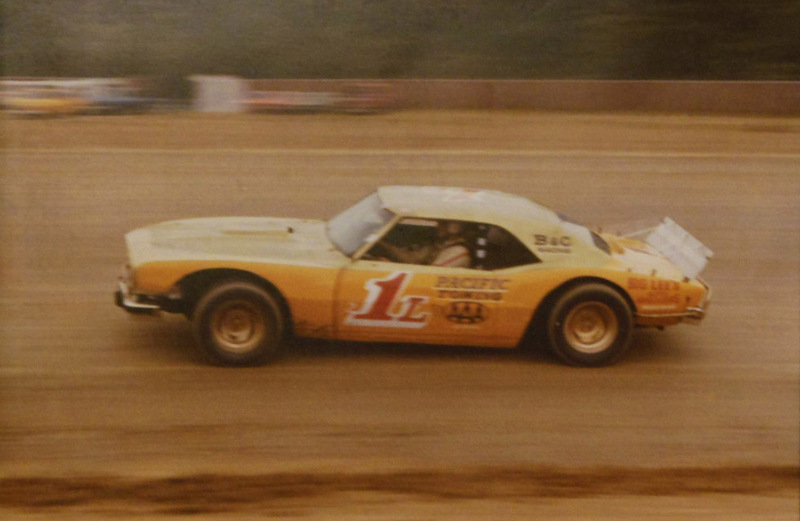 A classic mid 70s era Chevy Camaro, the car of choice in the open tour Super Stocks on the short tracks in the late 1970s. 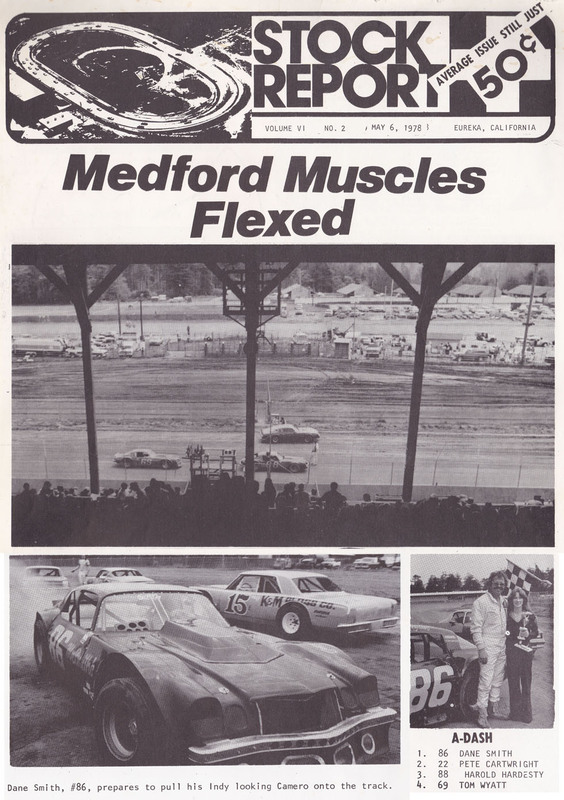 The Redwood Acres program Stock Report reported the April 23 1978 races as a sort of “Medford Invasion”; with the grid for the A Trophy Dash: Pete Cartwright on on pole, Tom Wyatt on the outside, and Harold Hardesty lining up in the back (top), with the race won by #86 Dane Smith (above). 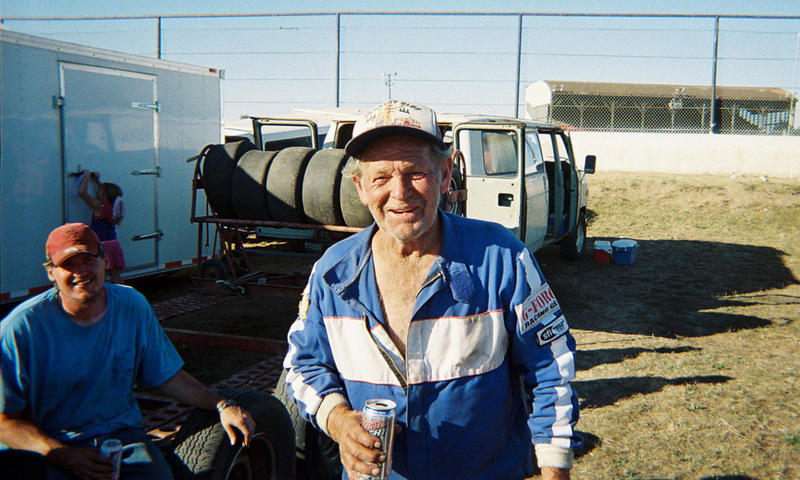 Pete Cartwright would win the A-Main. 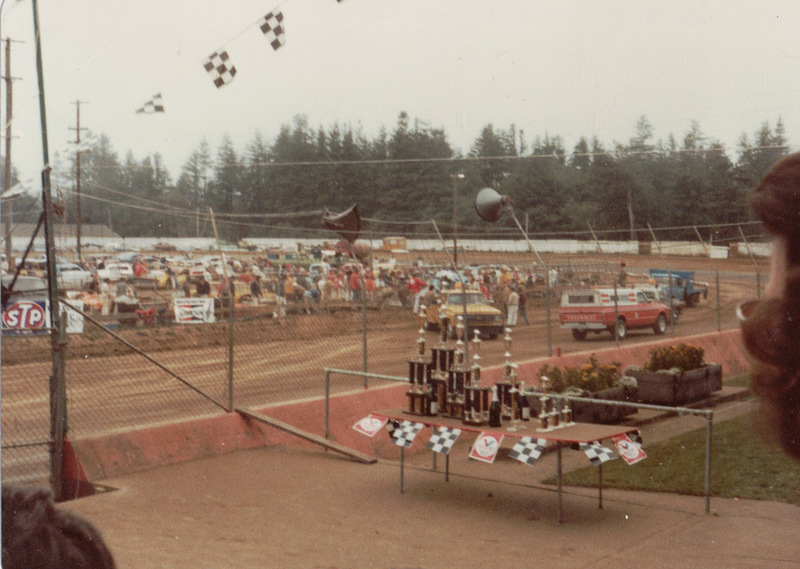 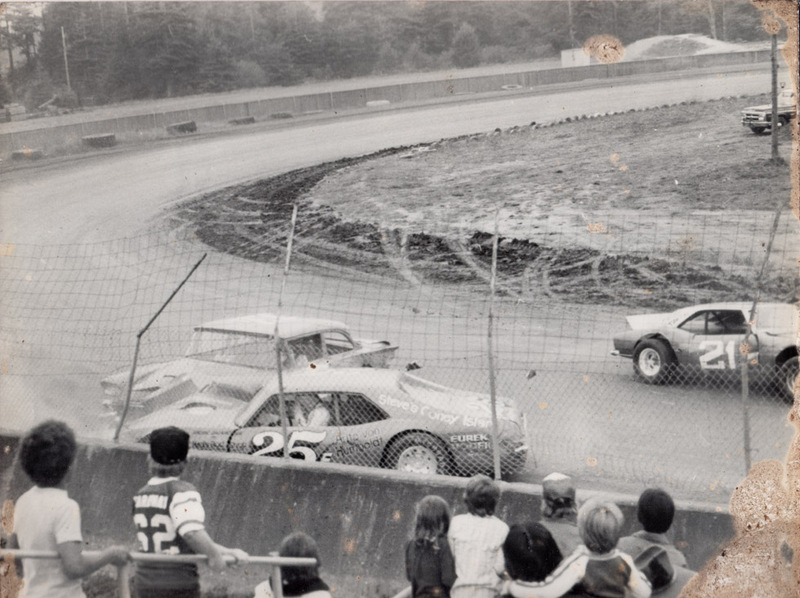 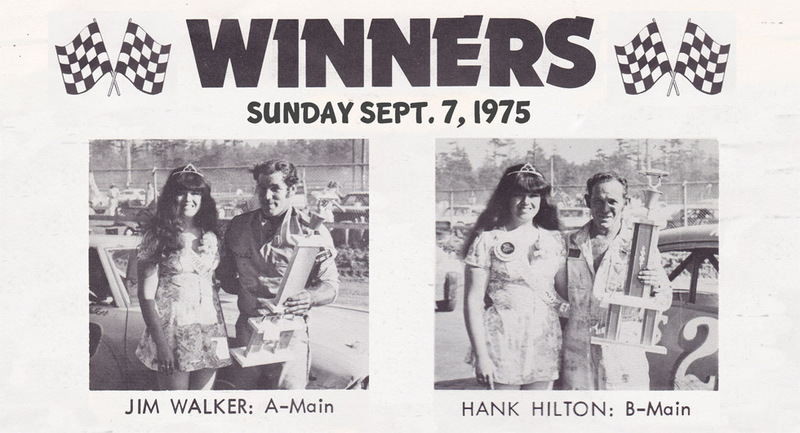 1978 at Redwood Acres: A backwards victory lap with local rival Jimmy Walker of Ferndale. 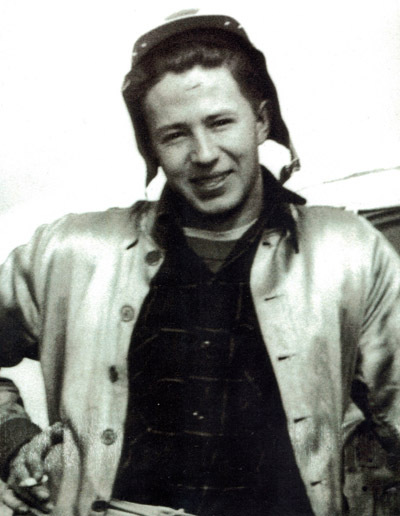 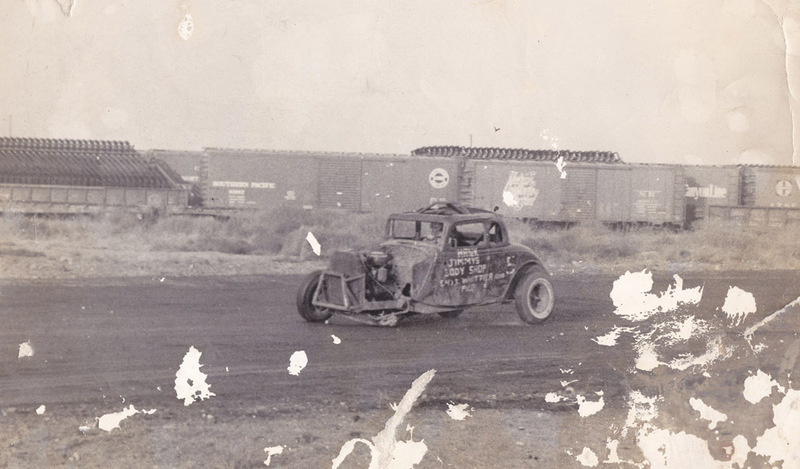 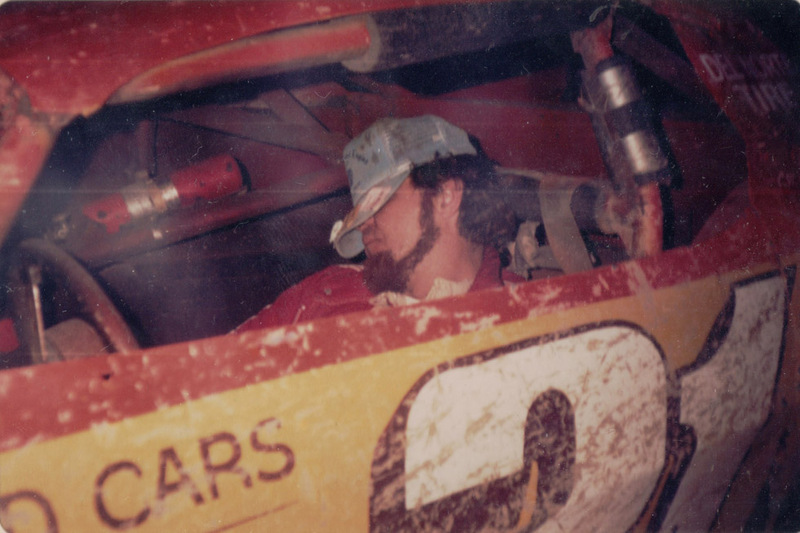 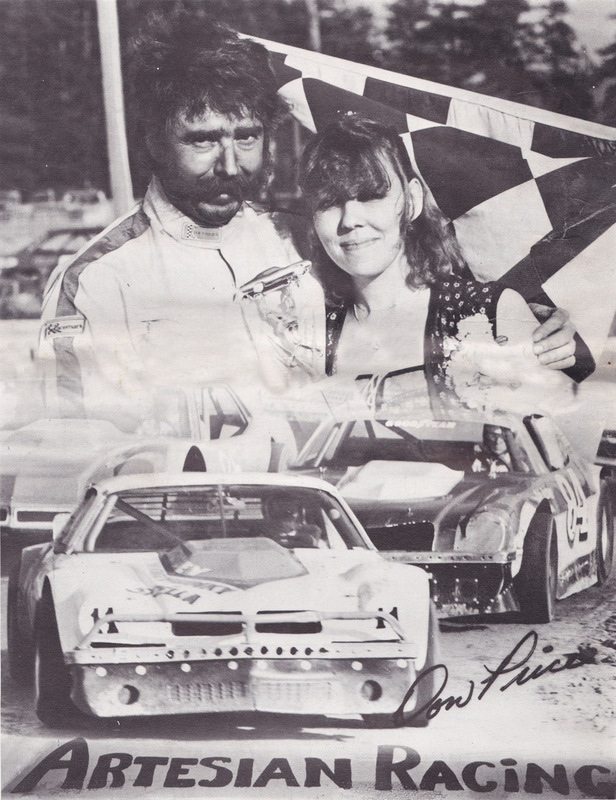 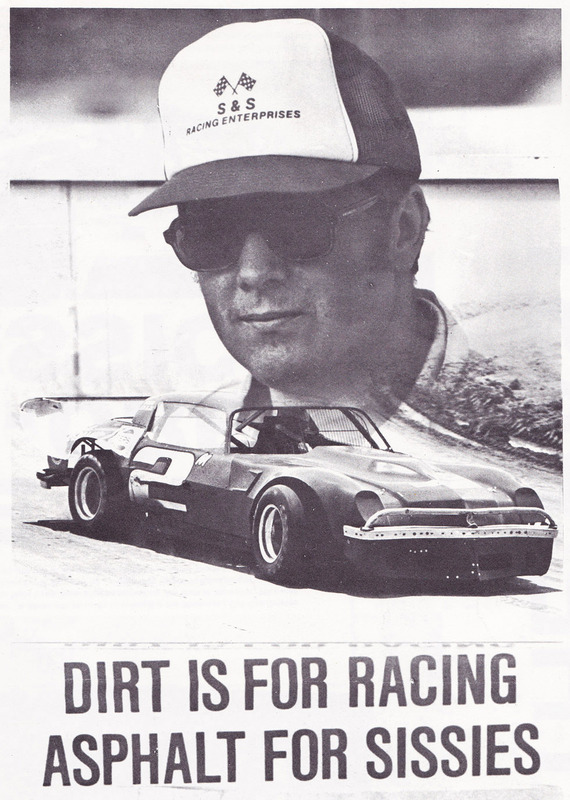 On the back of the photo Dane wrote at the time: “My favorite dirt track”. 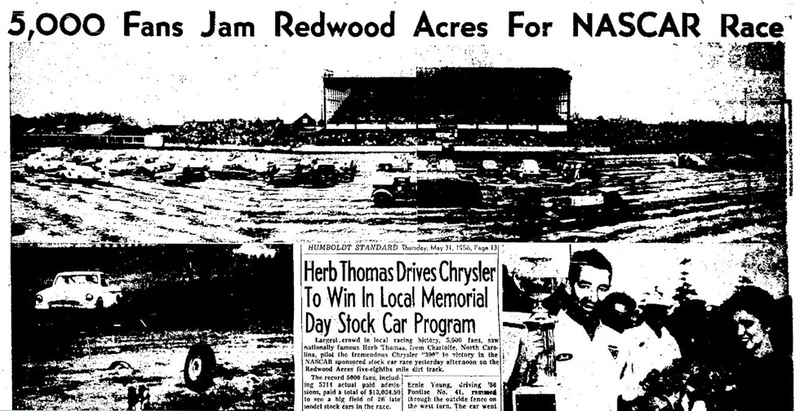 At Redwood Acres, the dry slick track could be dusty. 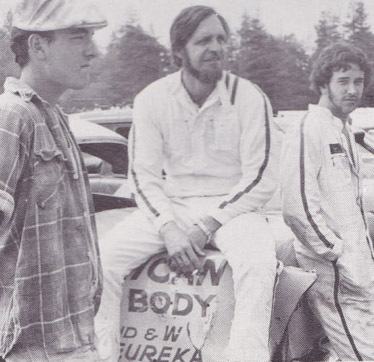 The “105 mph Club” consisted of six drivers who broke the track record July 1979 during Speedweek at Evergreen Speedway in Monroe, Washington. 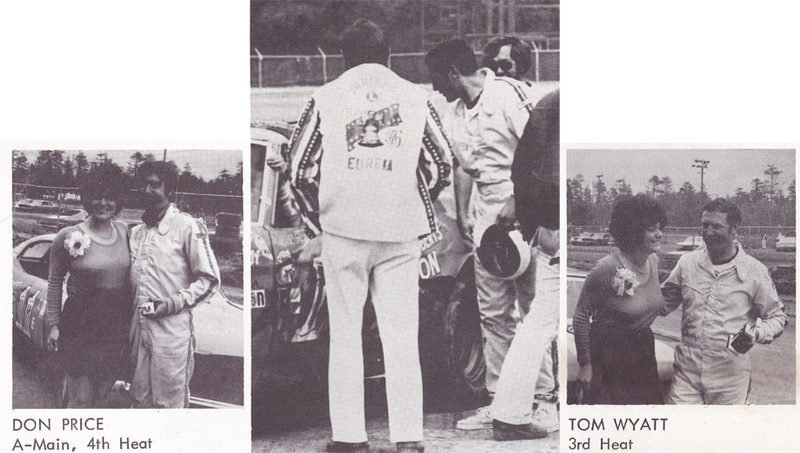 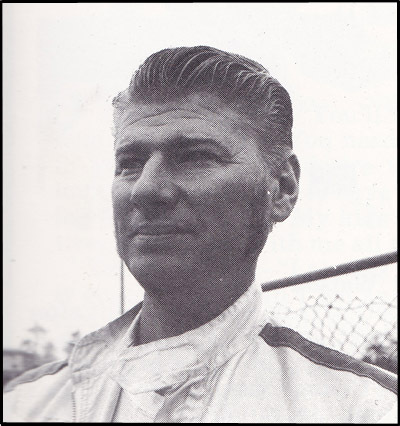 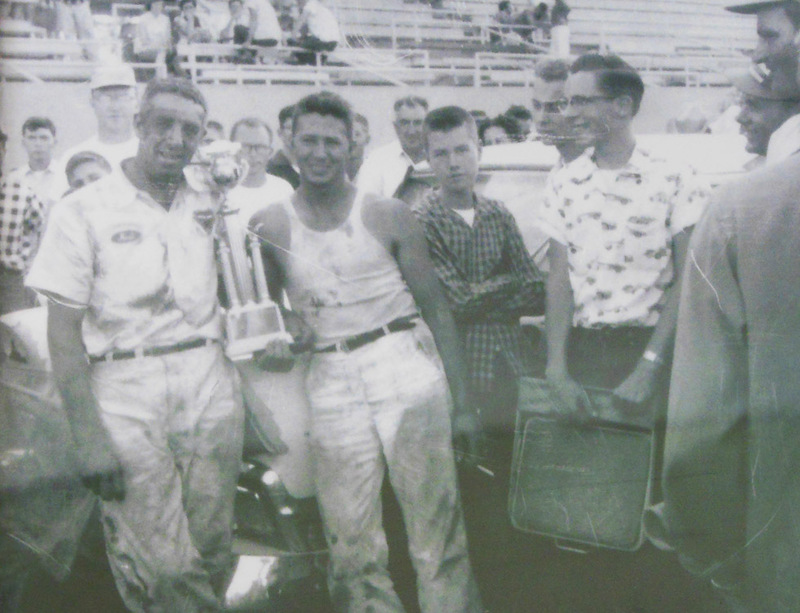 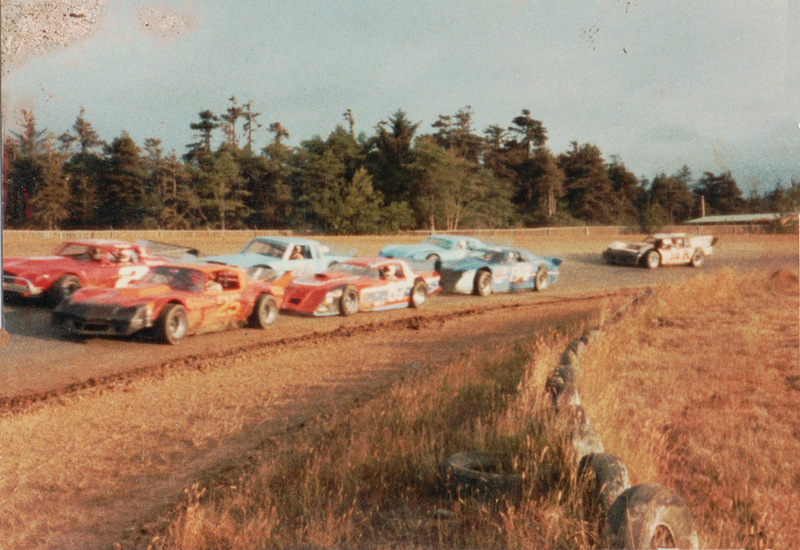 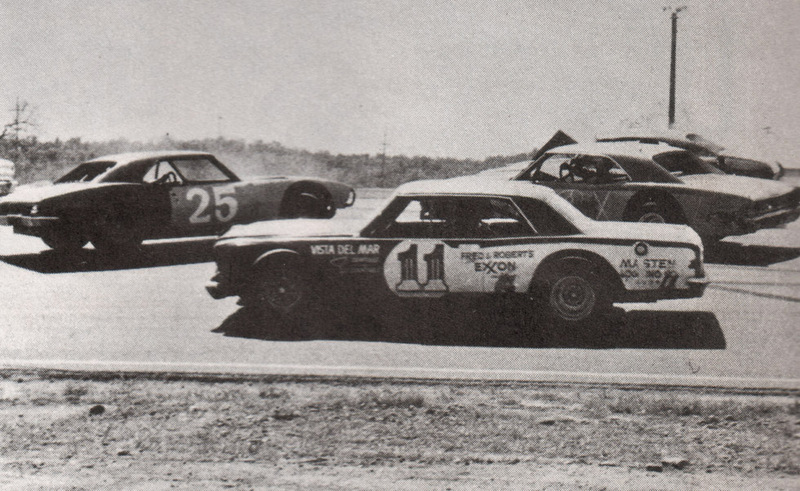 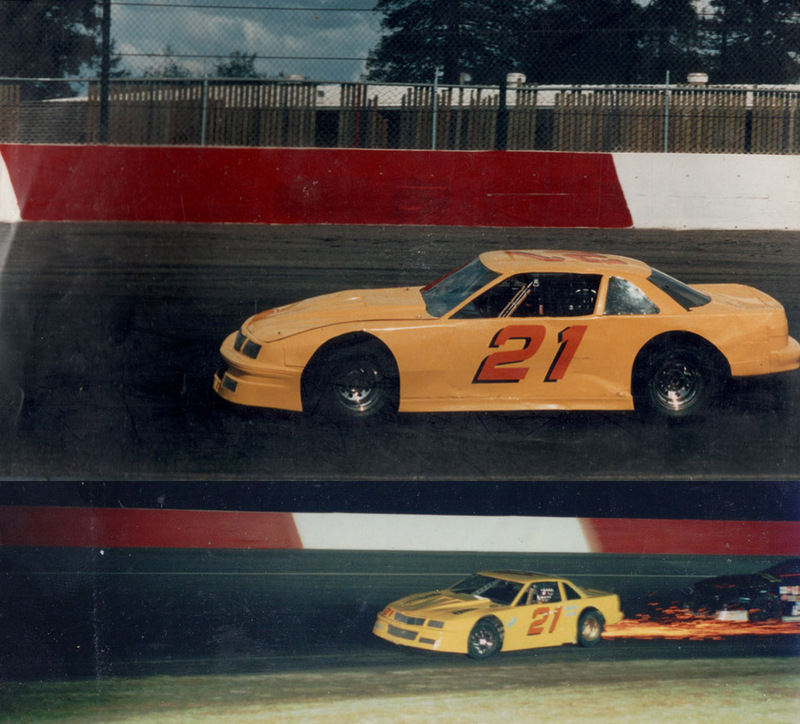 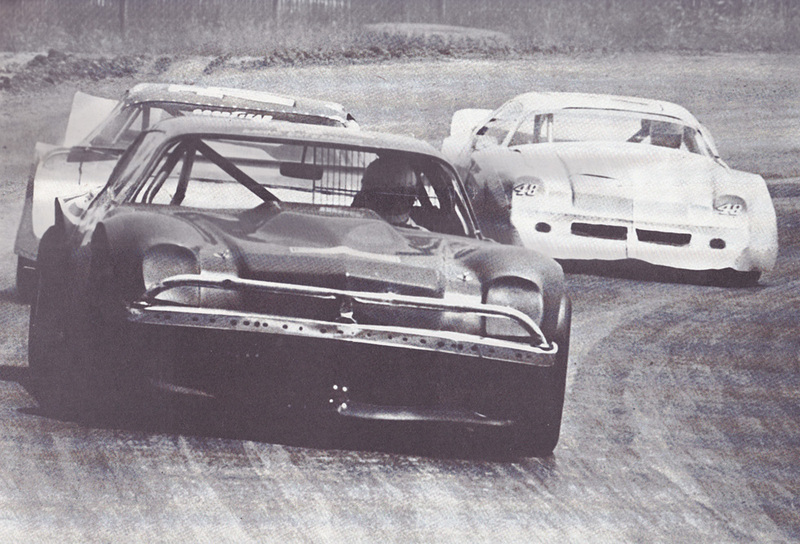 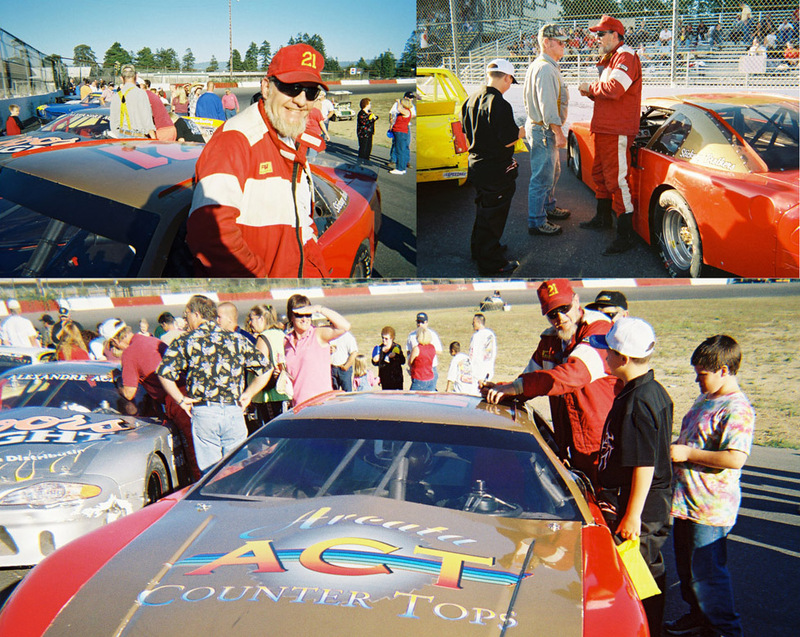 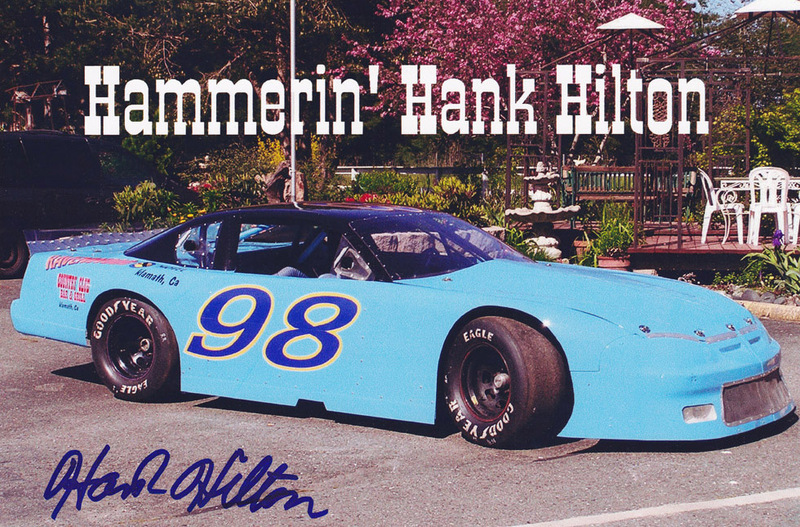 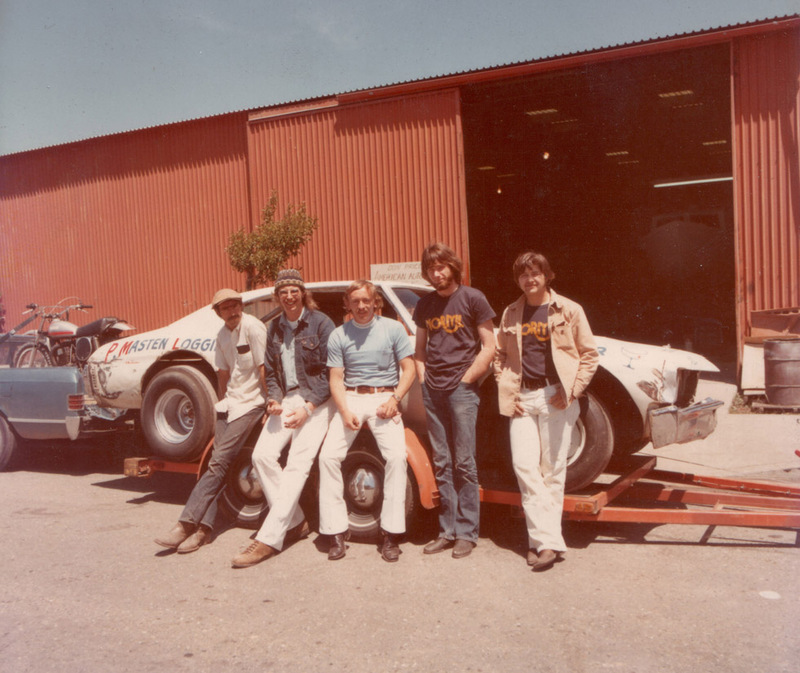 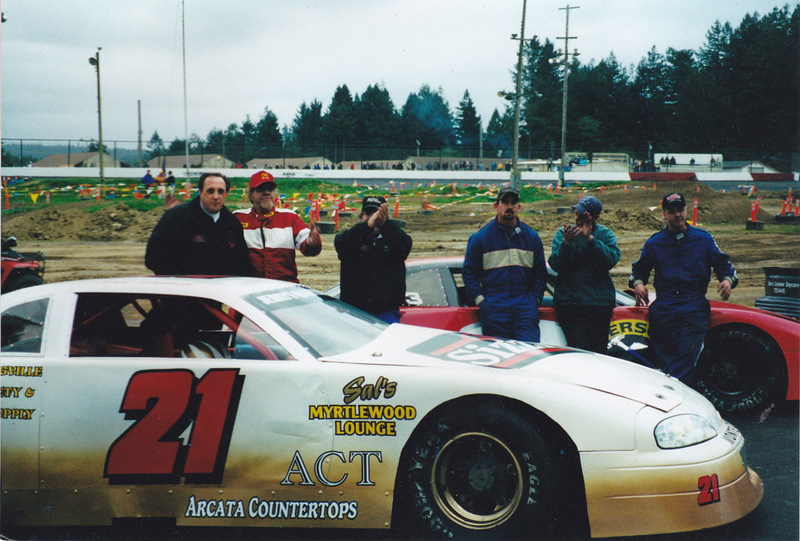 The drivers included Ron Easau, Jimmy Insolo, Mike Miller, and Dane Smith. 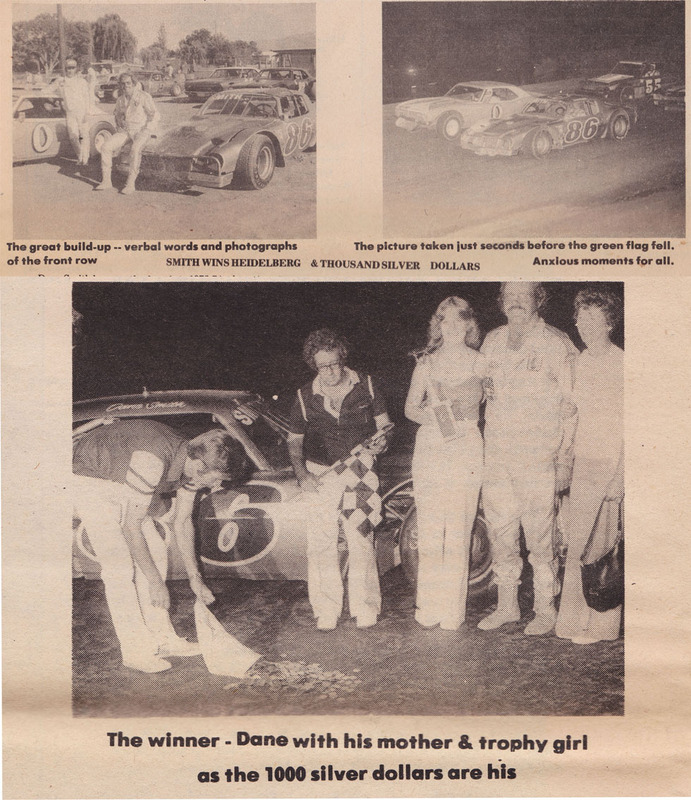 Chico 1982: Dane on the high side in turn four (above left) and with the winner’s trophy (below). 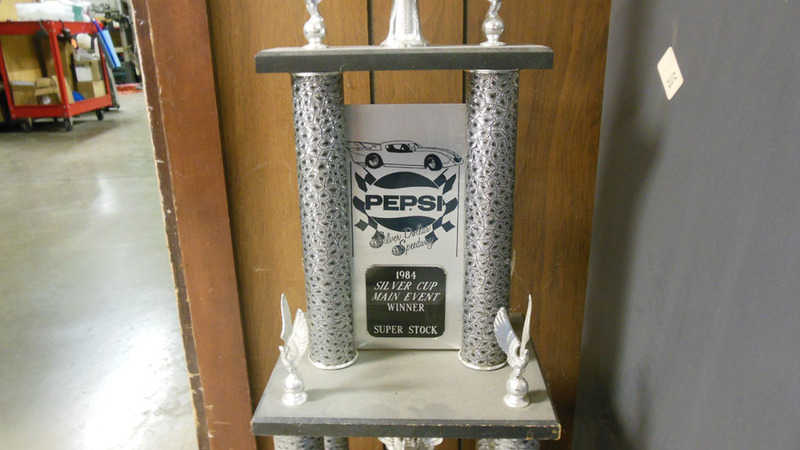 1984 Silver Cup Trophy in Dane’s shop. 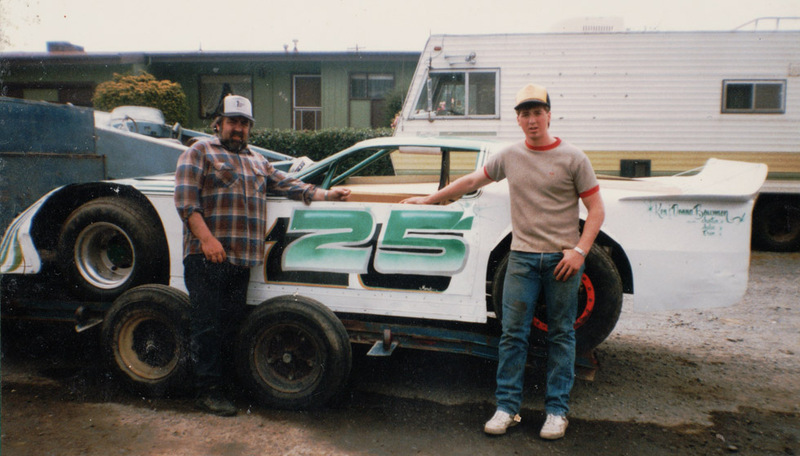 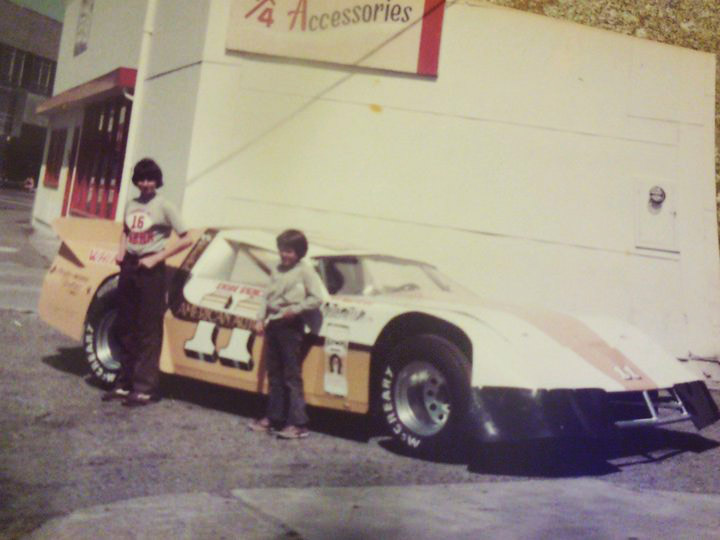 The 1984 “Bullitt” chassis car by Vern Gilmore with Dane behind the wheel was track record holder at Medford, Yreka, Eureka, and Chico, with Open Show wins at Chico, Yreka, Eureka, Medford and Skagit. 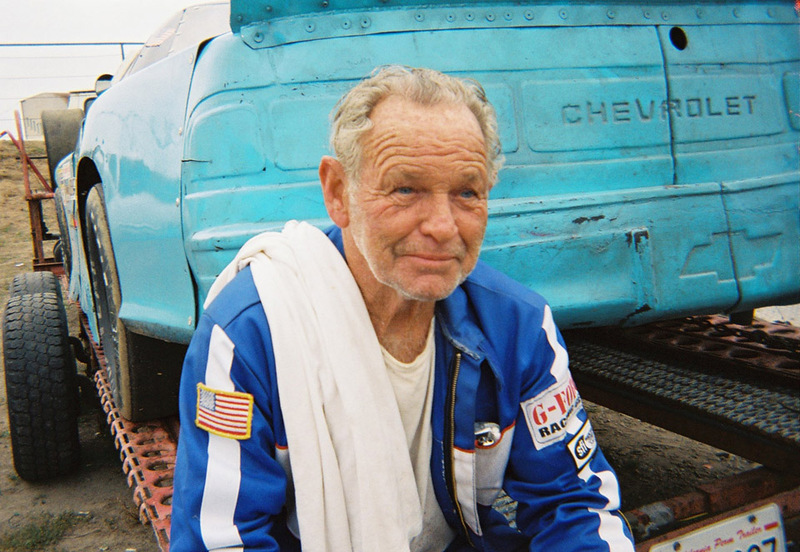 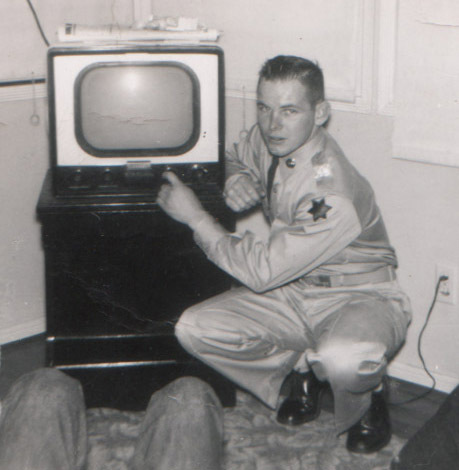 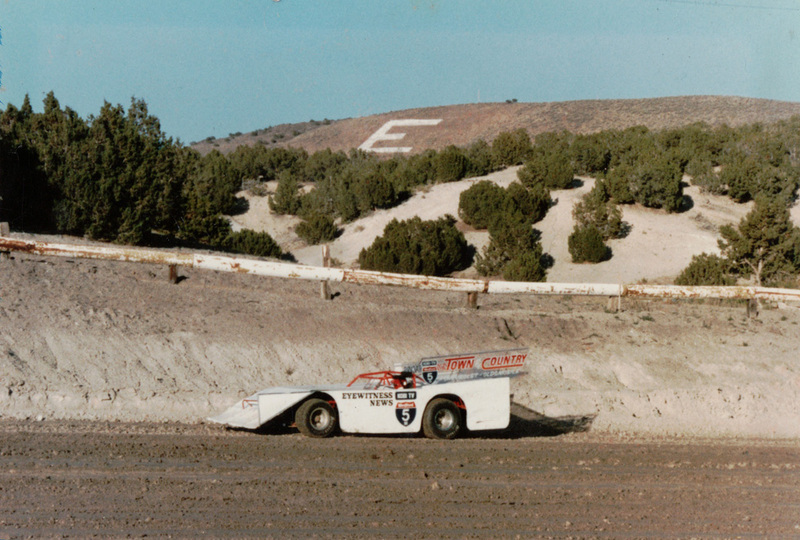 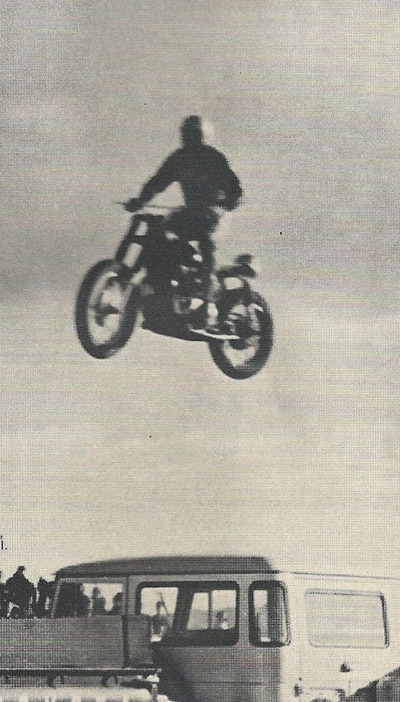 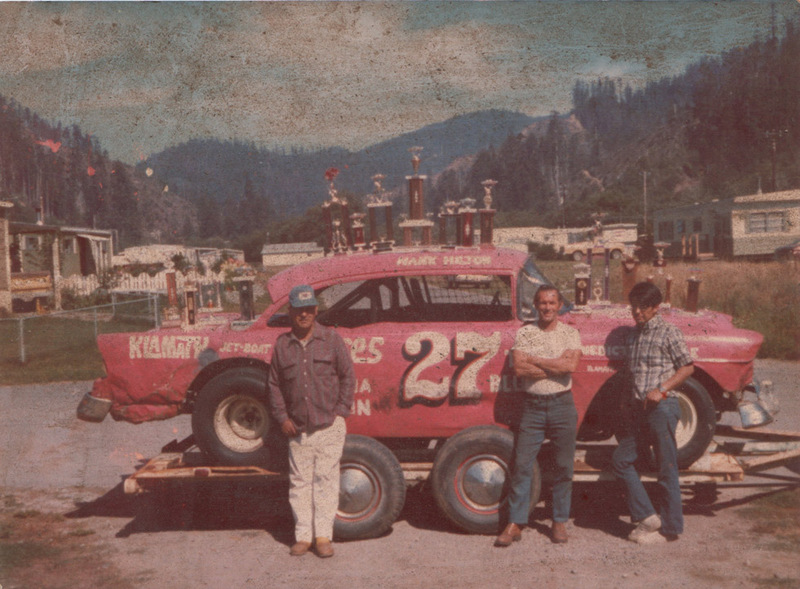 It was known as the”I-5 Bandit”, in part due to the sponsor, KOBI-TV Channel 5 in Medford, and also because it raced up and down Interstate 5 highway to tracks in Washington, Oregon, California and Nevada, setting fast times and winning races. 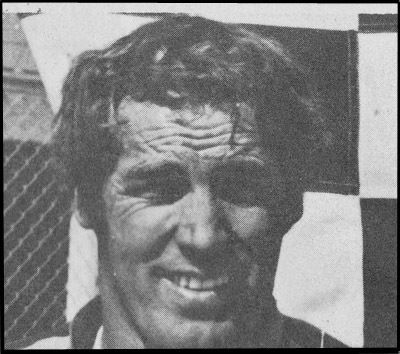 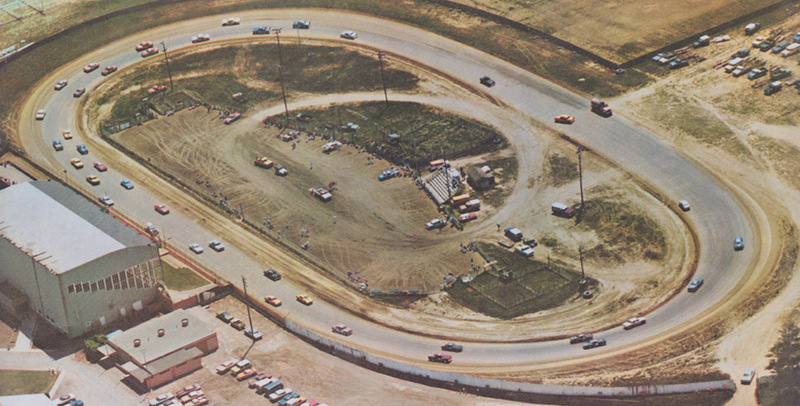 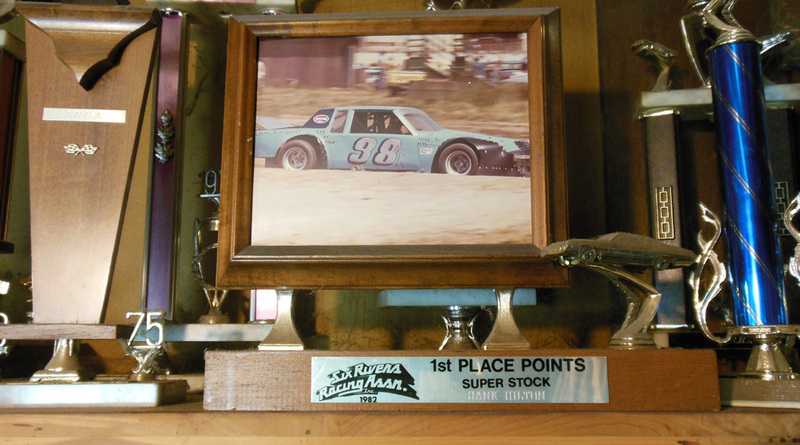 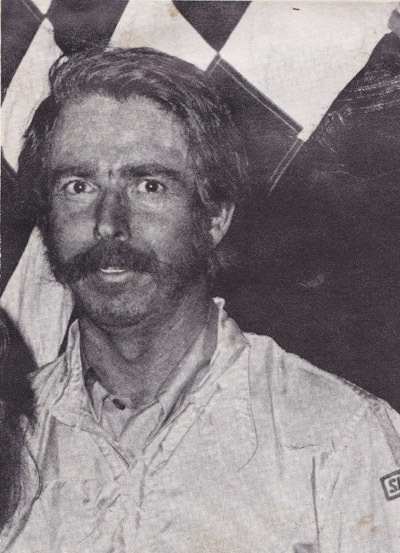 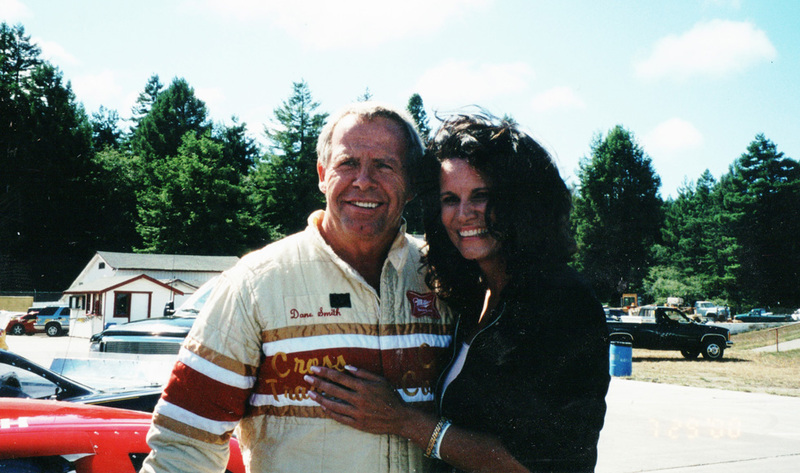 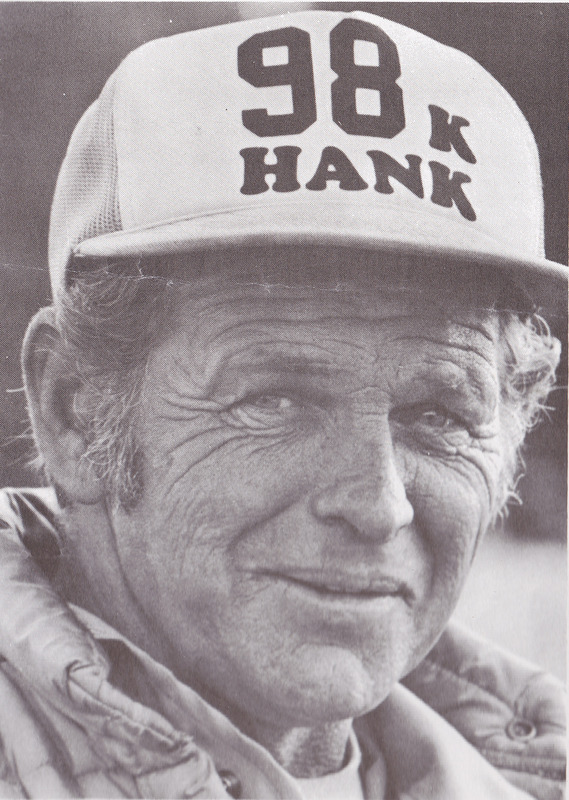 In July 1985 Dane won the Dirt Classic at Redwood Acres in Eureka. 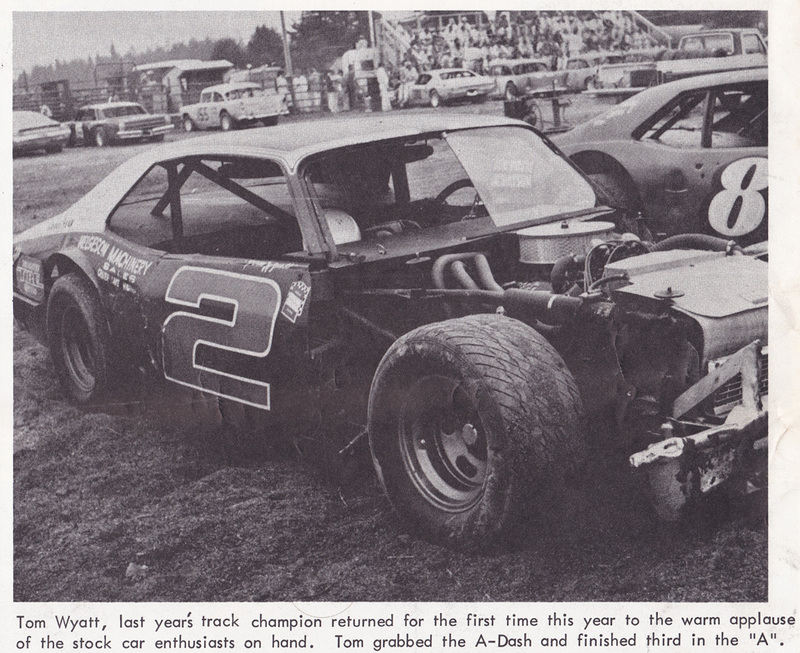 On Day One he broke the front end going for the lead. 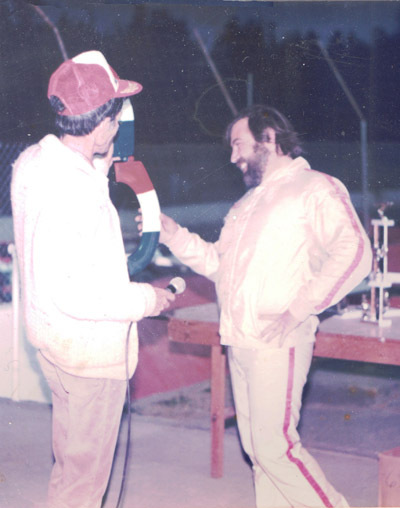 On Day Two he set a new track record, and won the 40 lap feature. 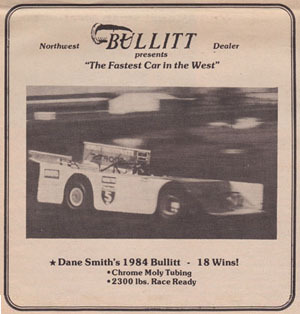 At the Fall Classic at Redwood Acres later that year, Dane held the track record going into the race, set fast time, and led the 30 lap feature wire to wire. 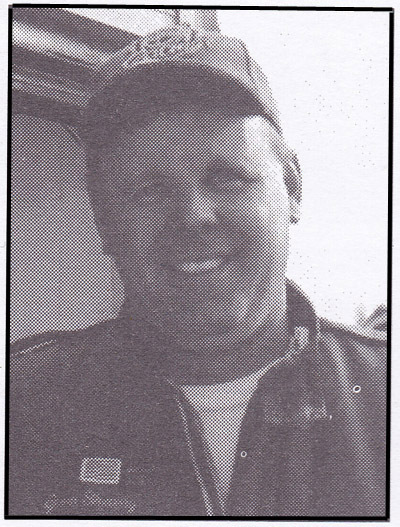 “Vern Gilmore was my crew chief and I think that one year we won 32 out of 36 races or something like that”, Dane says. 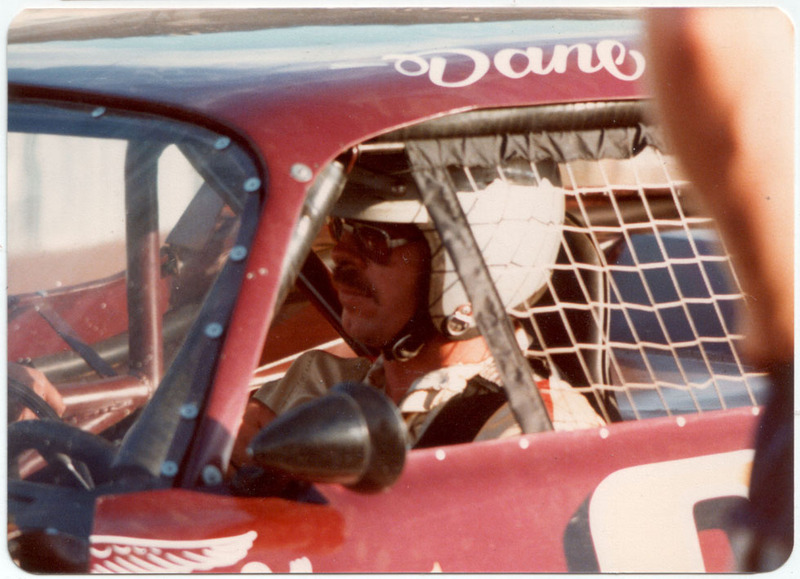 When pushed further, Dane said the seat of your pants feel, the quick reflexes; that skill known as ‘car control’, is just hard to explain. 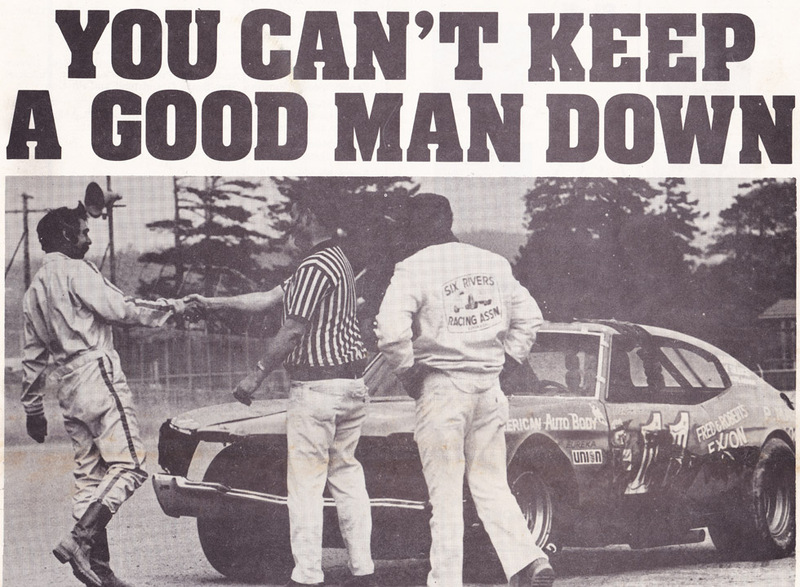 You either have it or you don’t. 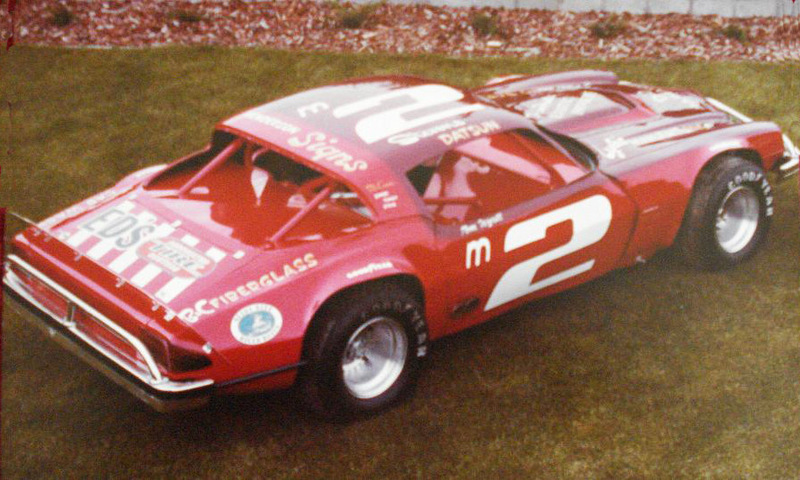 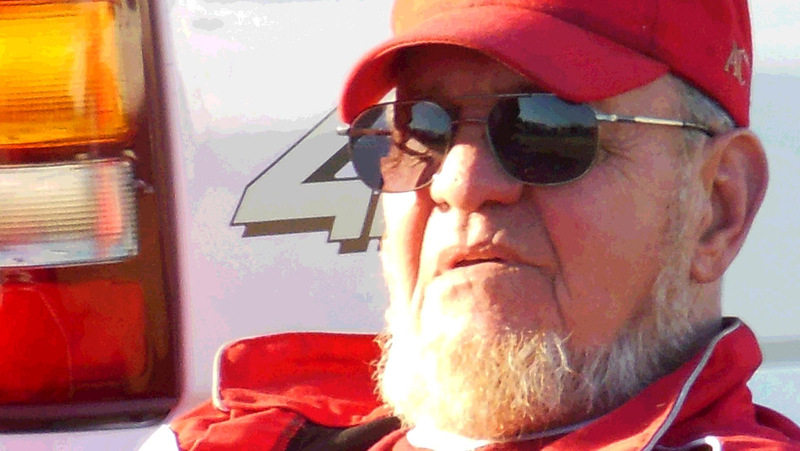 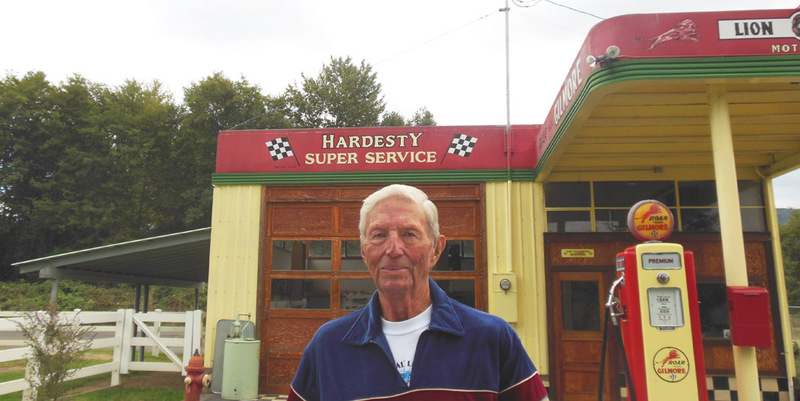 Dane drove a number of paved track late model cars for different car owners in the late 80s and 90s, as well as fielding cars of his own. 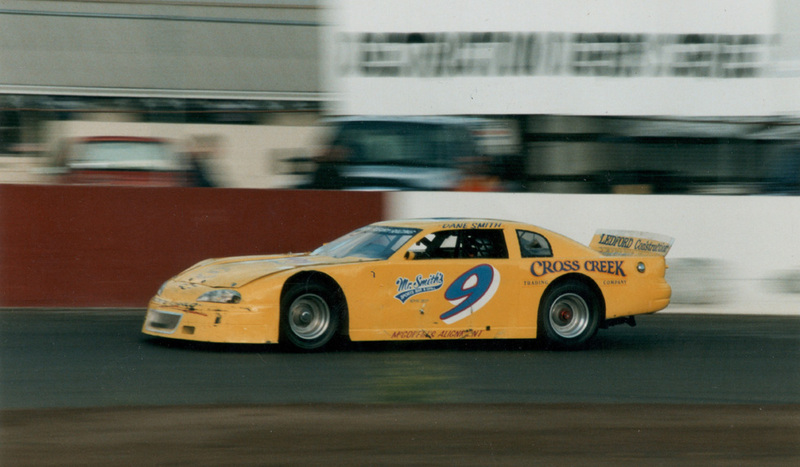 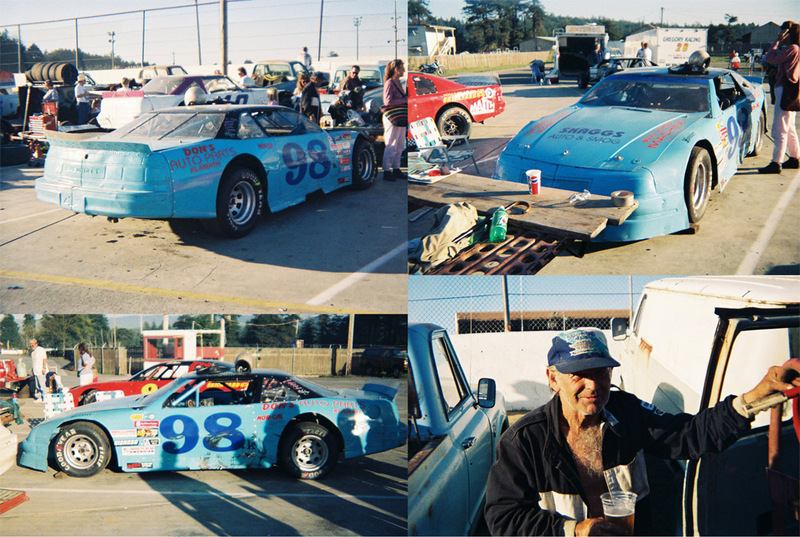 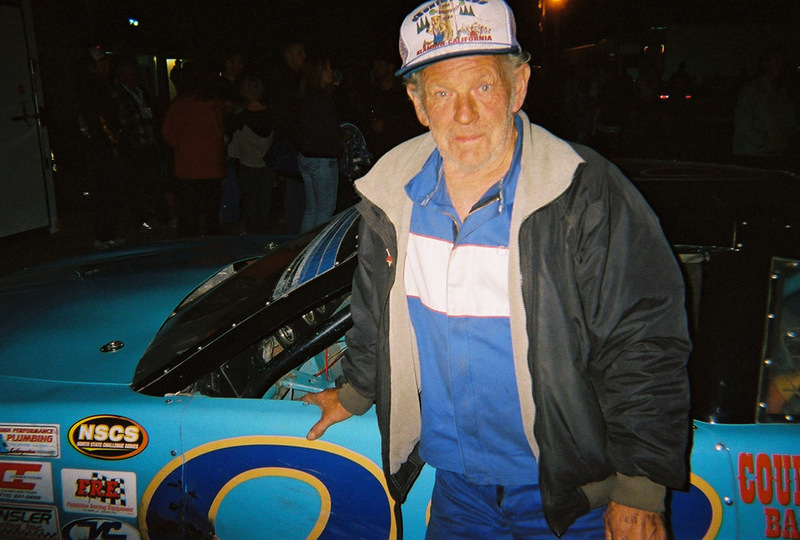 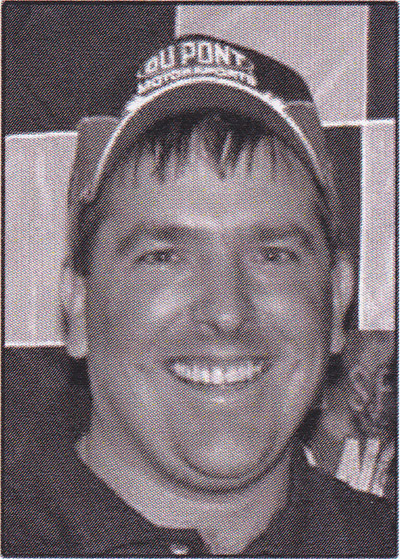 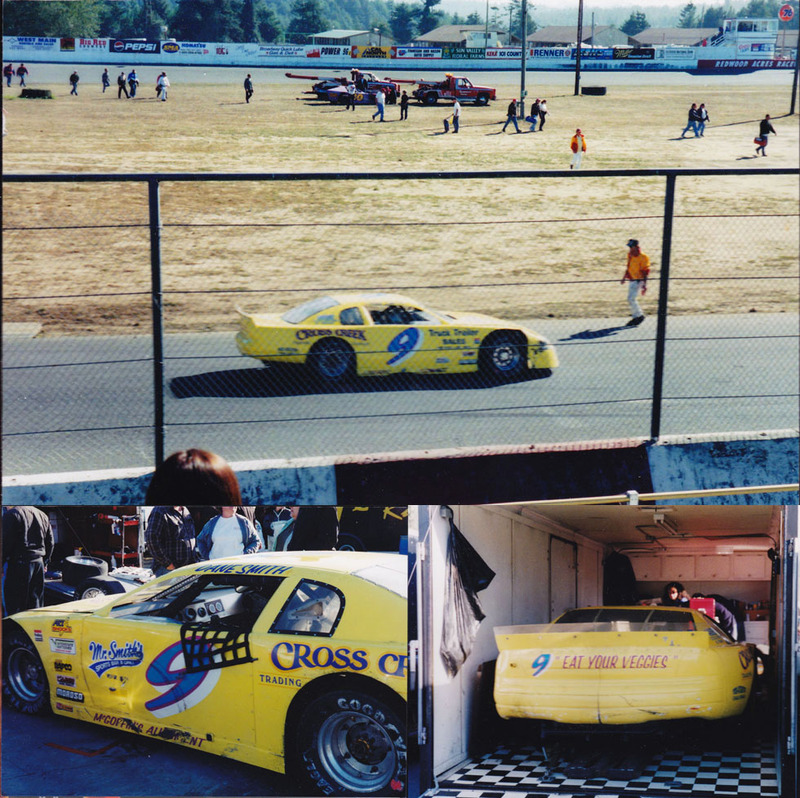 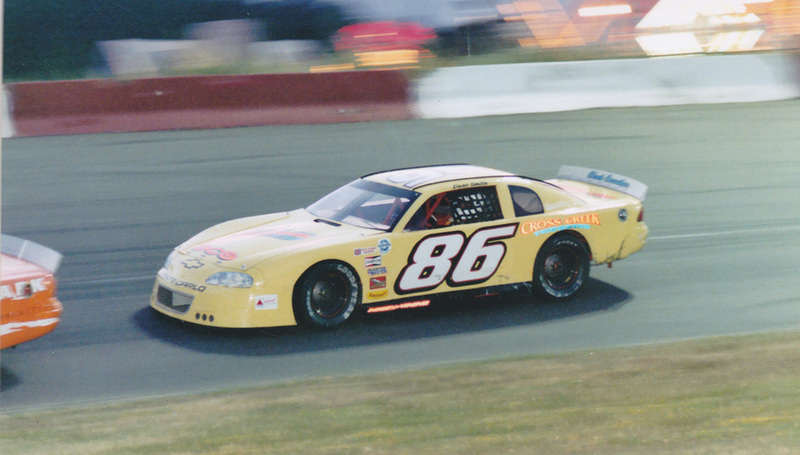 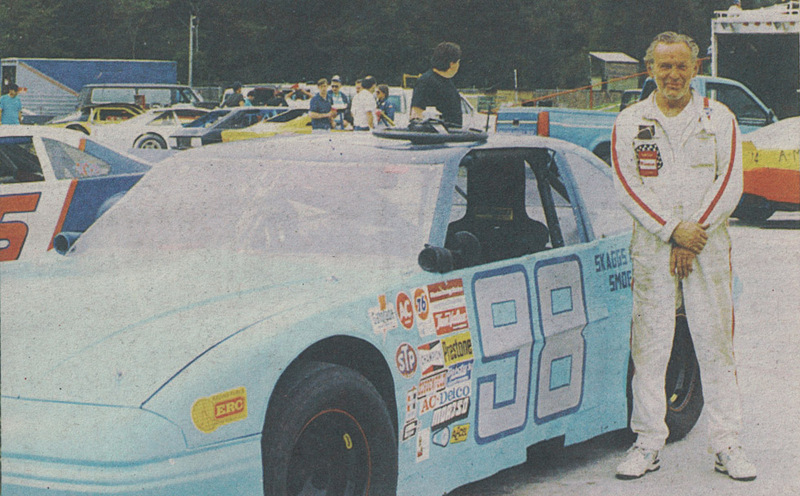 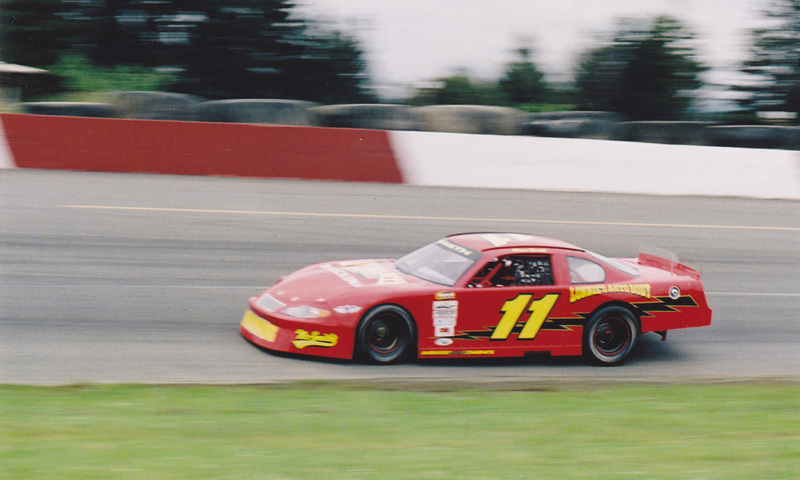 In 1999 Dane drove the Cross Creek sponsored #9 car. 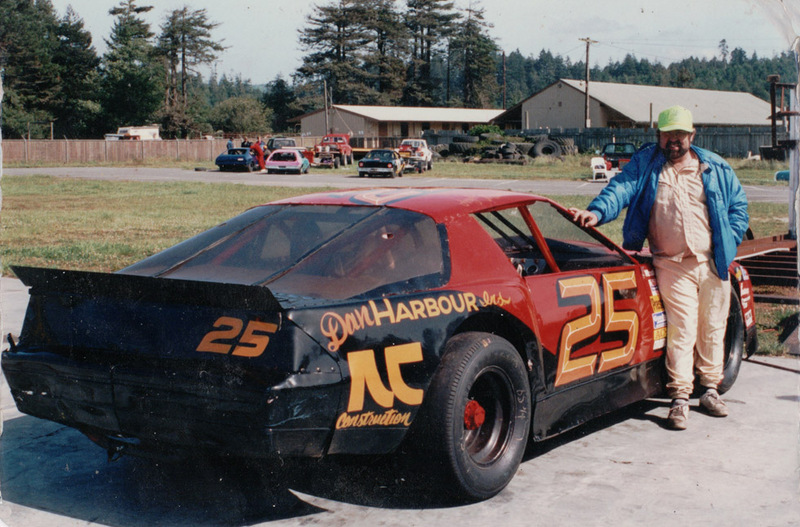 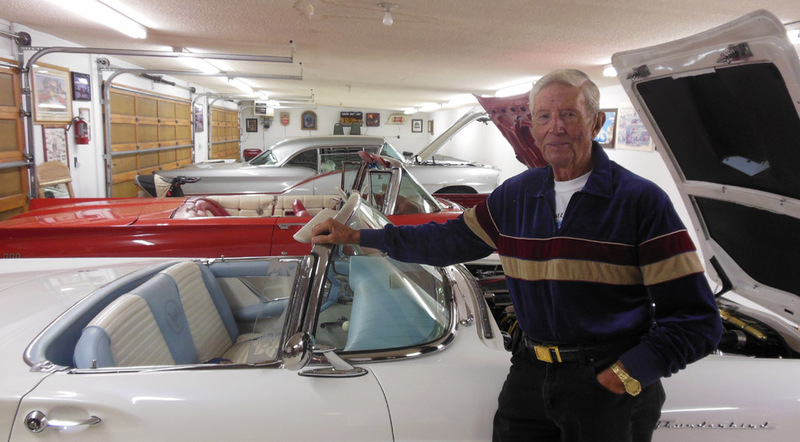 “I drove that car for Ed Fleury. 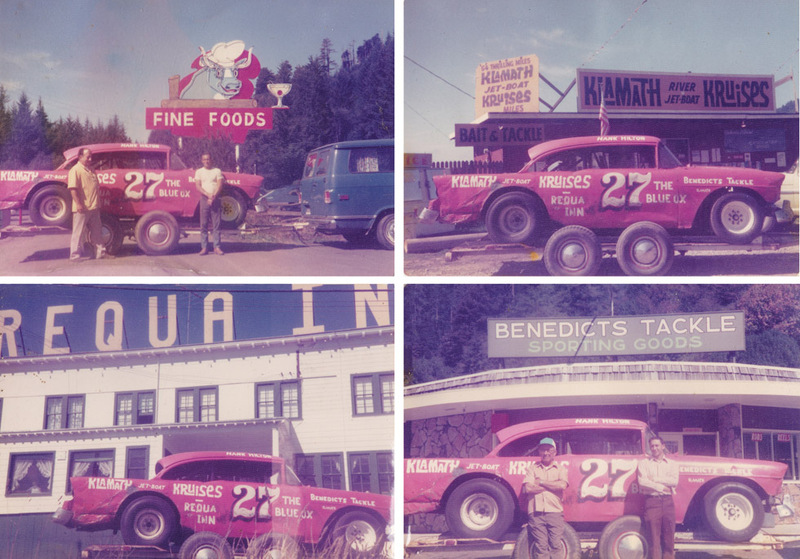 We won a Carson City race.” On the back of the car was painted the useful advice to trailing drivers: Eat Your Veggies. 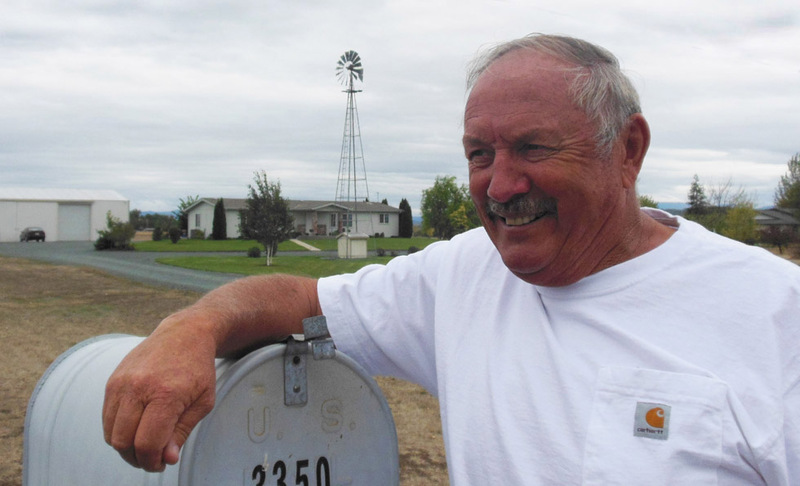 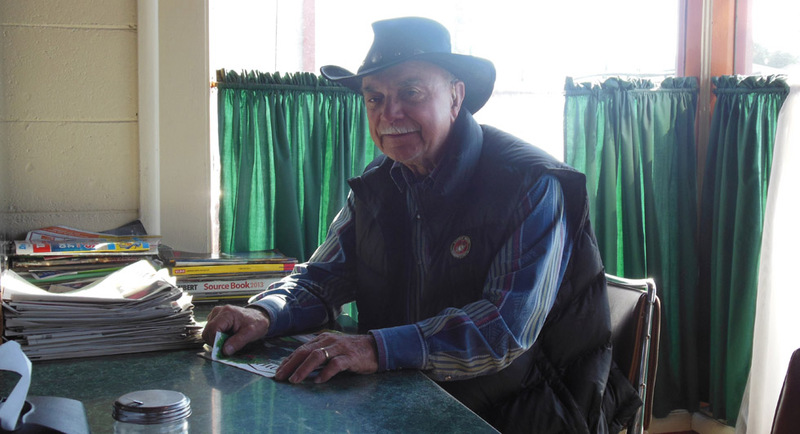 “That was from Cross Creek Trucking – they hauled produce. 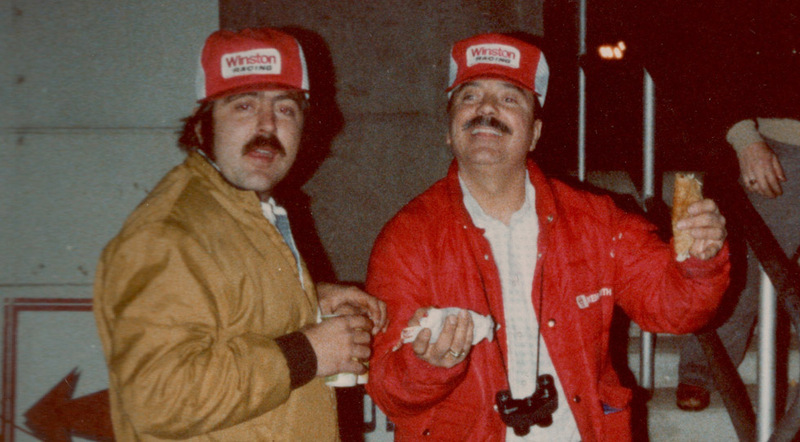 That sure as hell wasn’t my diet”, he says now, laughing. 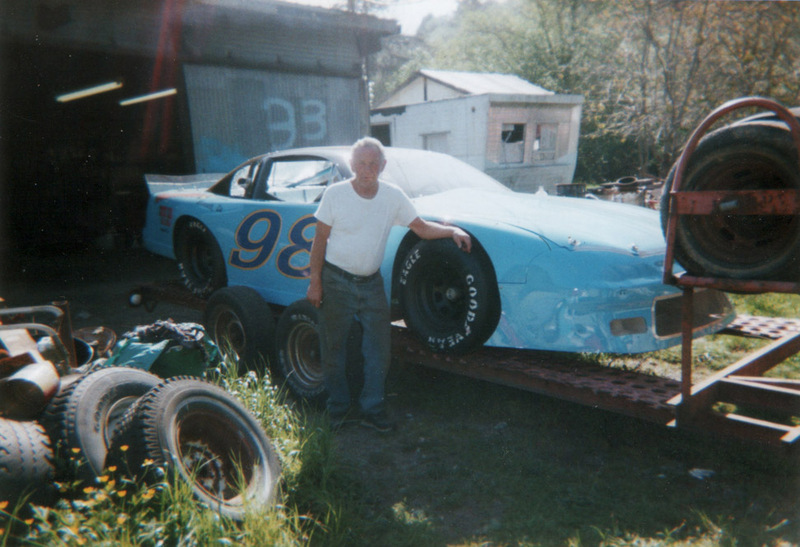 Dane’s car he raced in the North State Challenge Series in 2005. 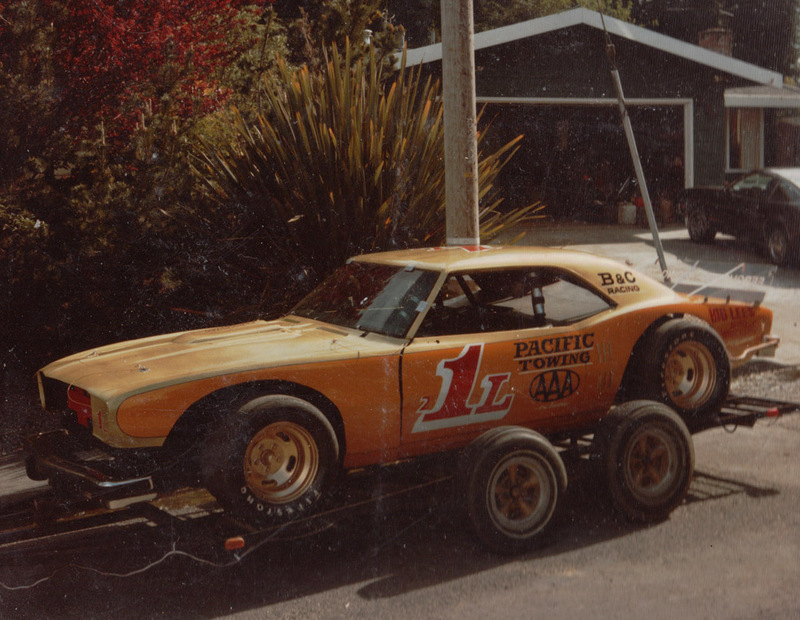 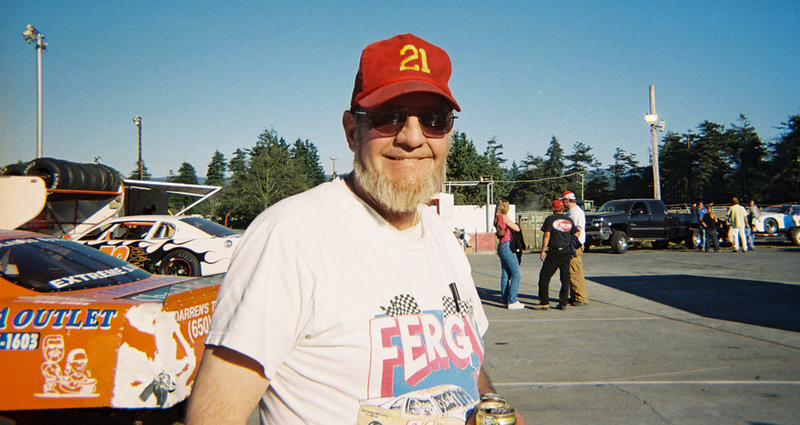 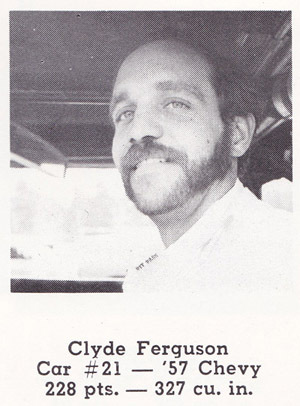 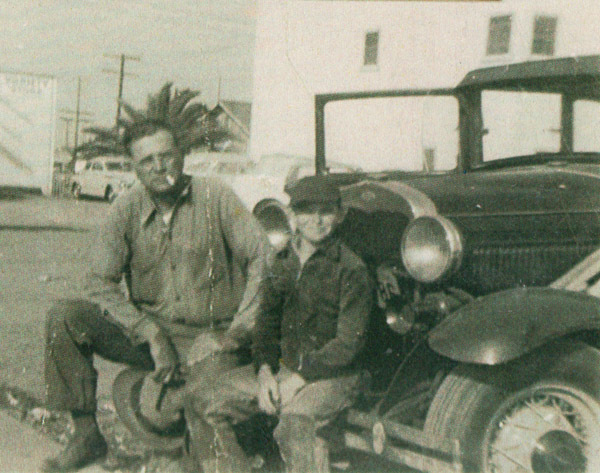 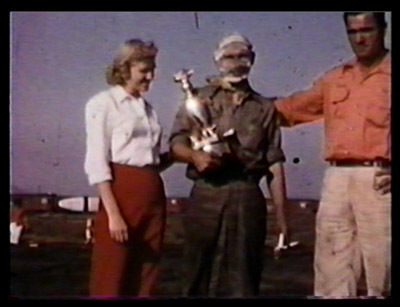 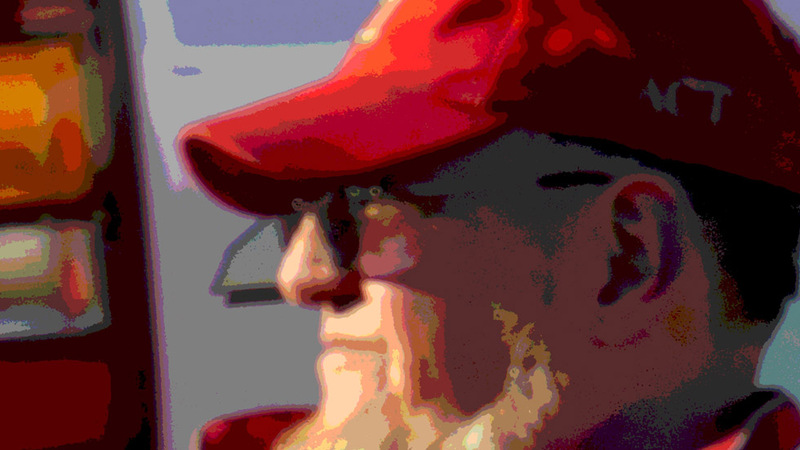 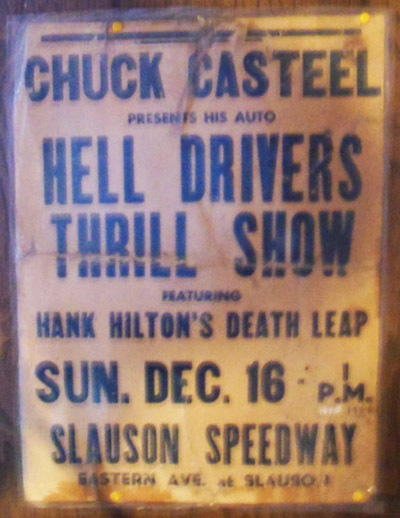 By July of that year word was he had sold the car with plans to go back to a dirt car with a schedule of occasional races in Oregon. 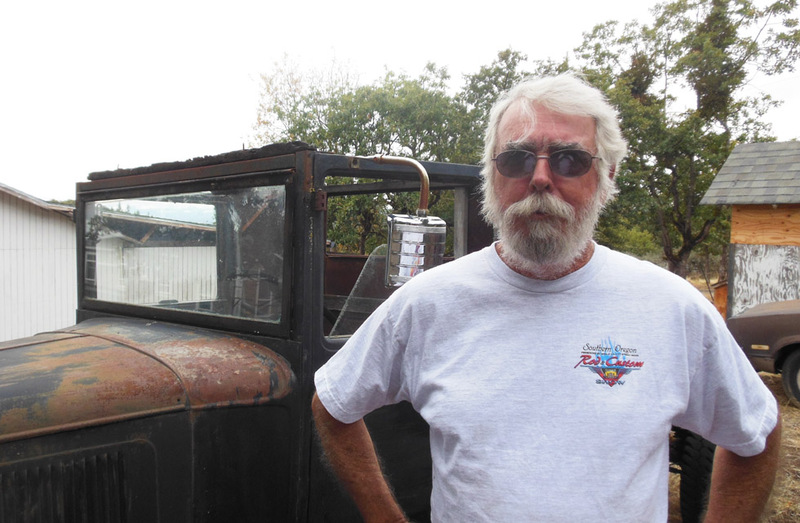 On a Friday night in October 2013, Dane Smith was eager to get out of the kitchen where he was the cook at his bar & grill and get to his shop in an industrial section of Medford. 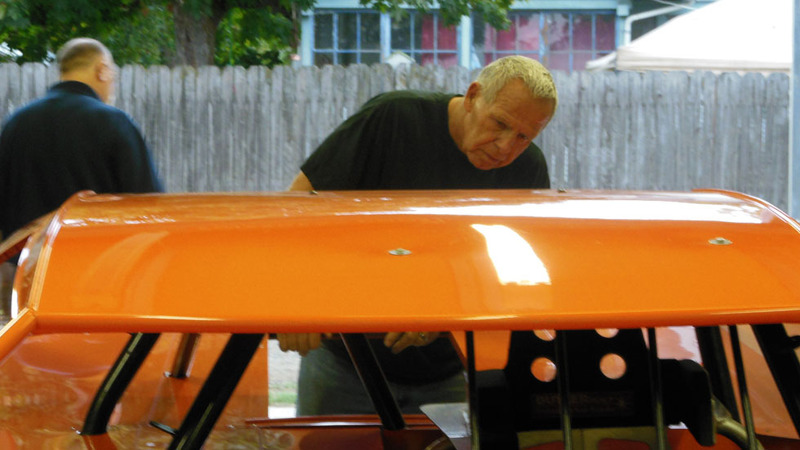 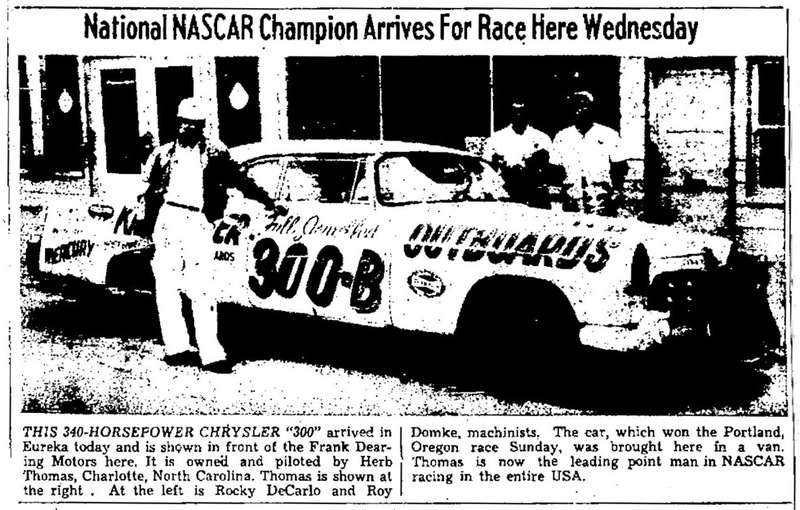 His new modified was being delivered from car owner Don Roemmer. 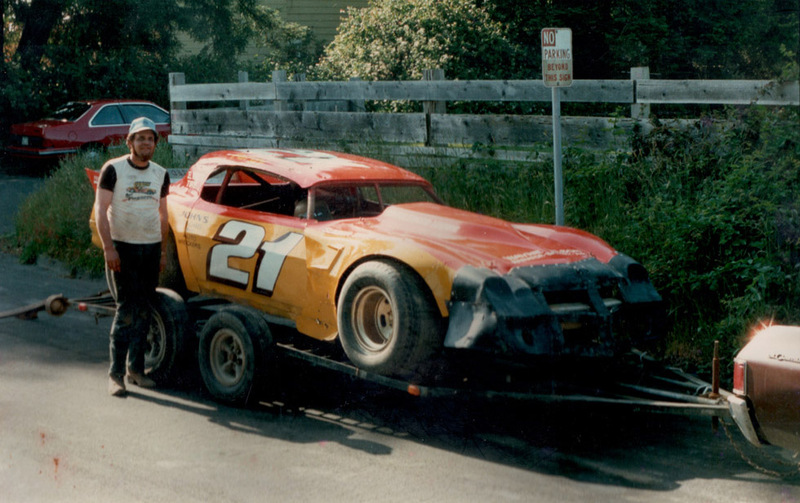 The last car he had suffered from “too much motor”, and after an absence from the track, this was the first step of getting back into racing. 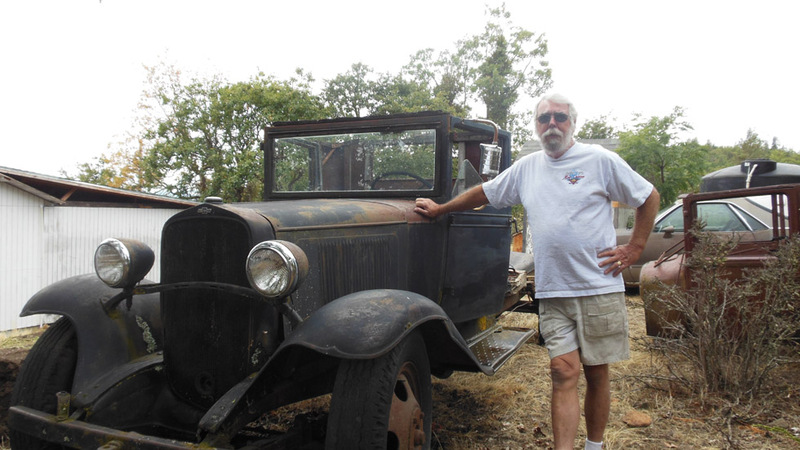 “I want to see if I still have it”, he says. 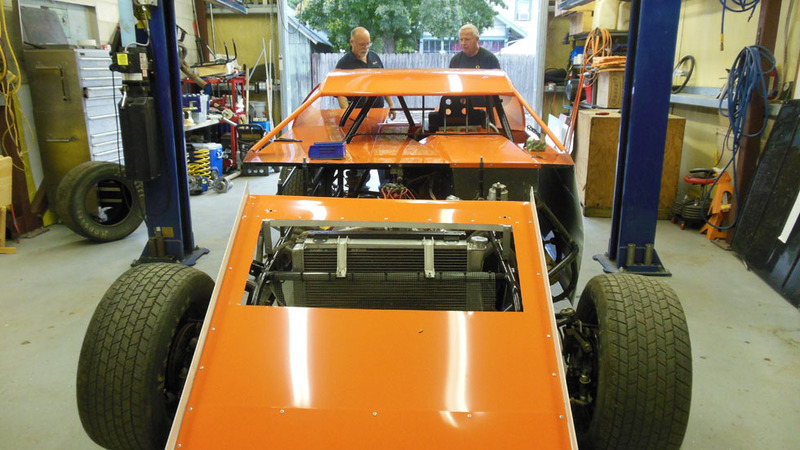 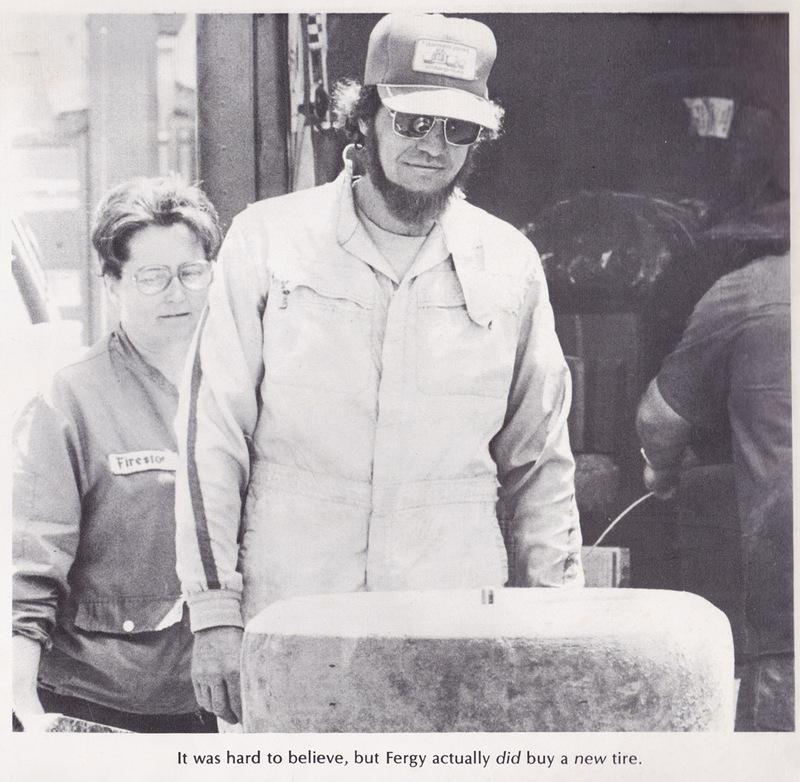 As the new car is backed into the shop, Dane comes back to his office and reports “It doesn’t have any bumpers on it, no lettering, the thing is pretty ugly.” His mechanic, Joe Davison, then begins the process of tearing it down piece by piece, adding new parts that will be legal for the series they will be running in. 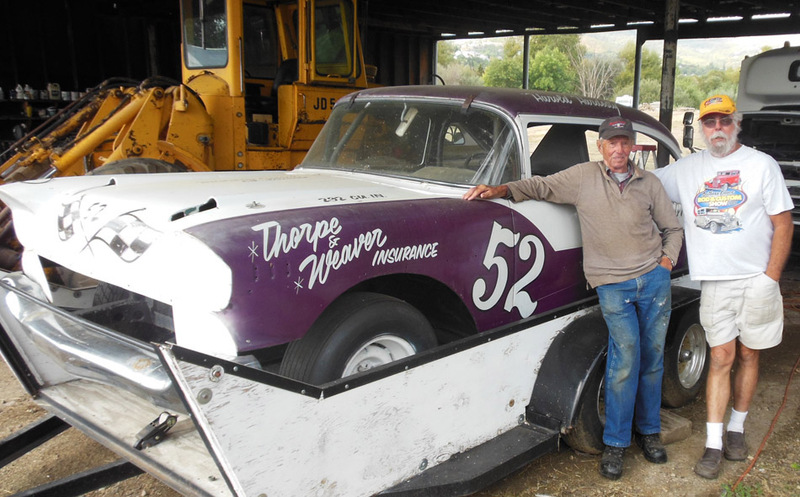 “We are planning on taking it to Las Vegas”, Dane later says. 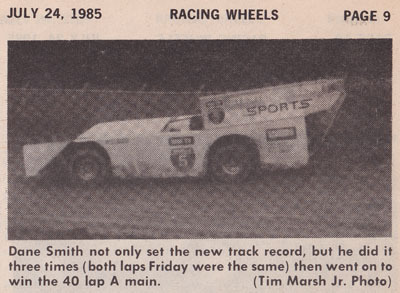 One thing is for sure, on a given night on a dirt track, Dane Smith has still got it. 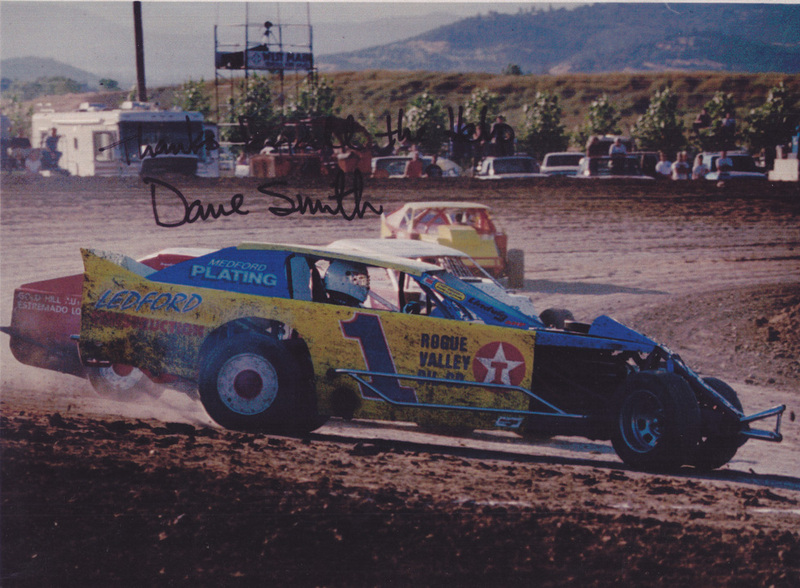 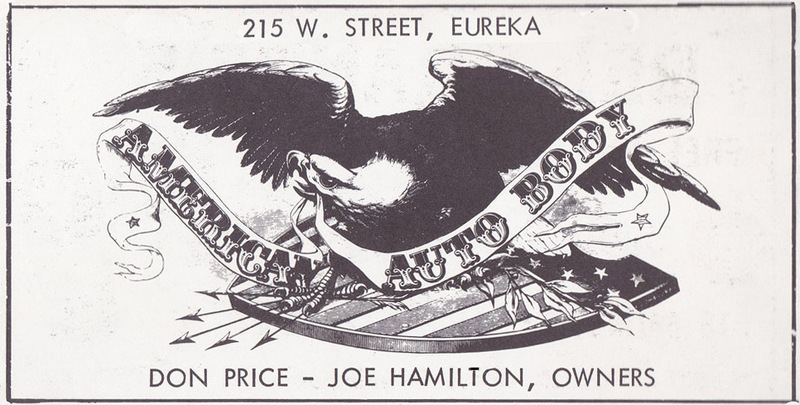 I want to thank Dane Smith for his kind support and for opening up his home and his shop and office for access to a great collection of photographs and racing history. 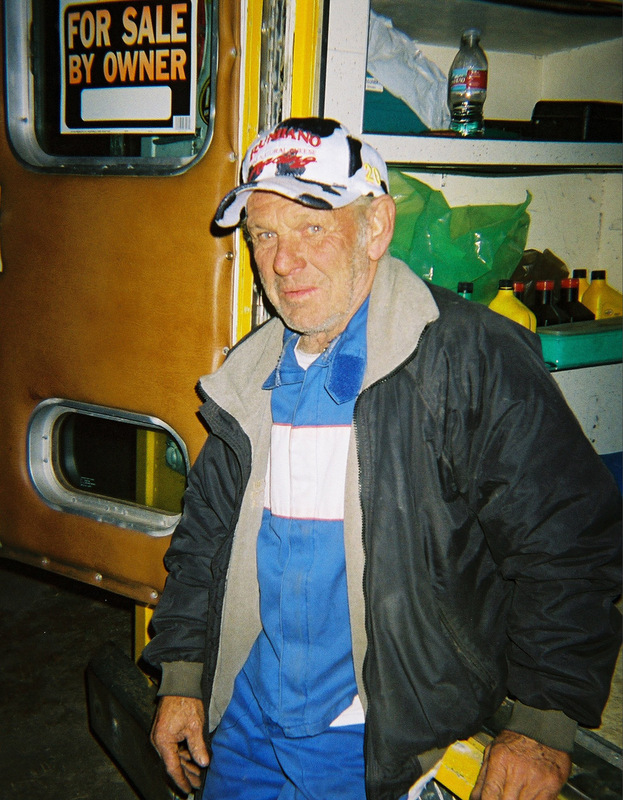 And he personally cooked me a fine burger. 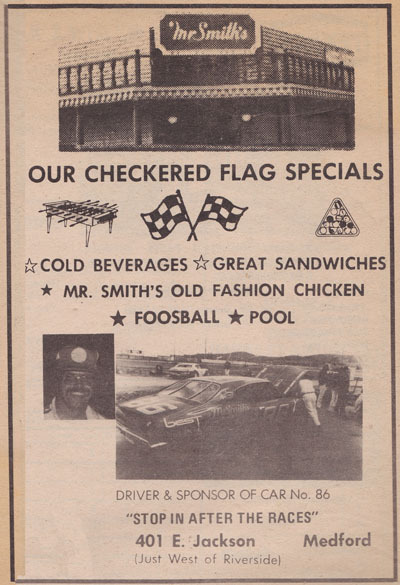 If you are in Medford drop by Mr. Smith’s Bar & Grill at 401 E. Jackson street. 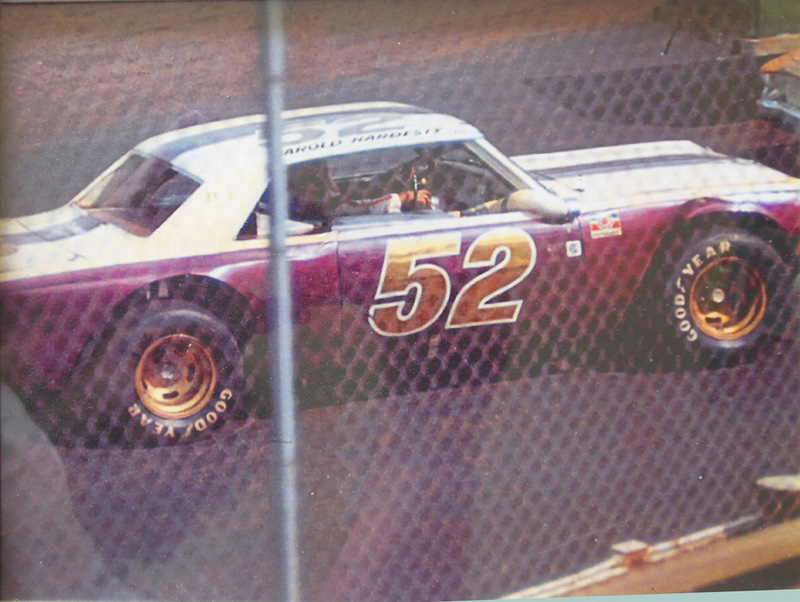 There is a nice collection of portraits of historic Medford athletes on the wall, including cars driven by a racer I don’t hesitate to call an athlete, Dane Smith. 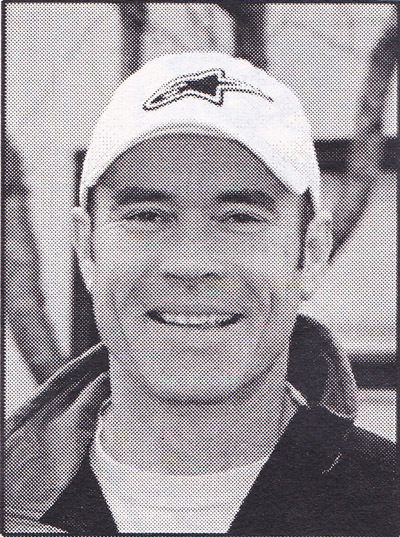 And Dane might even be in the the kitchen cooking for you.